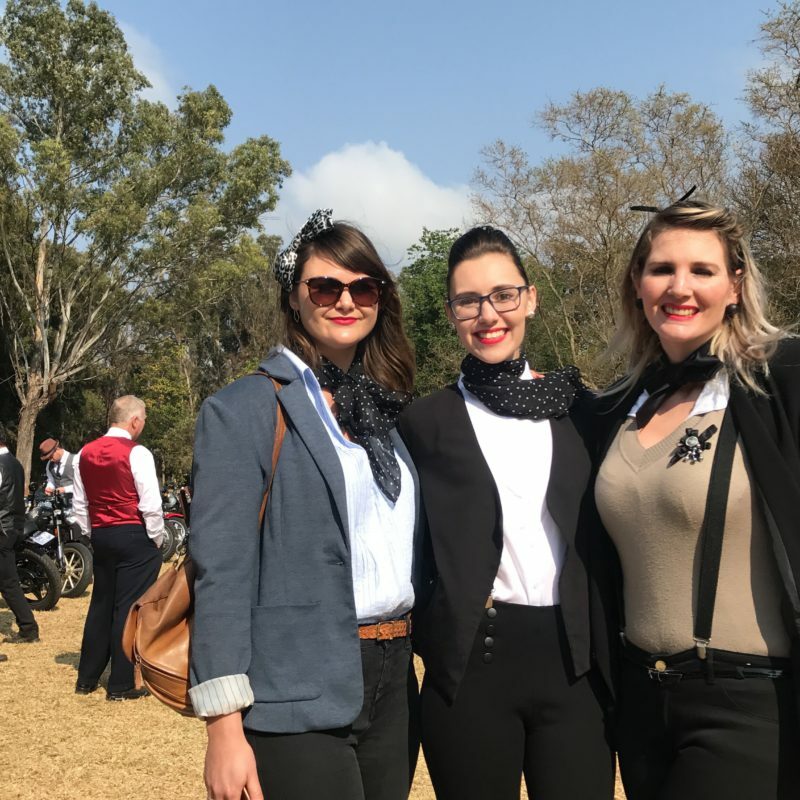 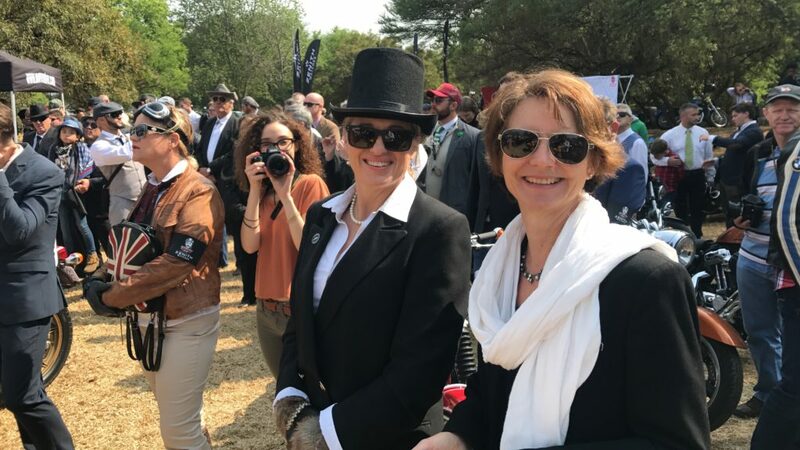 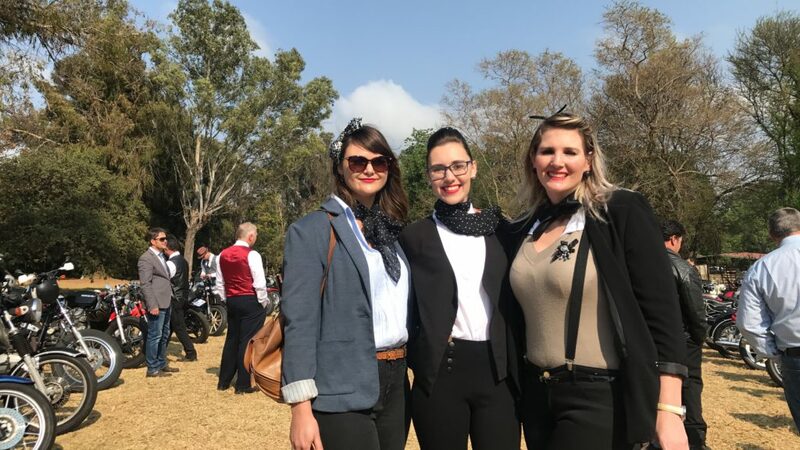 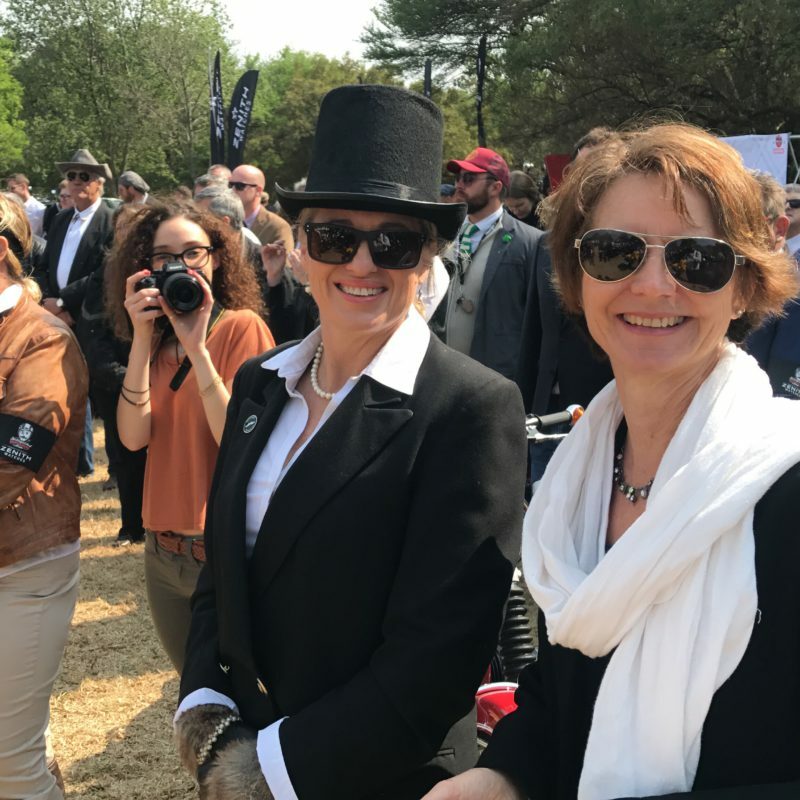 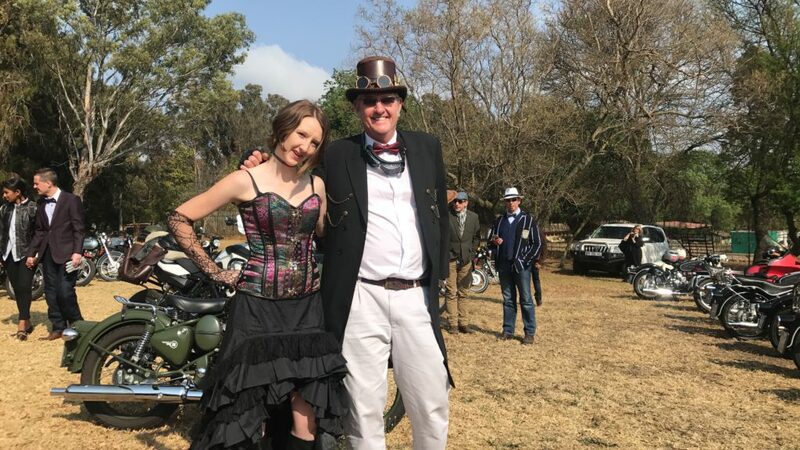 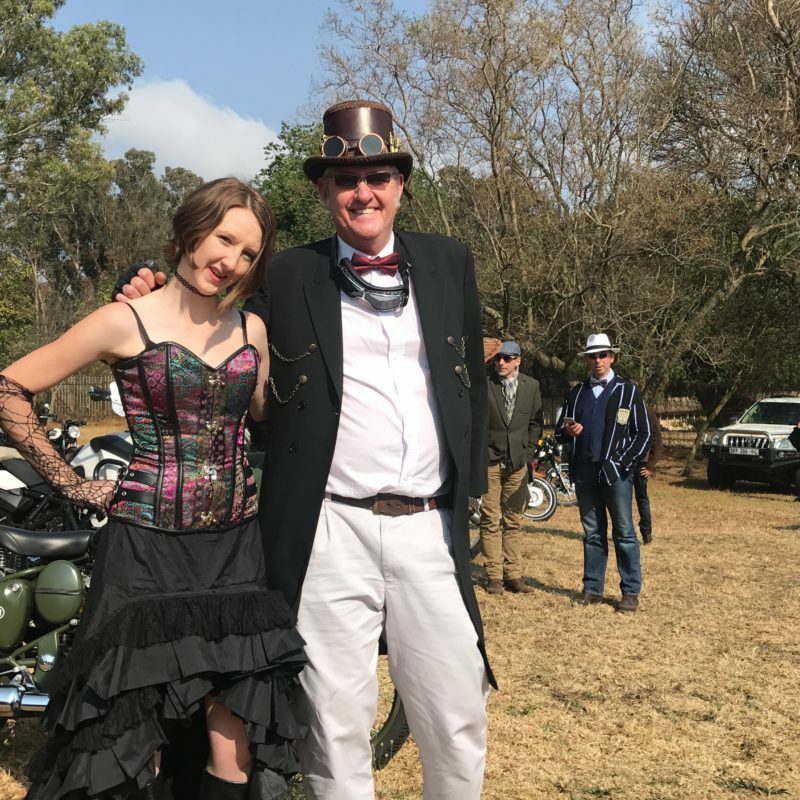 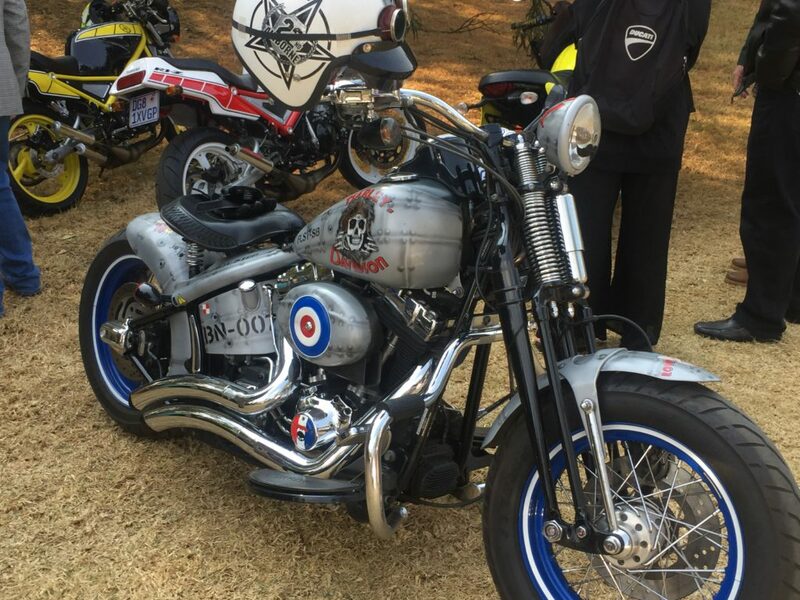 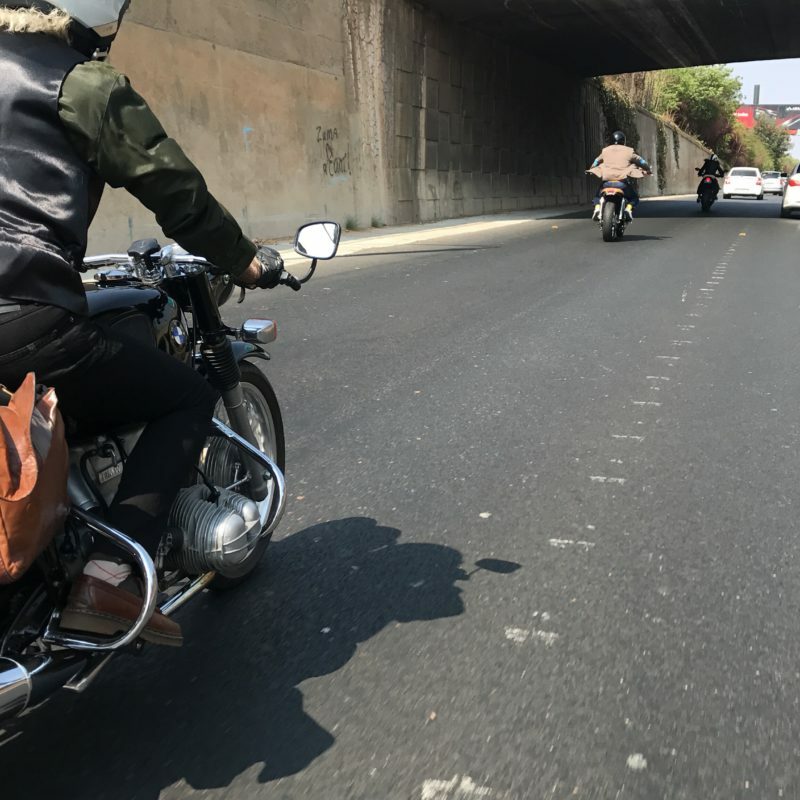 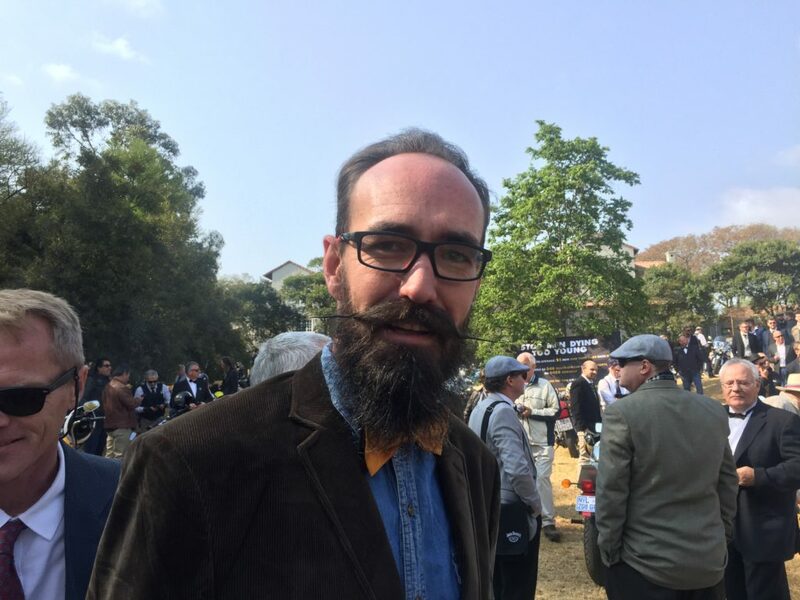 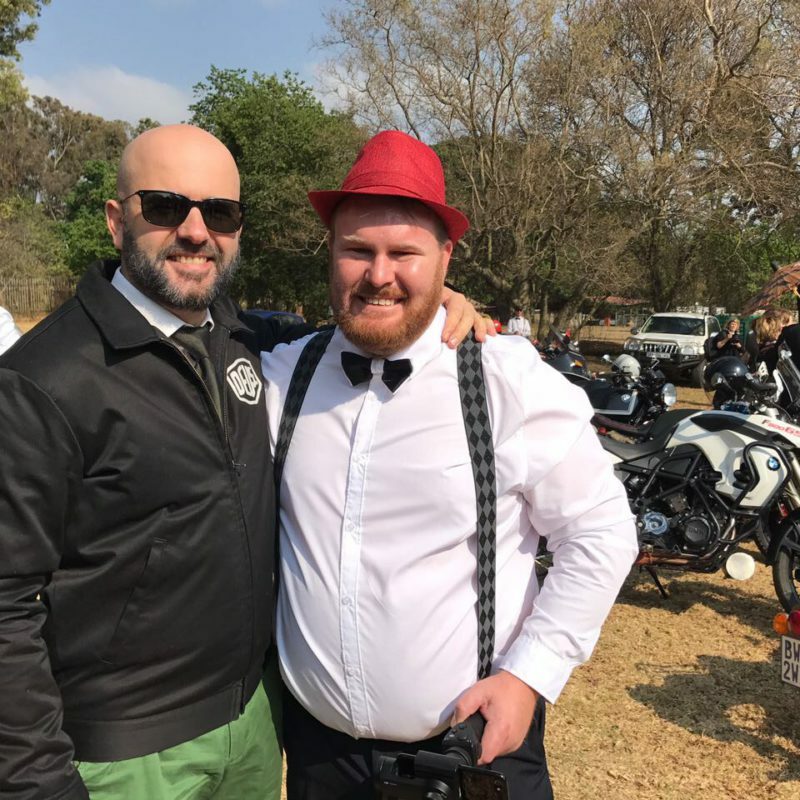 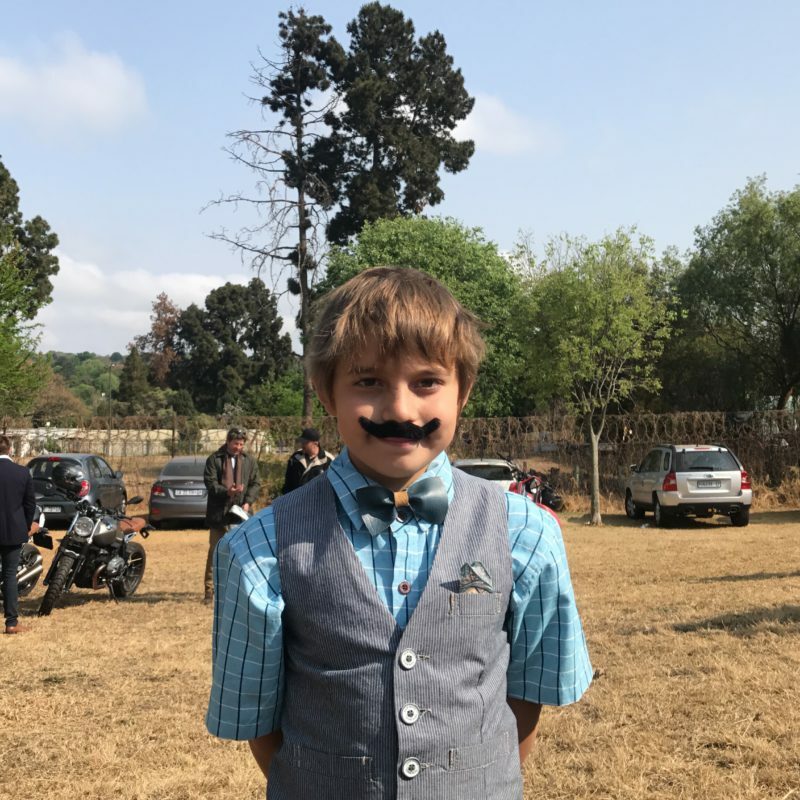 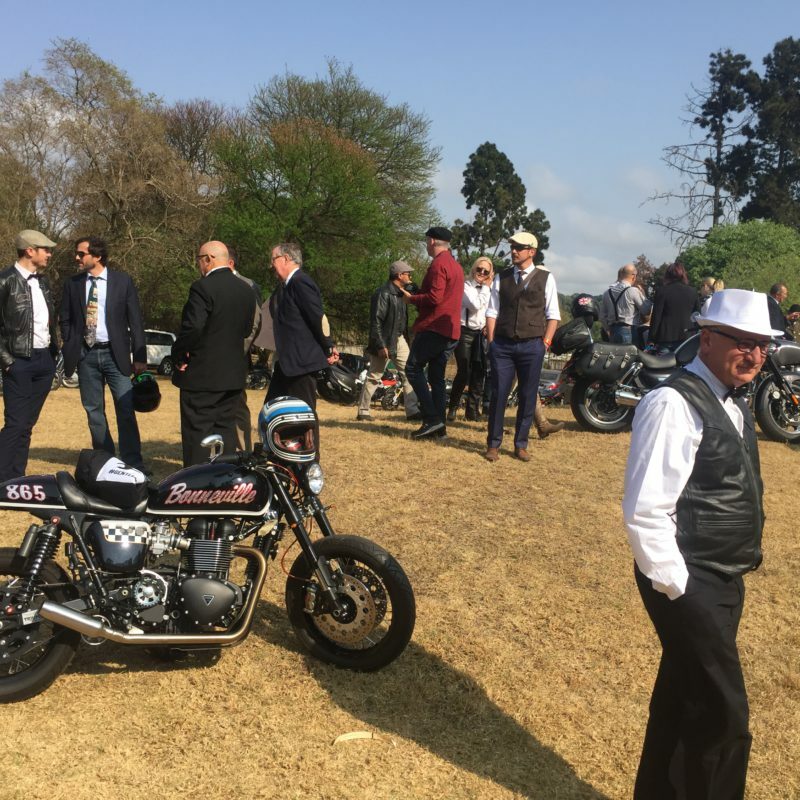 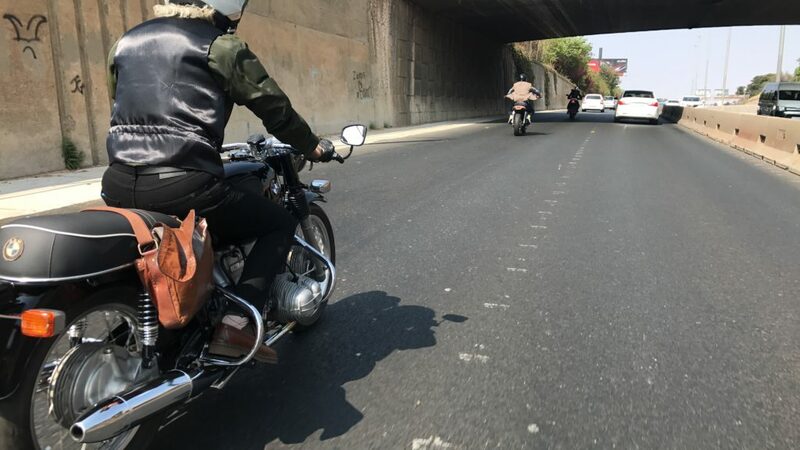 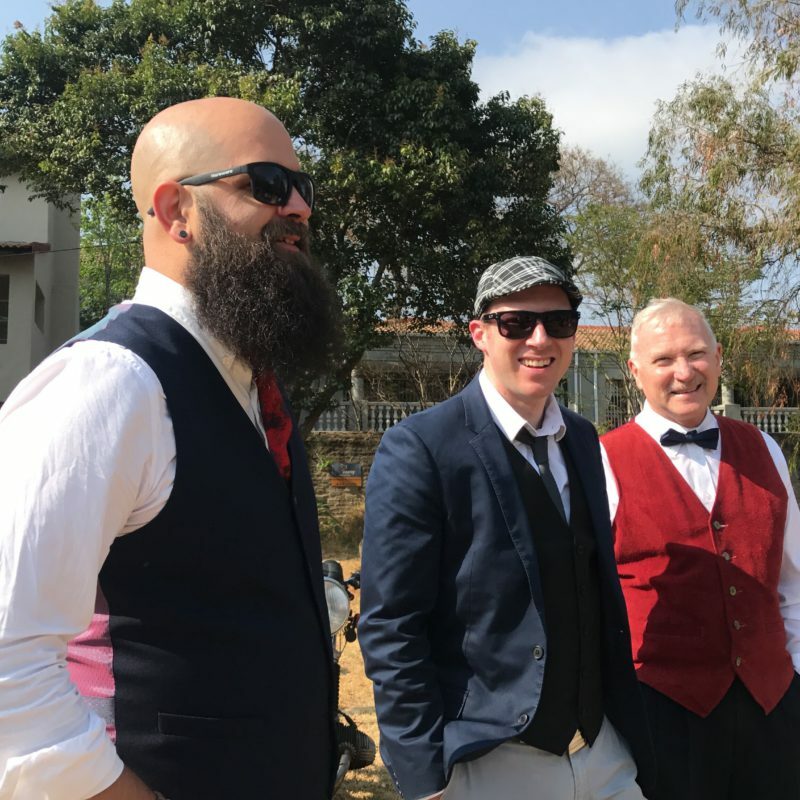 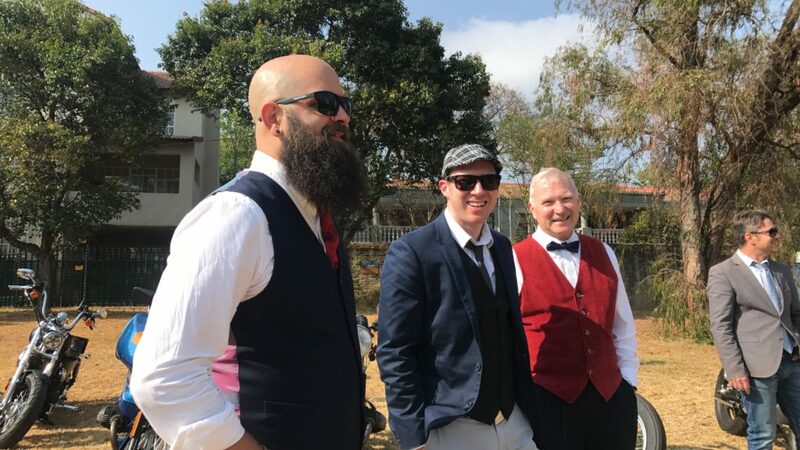 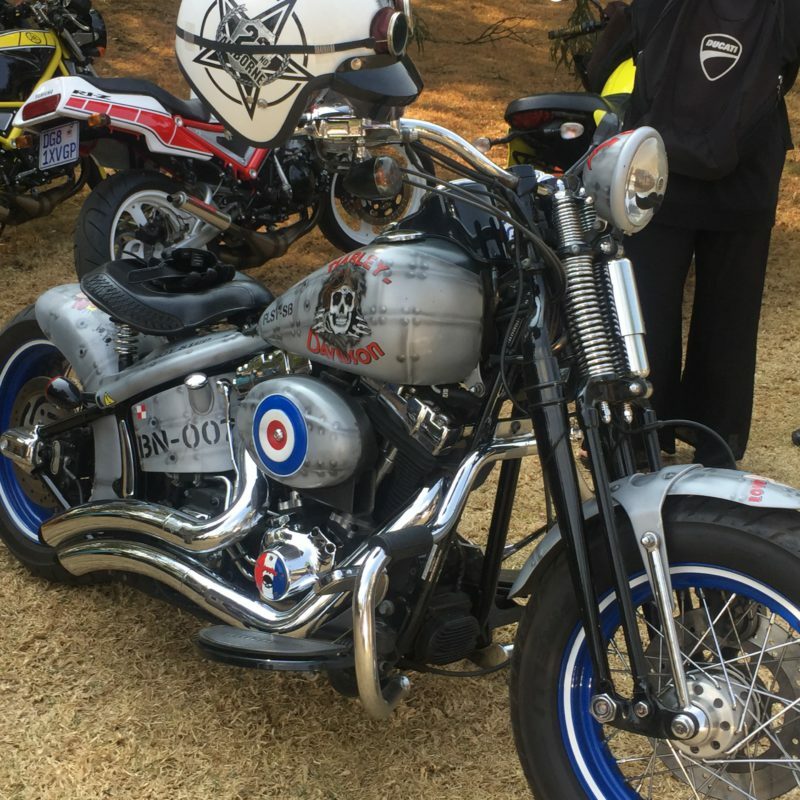 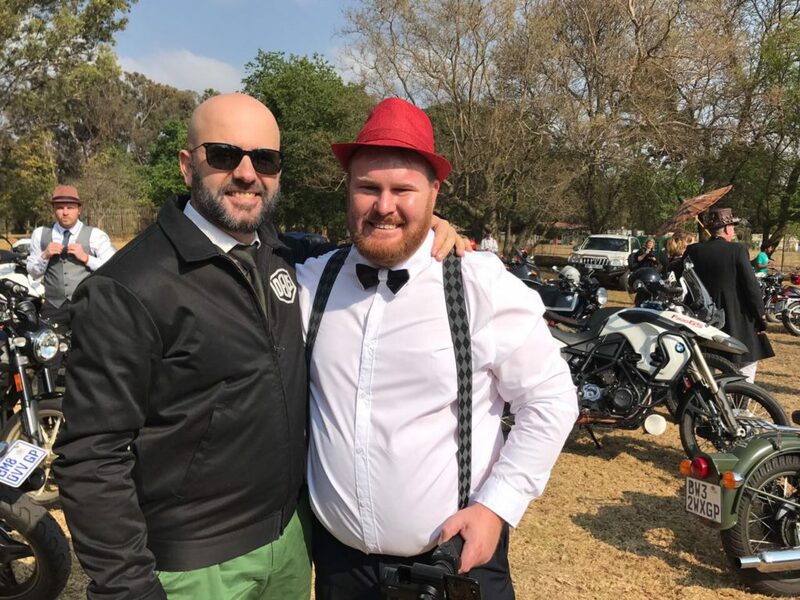 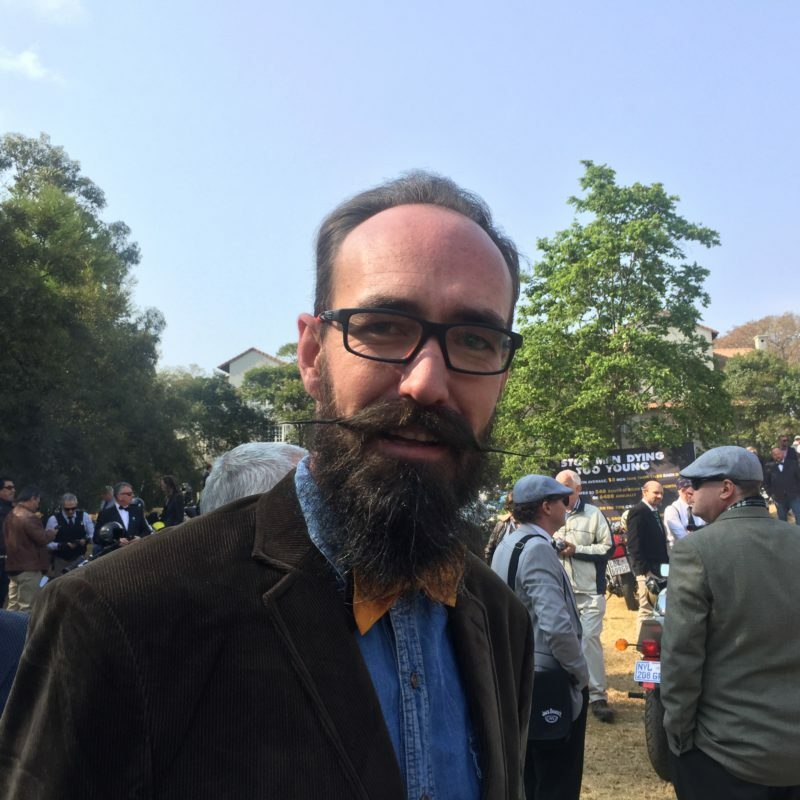 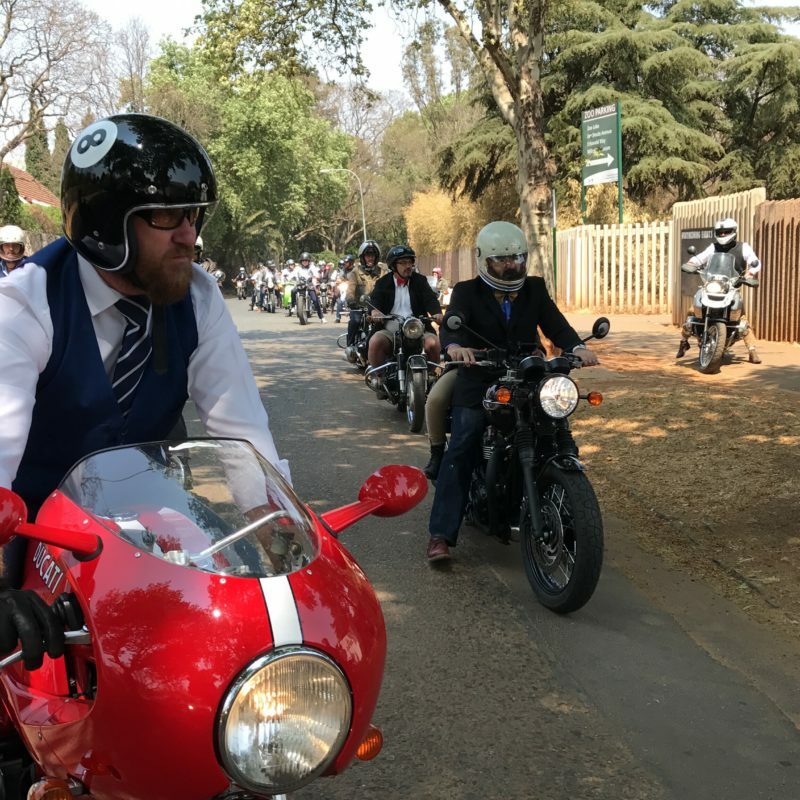 The Distinguished Gentlemen’s Ride is a global event whereby participants dress up in their most dapper outfits and ride vintage or retro-styled motorcycles in a giant, synchronised, fancy-dress mass ride. 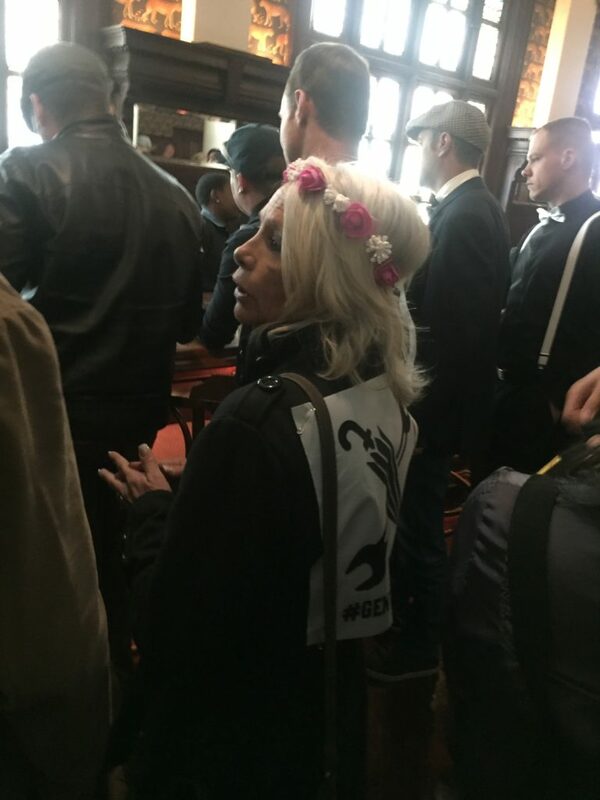 Obviously to pubs. 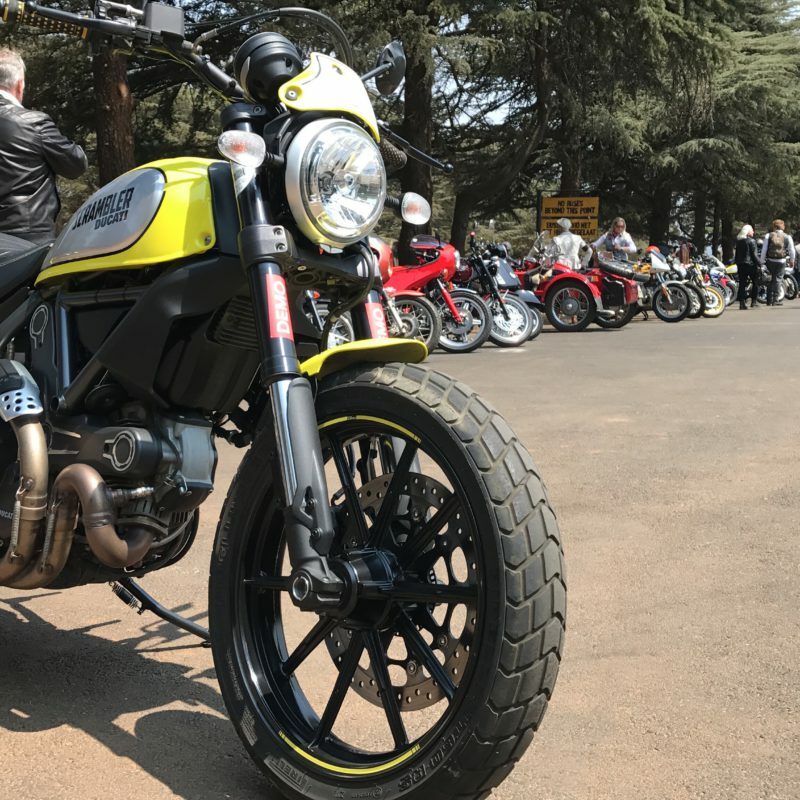 The Ducati Scrambler Flat Track Pro looking good with the stream of DGR behind it. 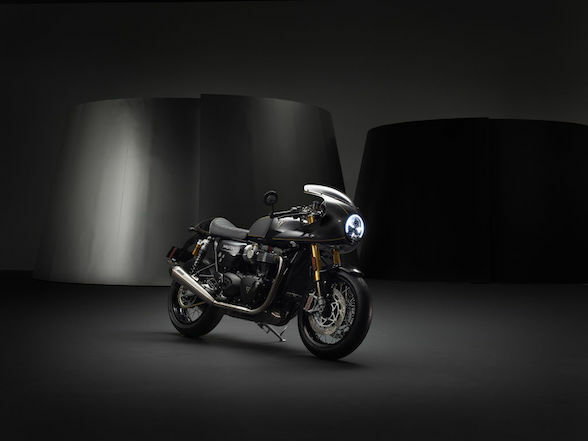 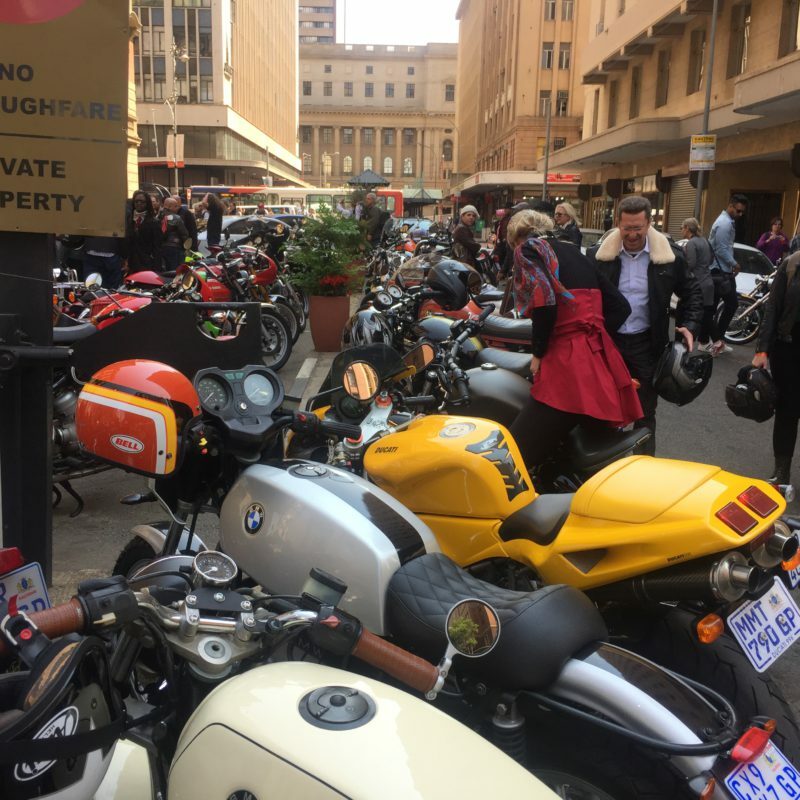 It started in Sydney in 2012, at first to help raise the image of men on motorcycles. 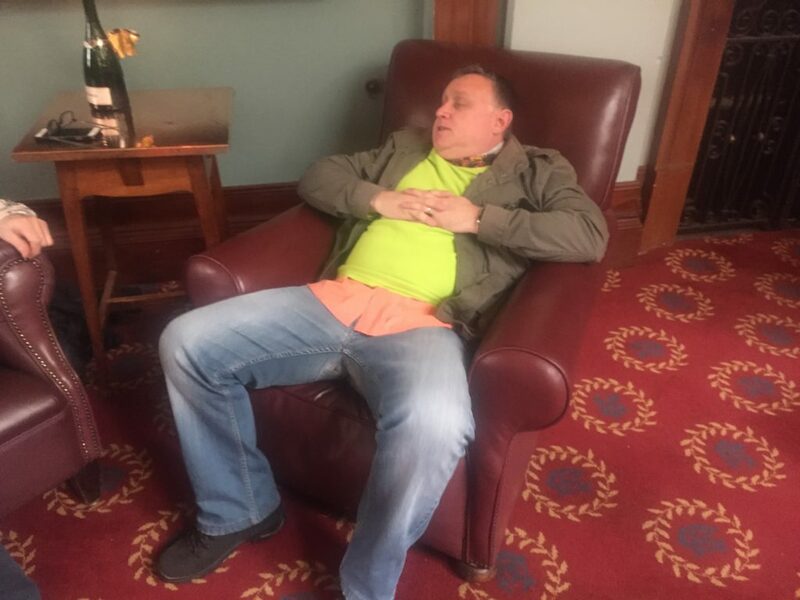 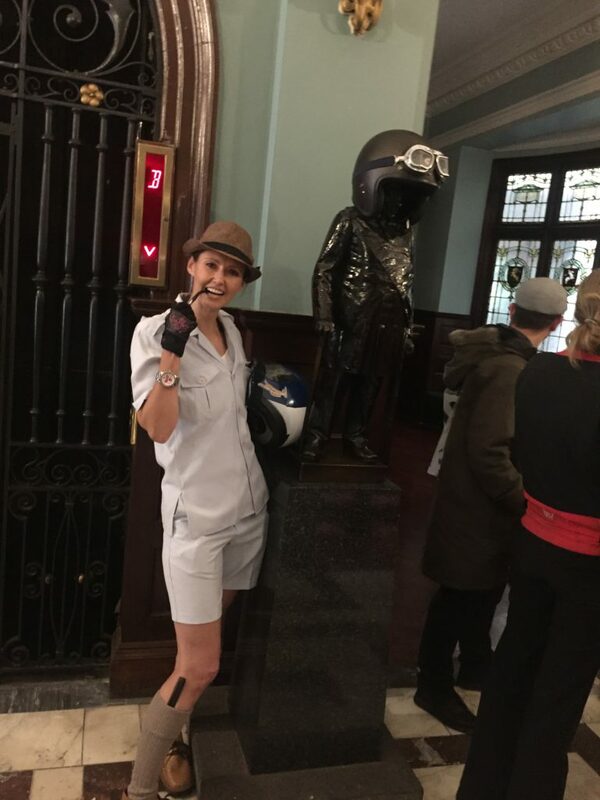 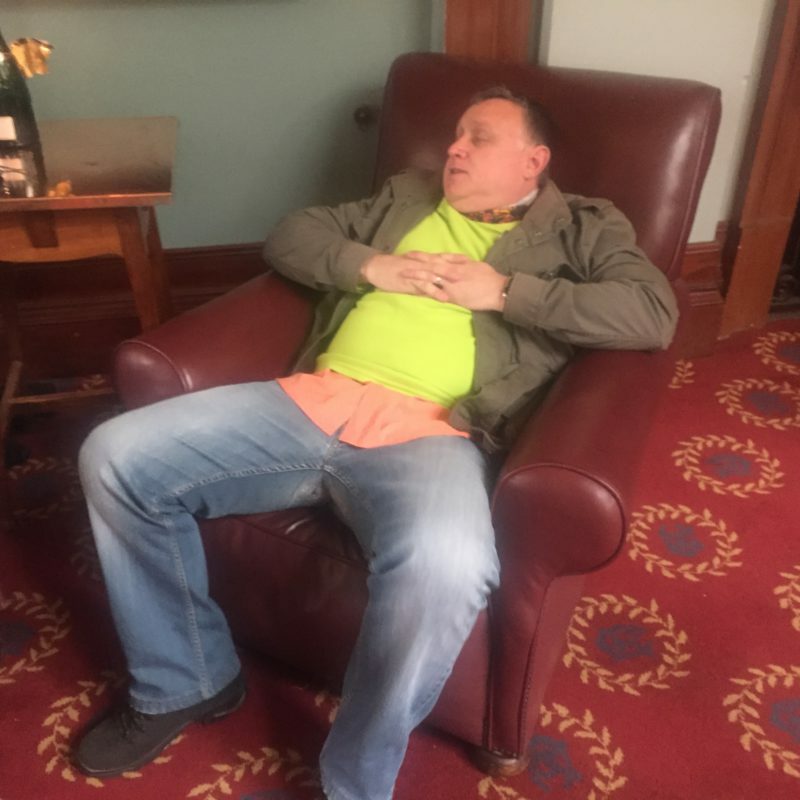 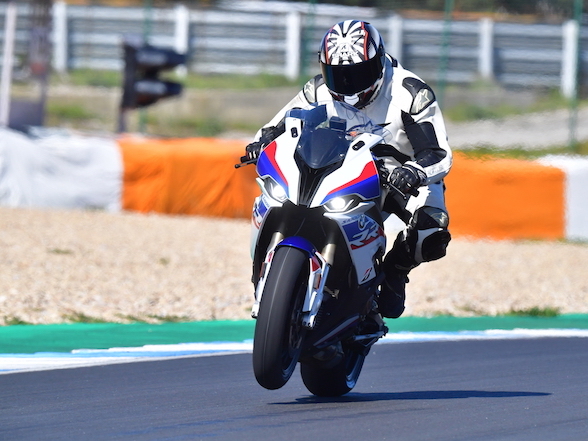 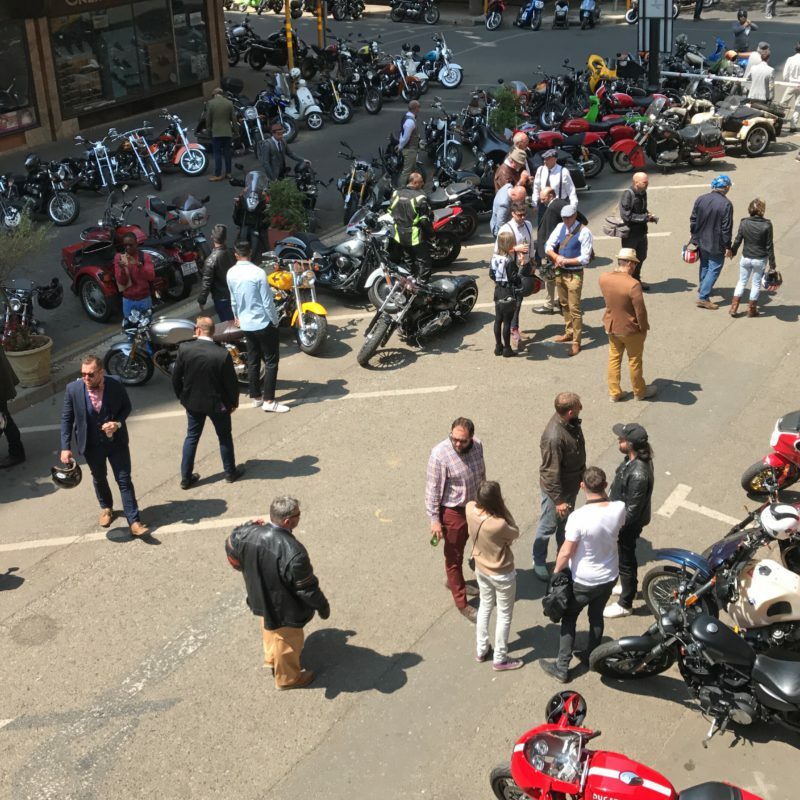 With it being a success, it was decided that the following year’s event would help raise funds for a charitable cause such as, suitably, prostate cancer and men’s mental health research. 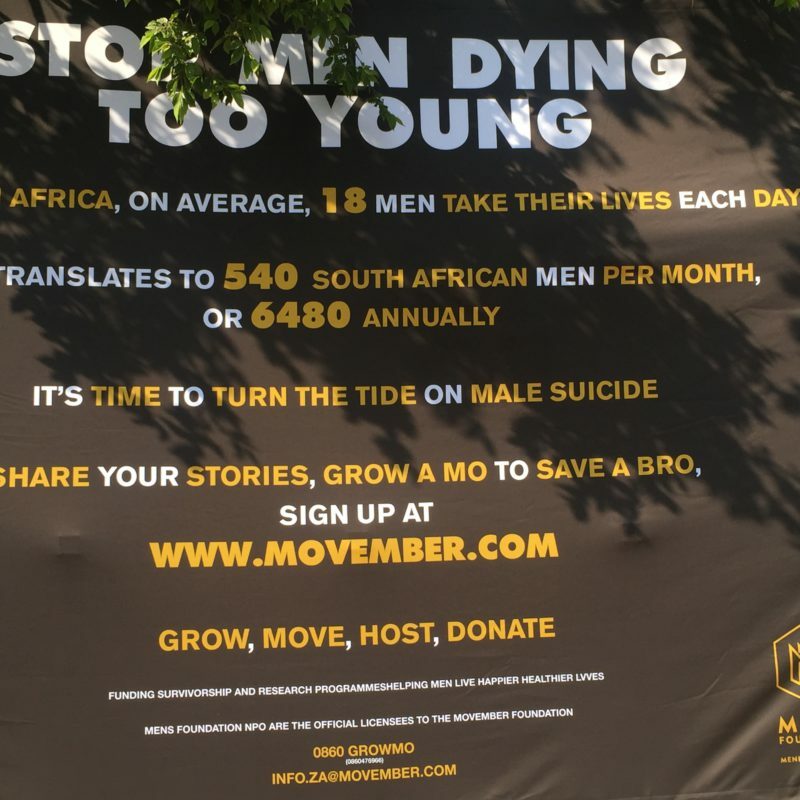 So far this year, the global donation is sitting at 4.4 million USD. 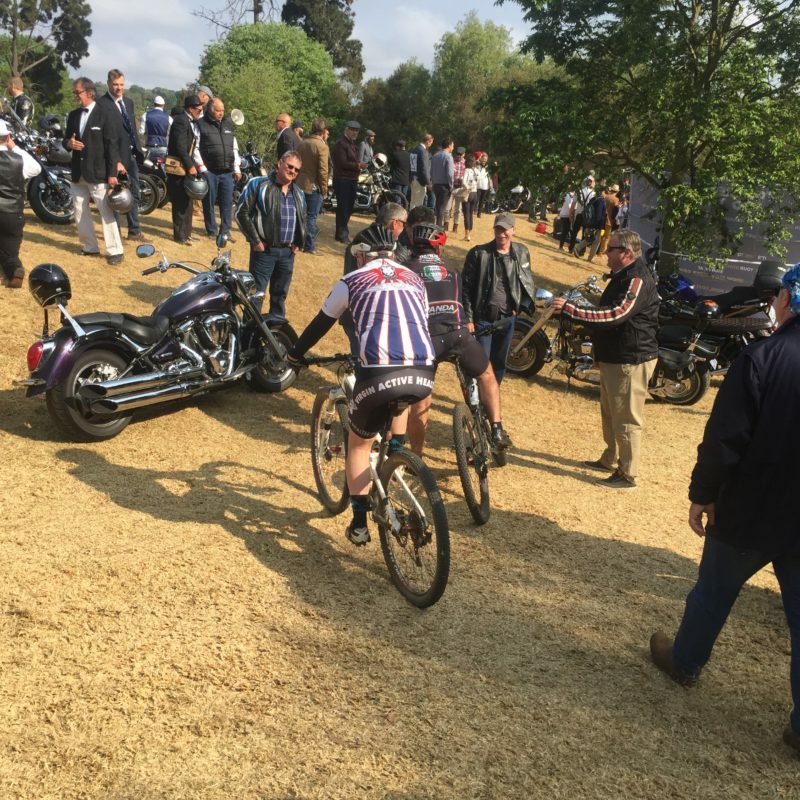 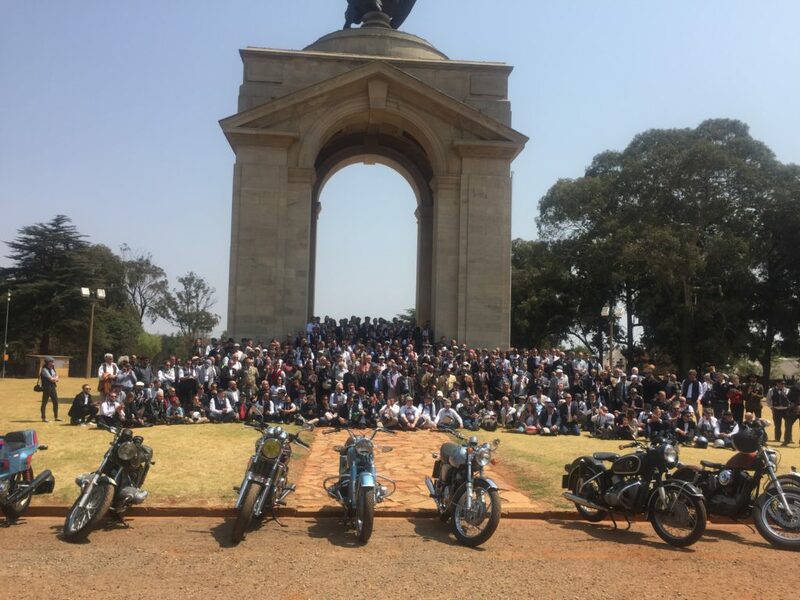 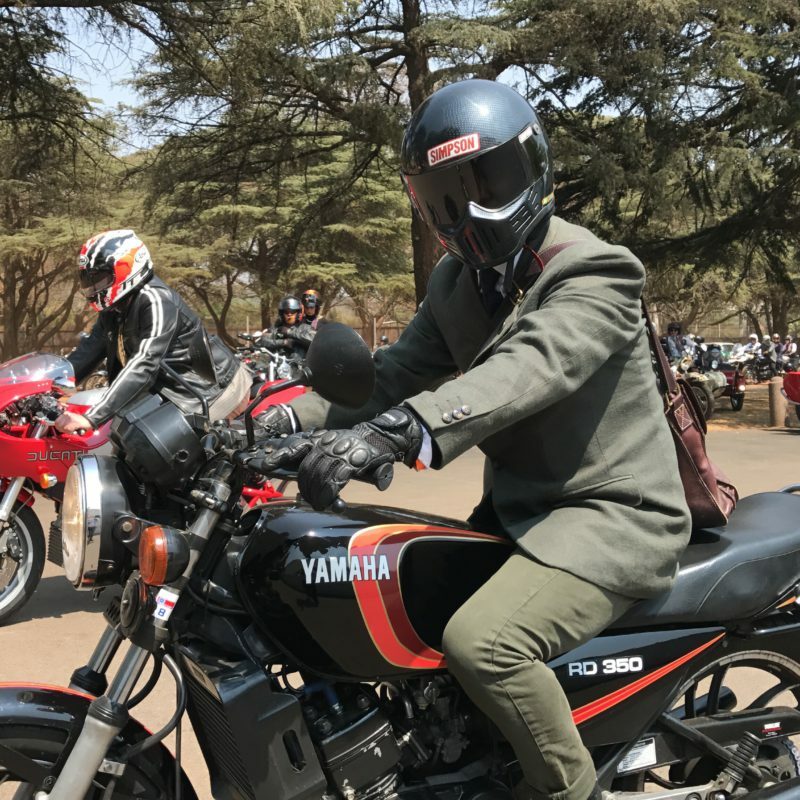 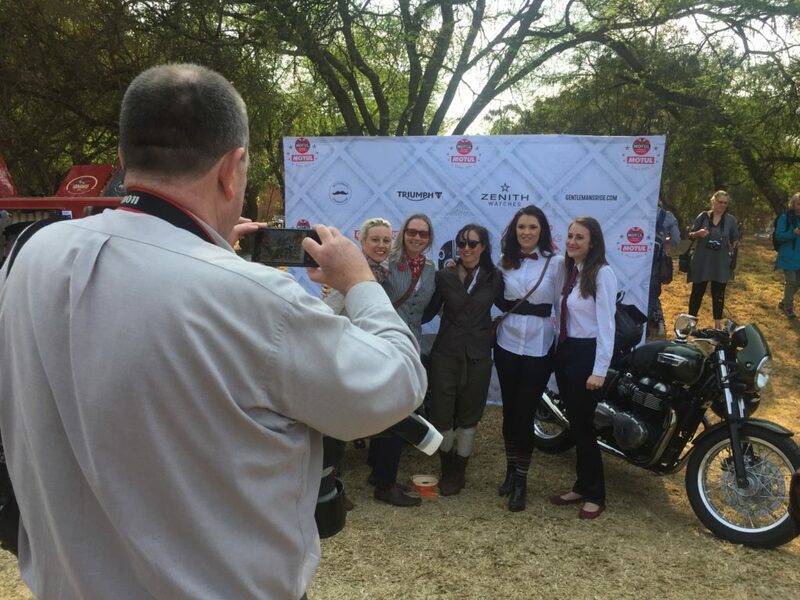 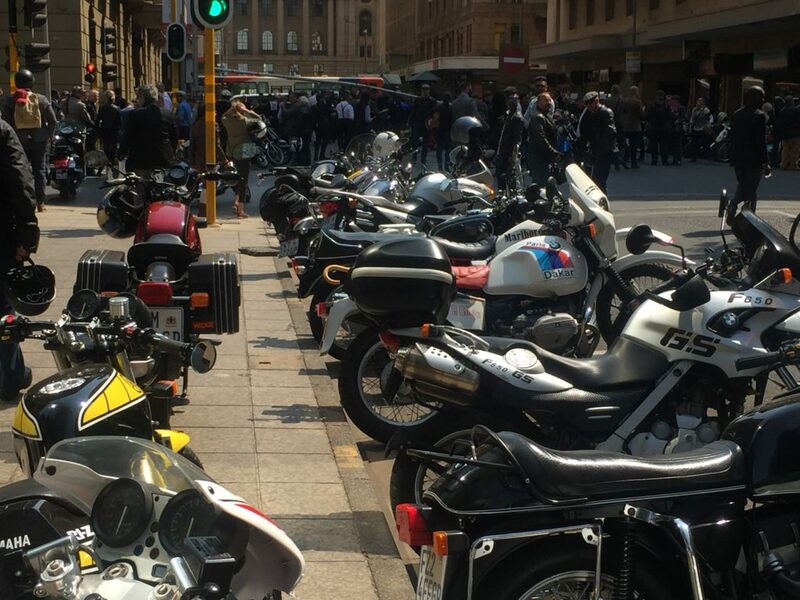 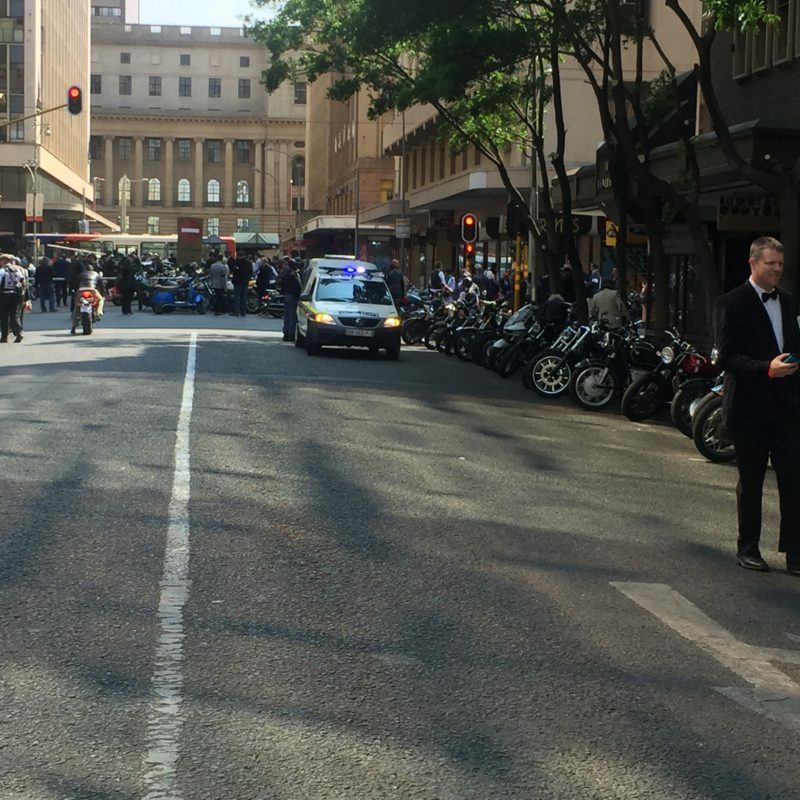 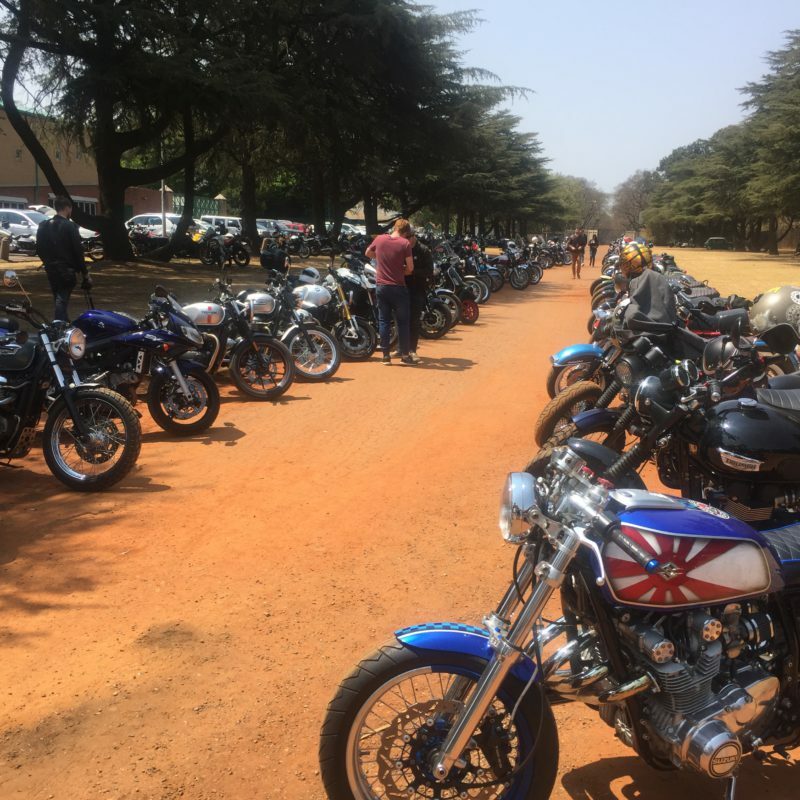 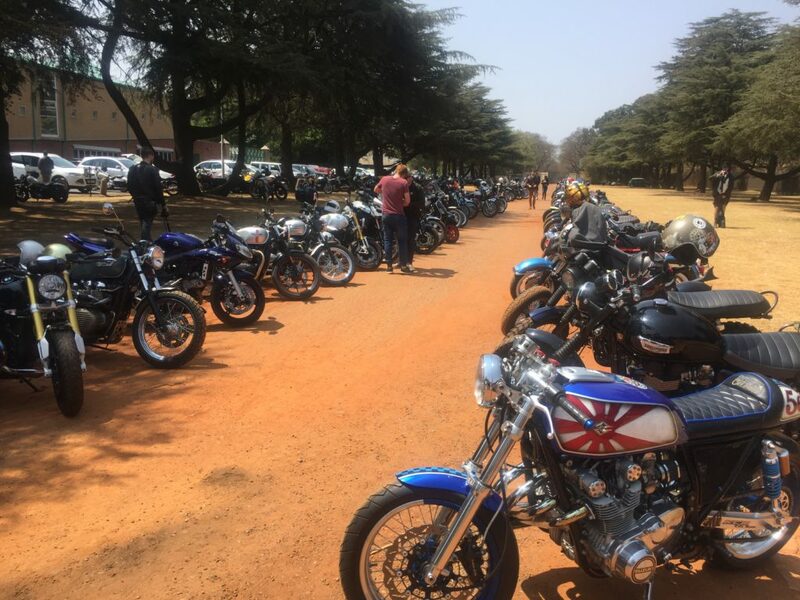 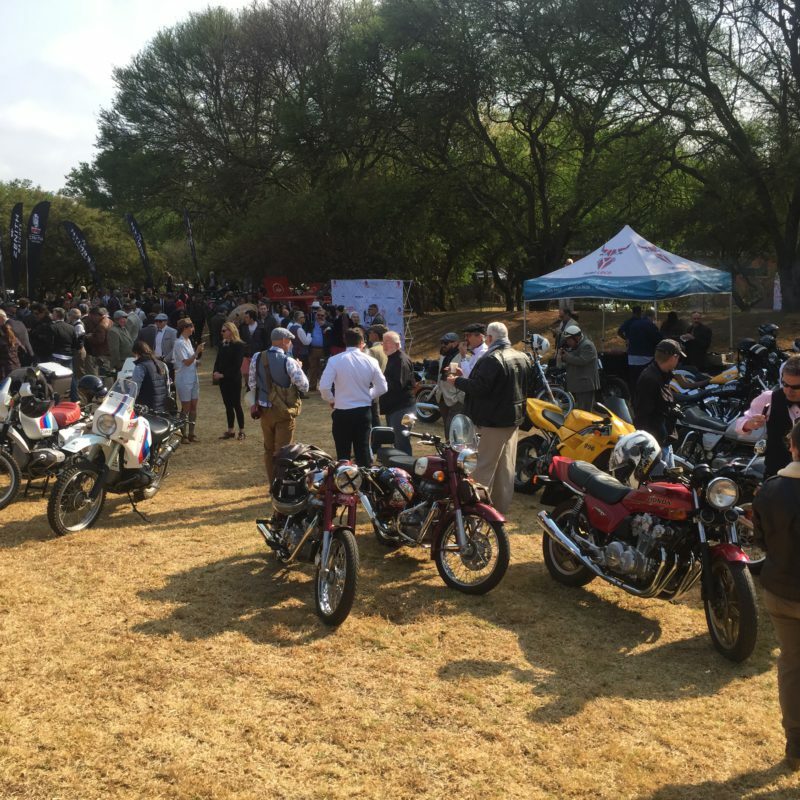 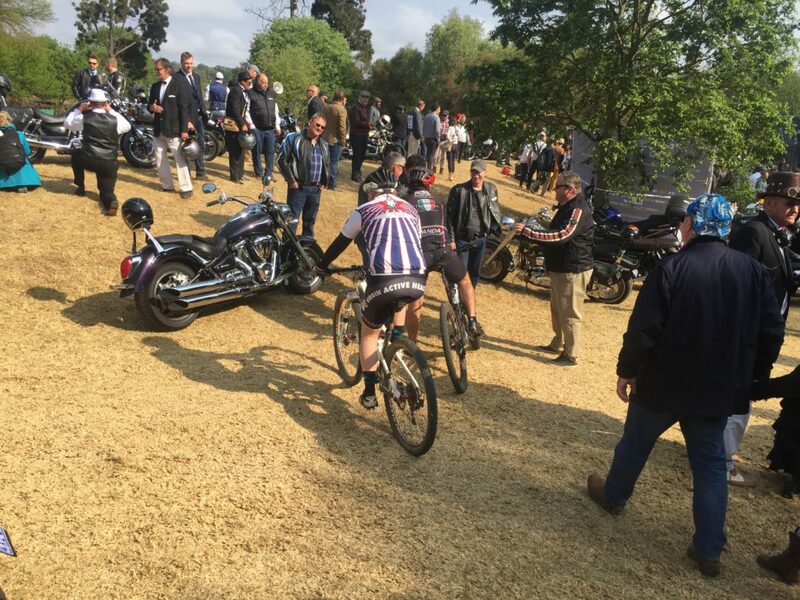 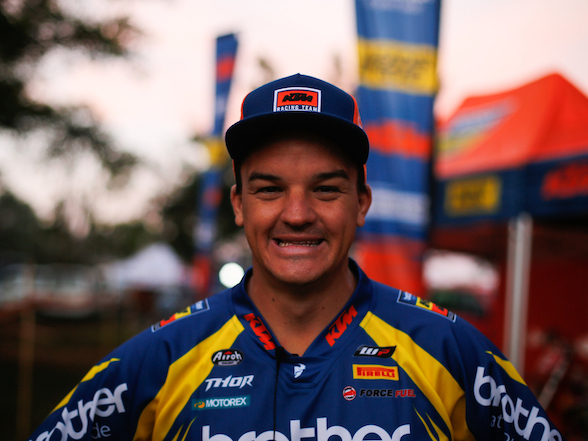 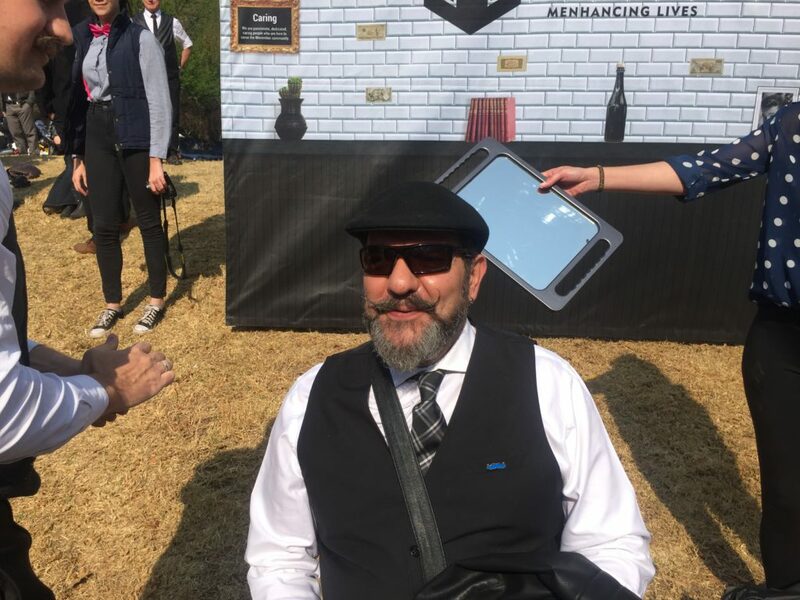 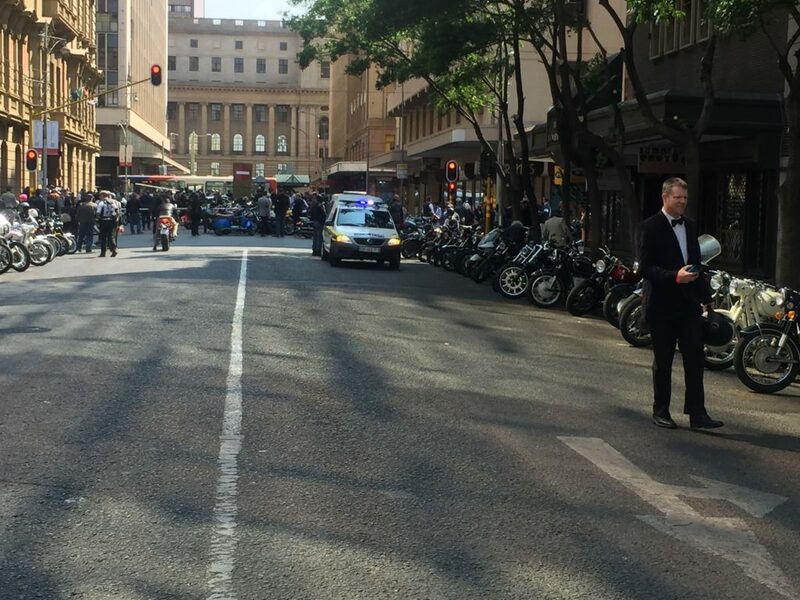 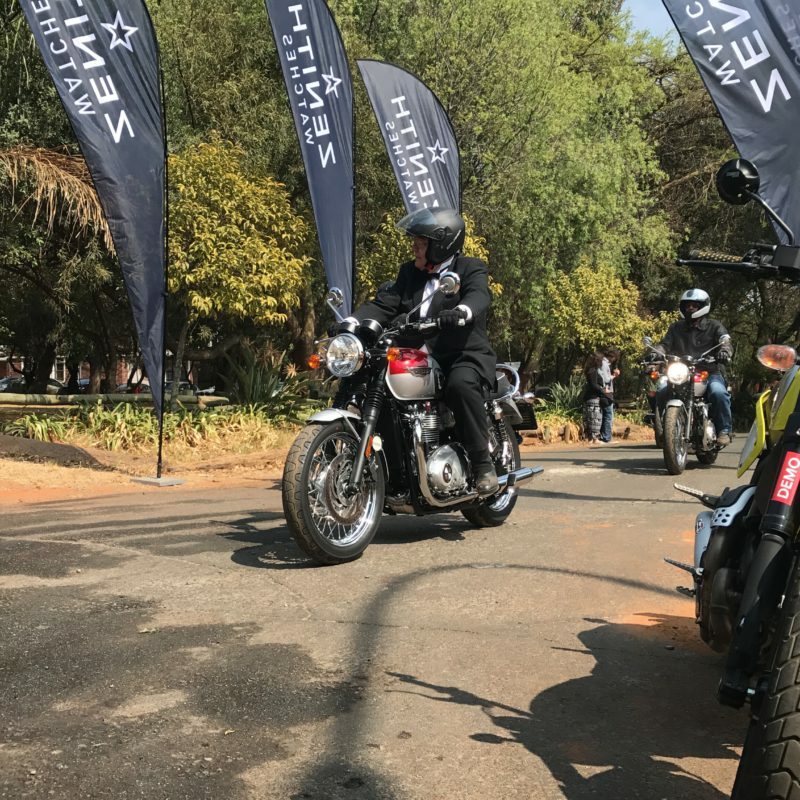 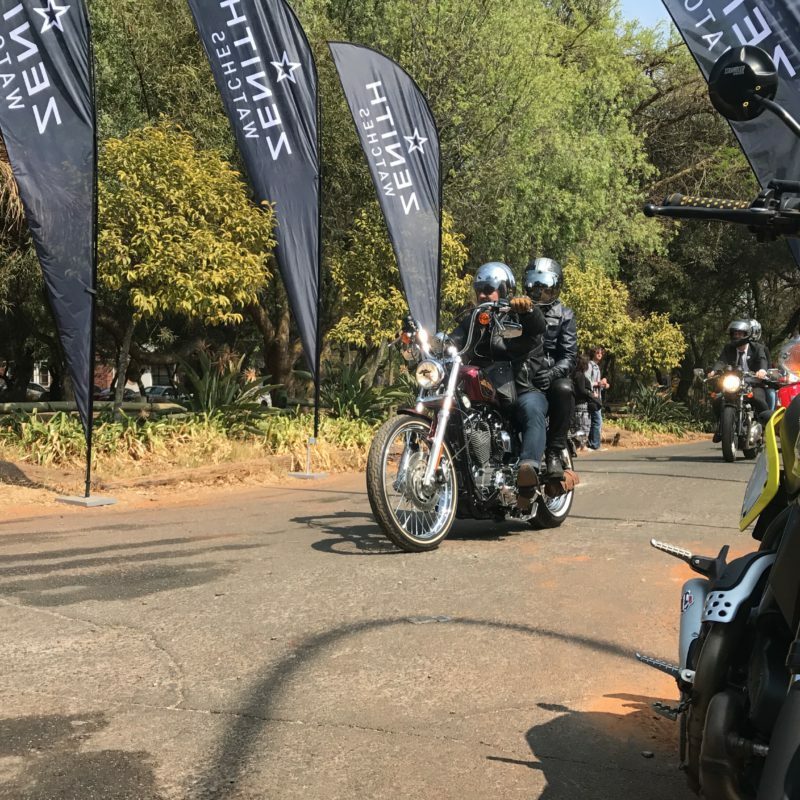 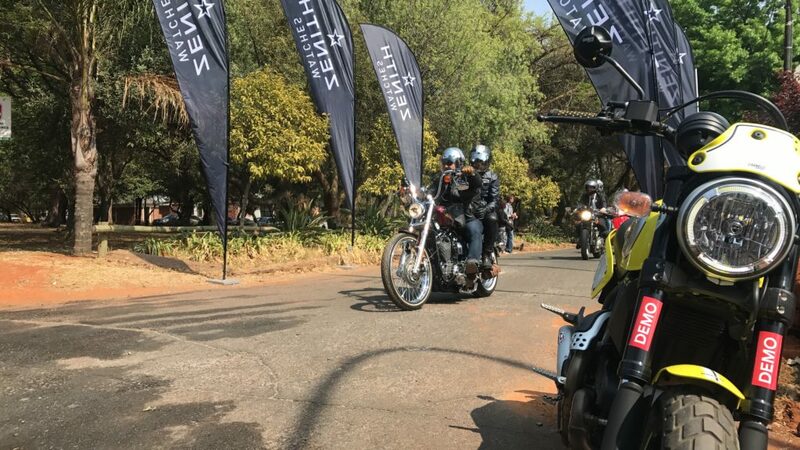 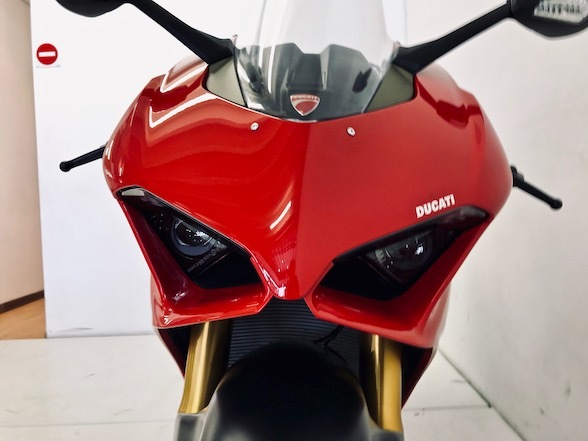 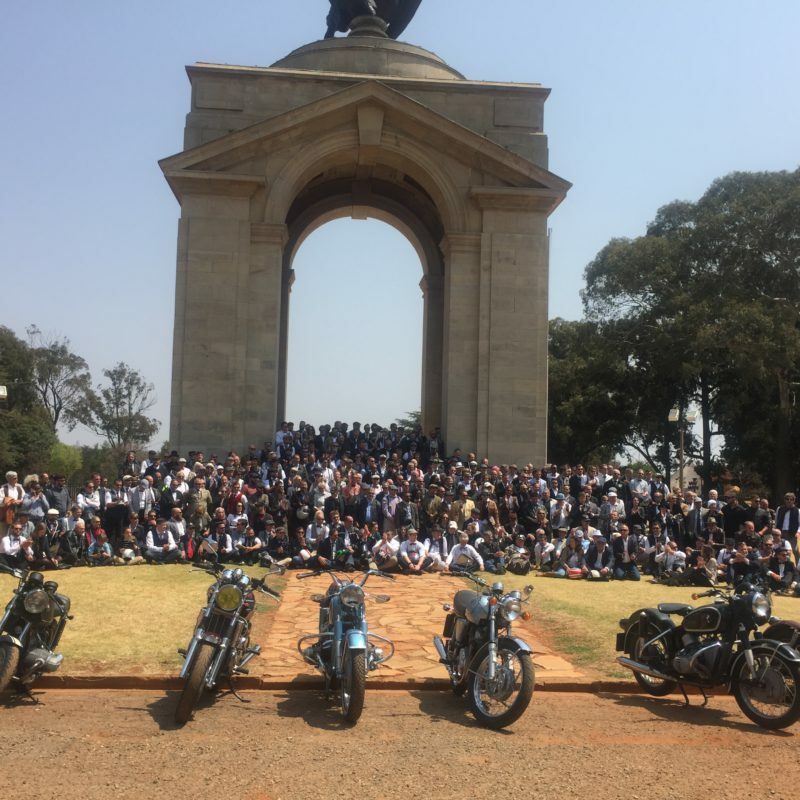 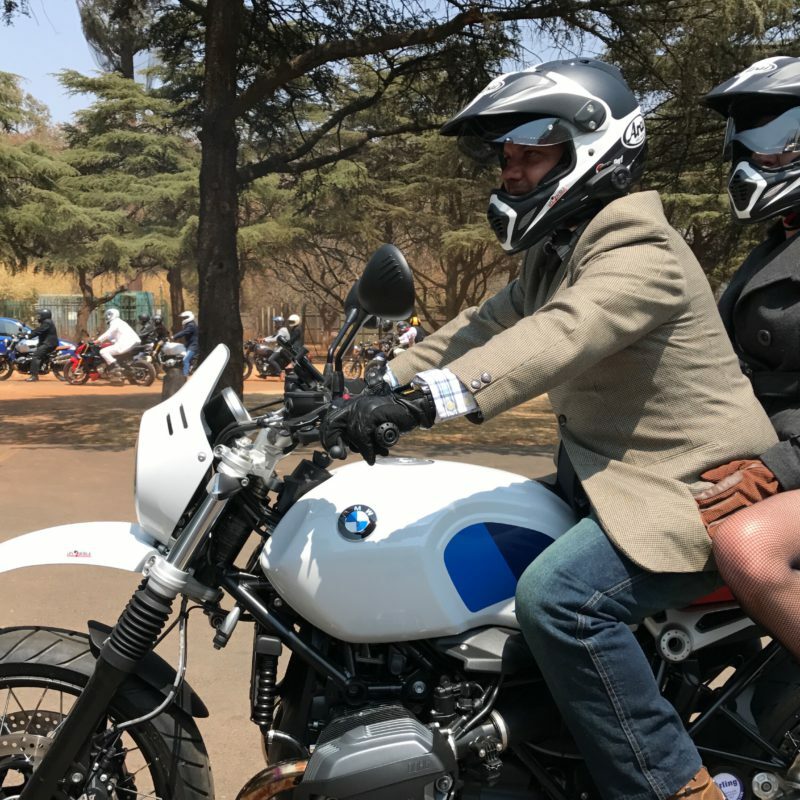 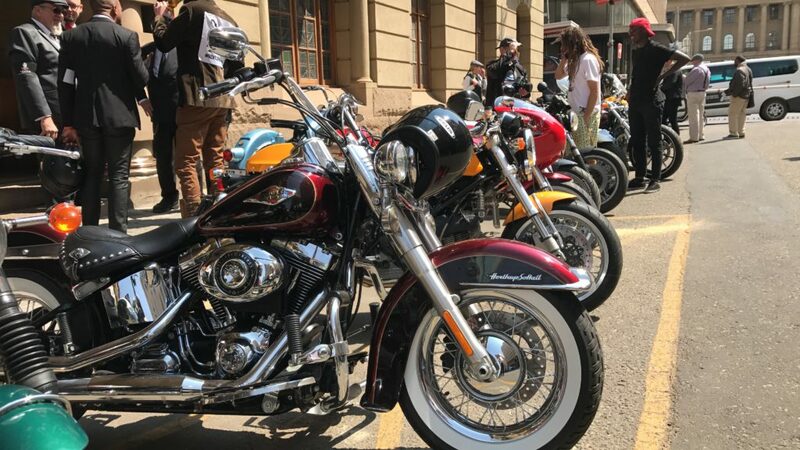 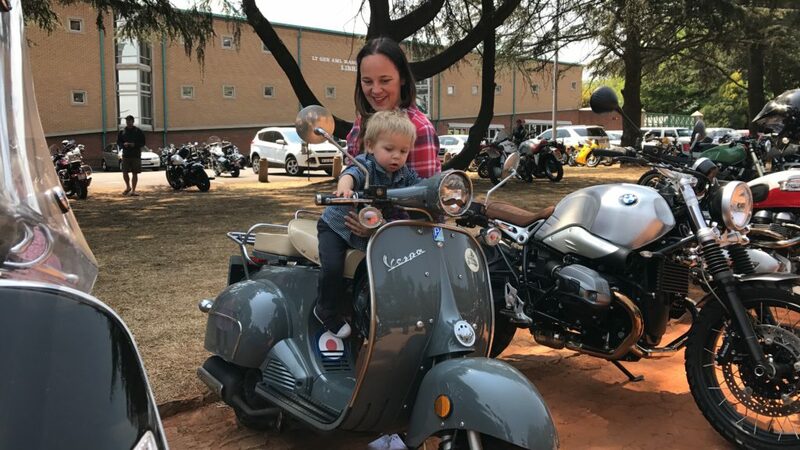 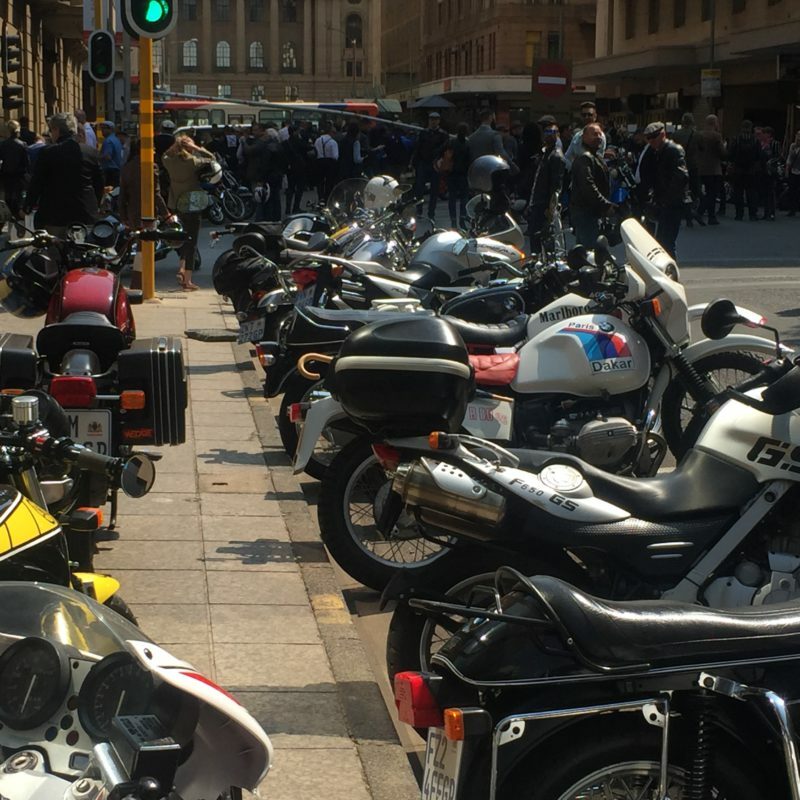 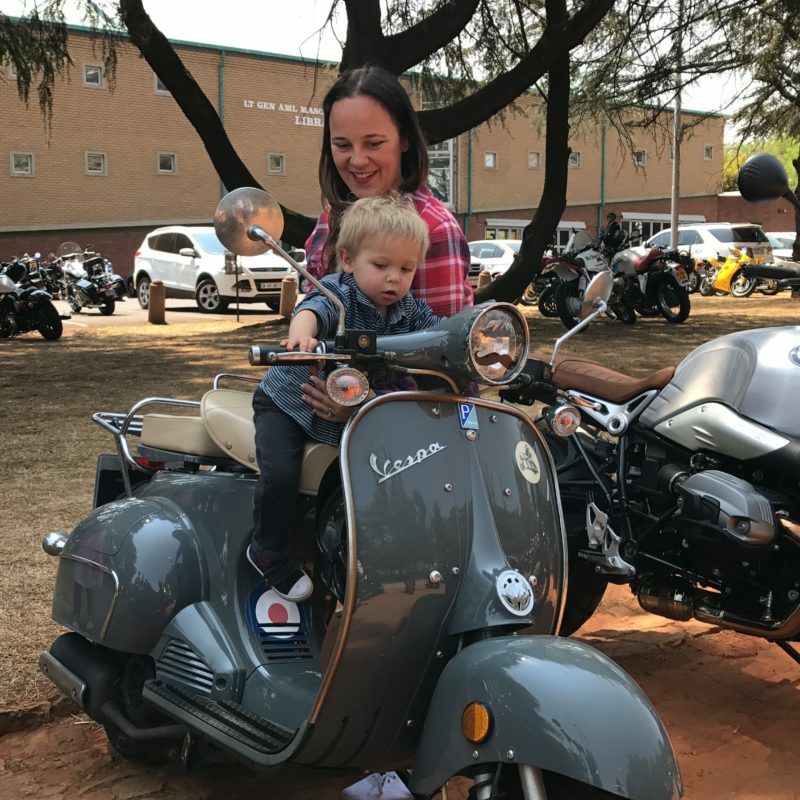 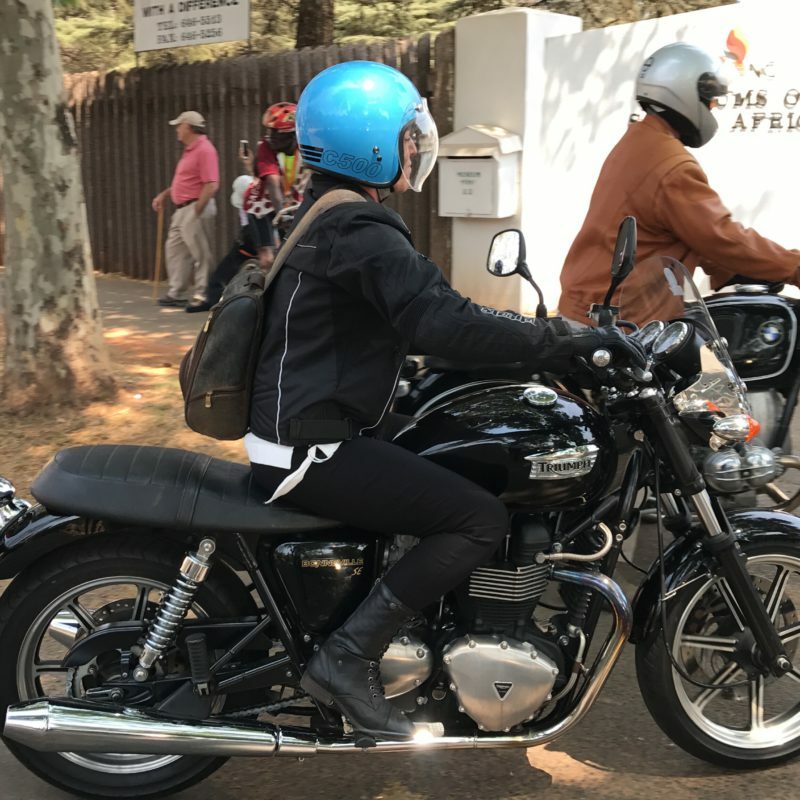 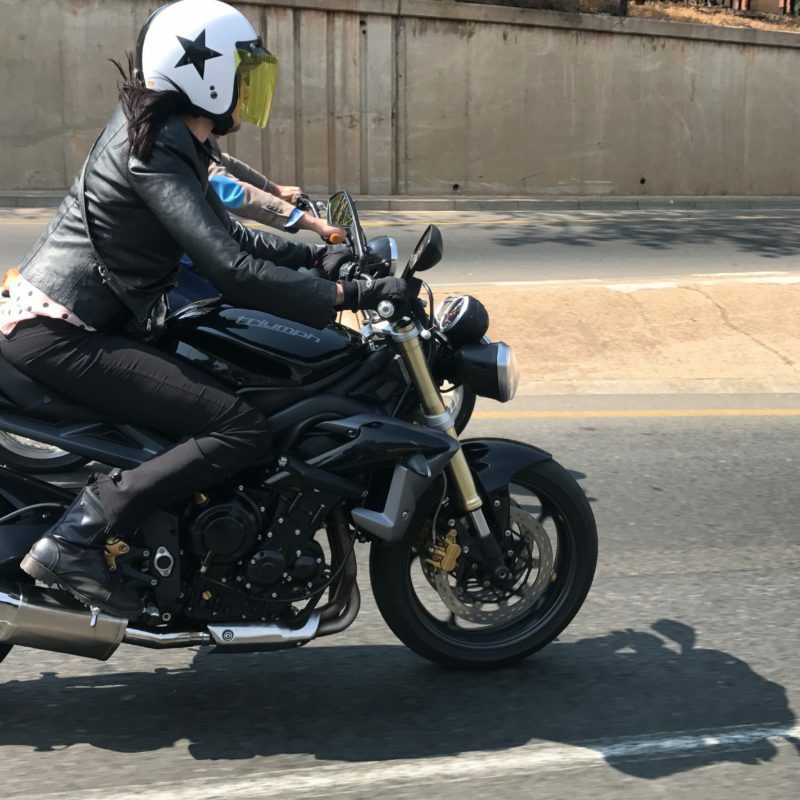 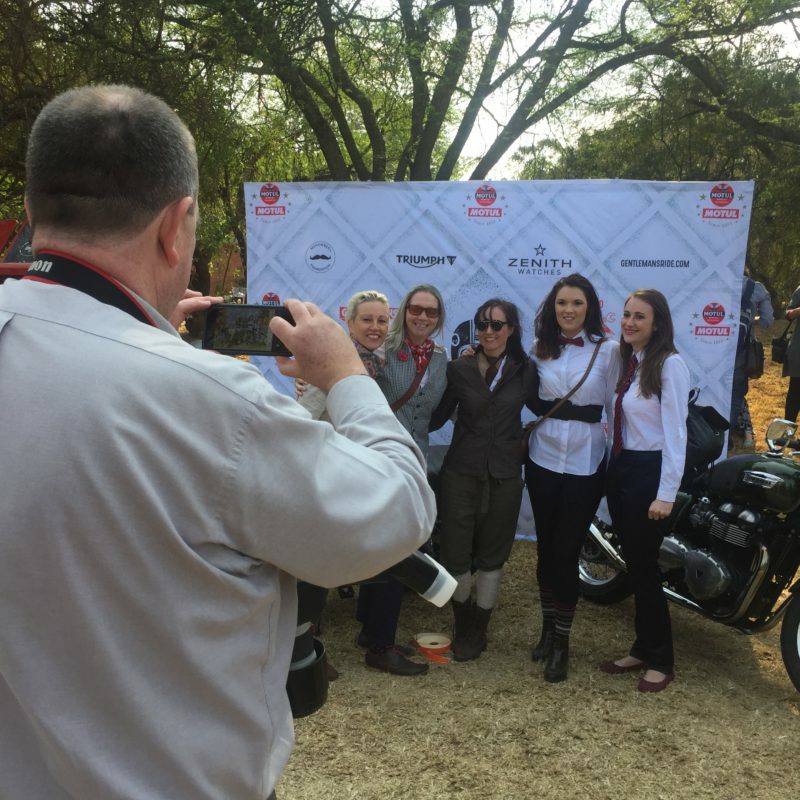 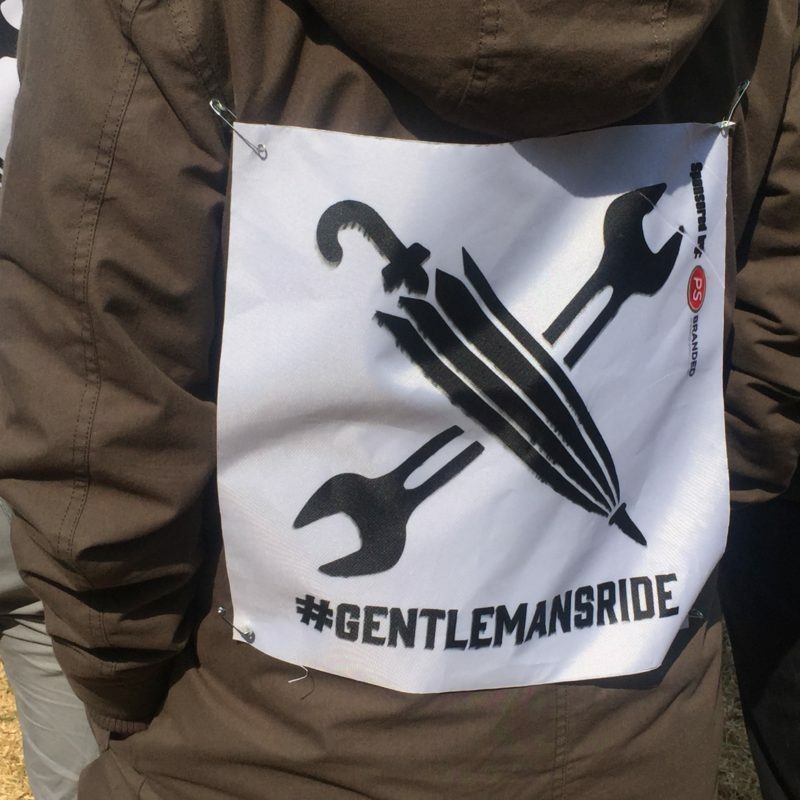 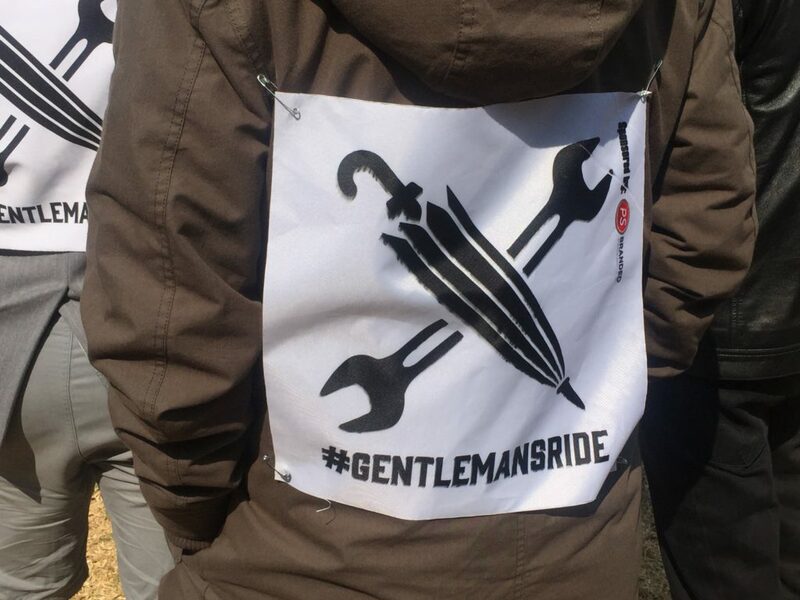 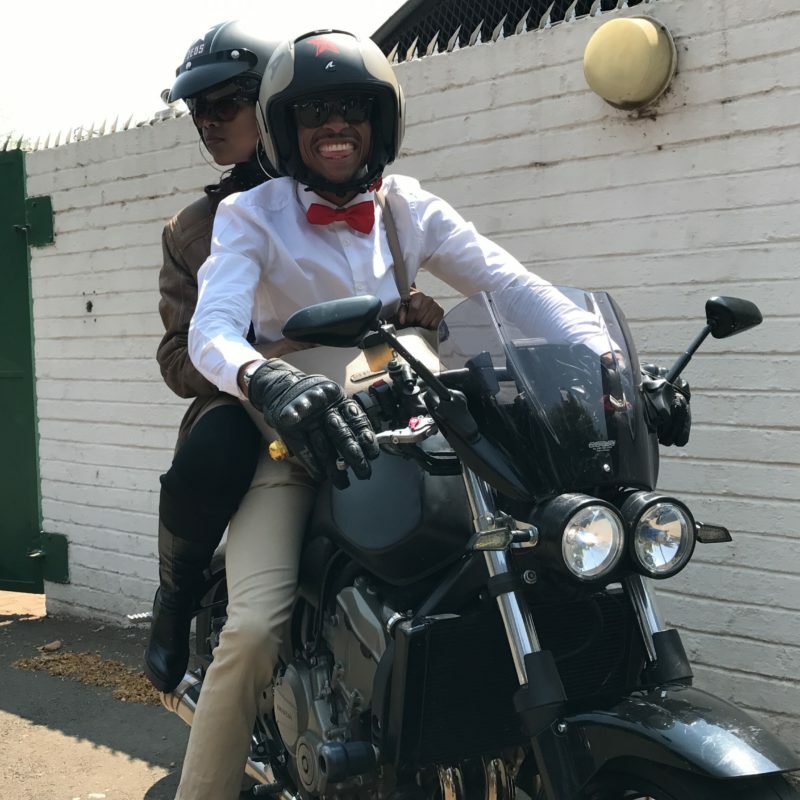 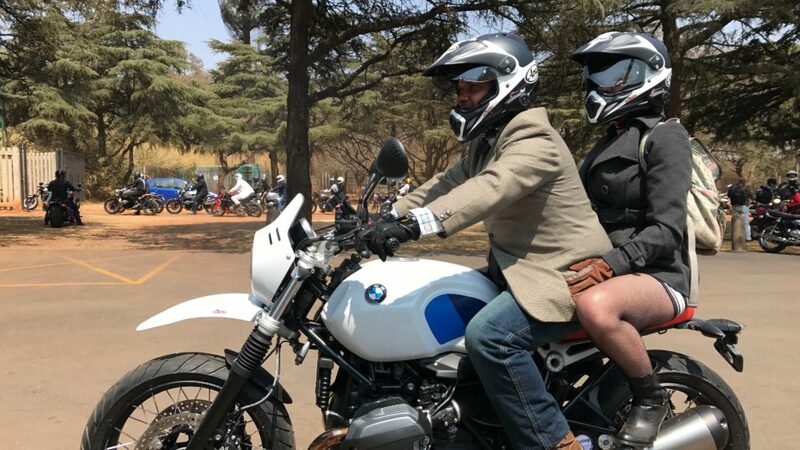 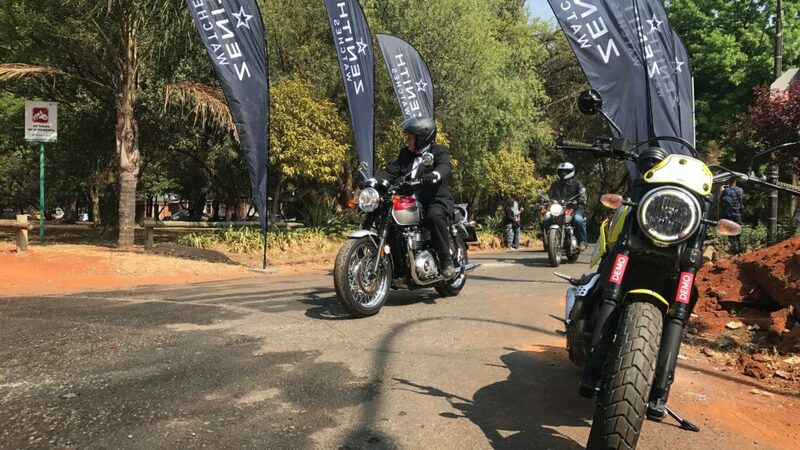 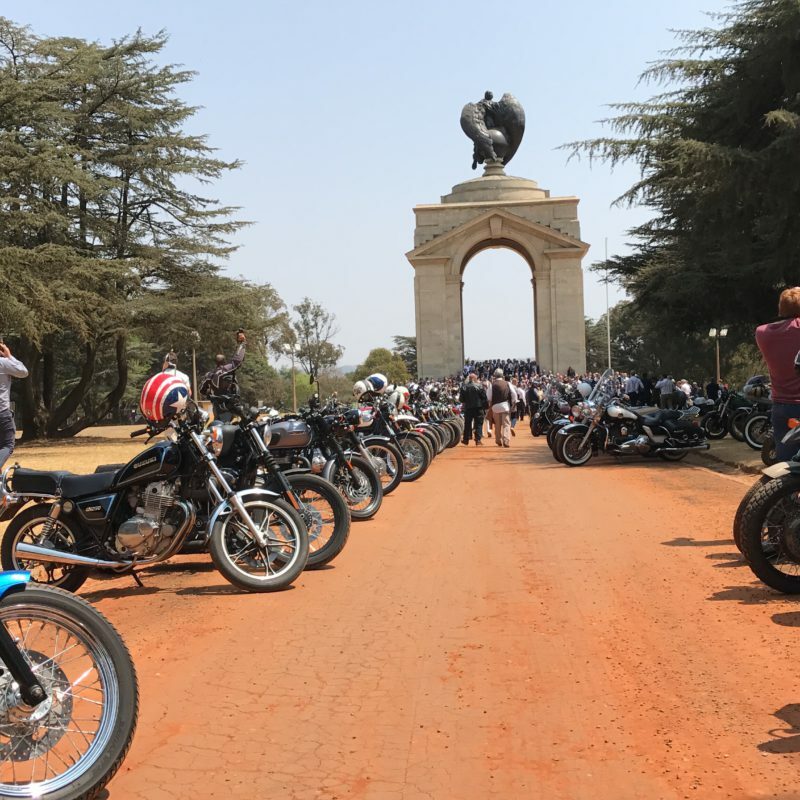 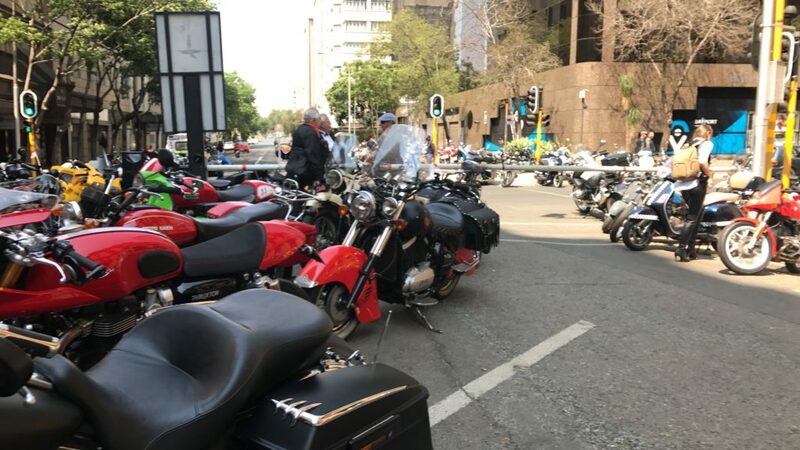 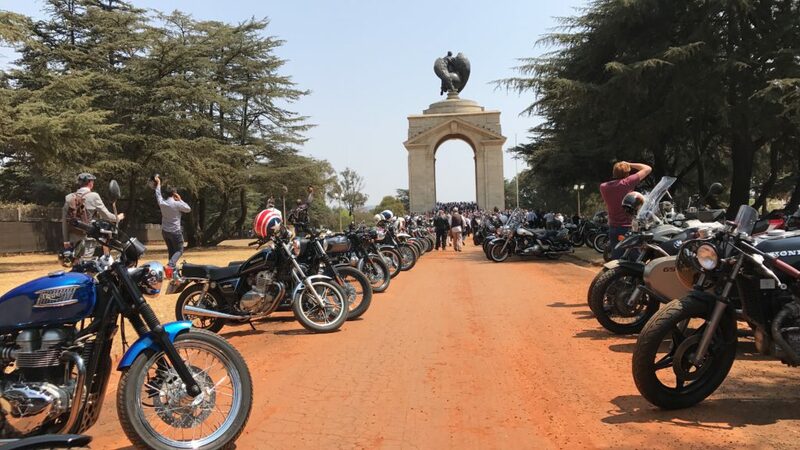 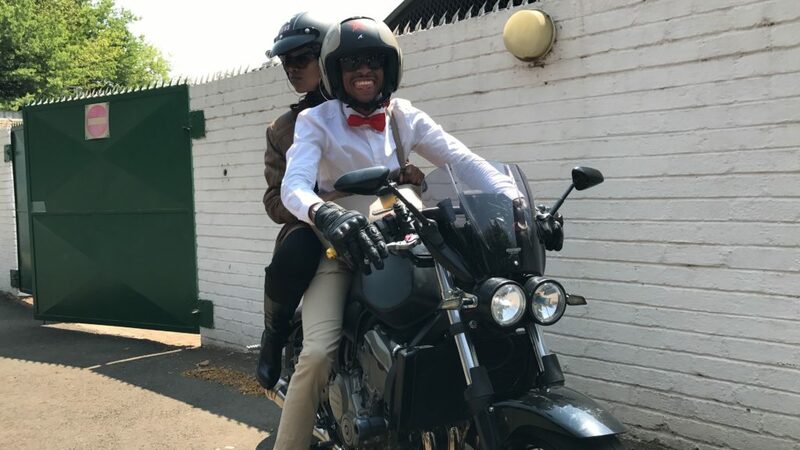 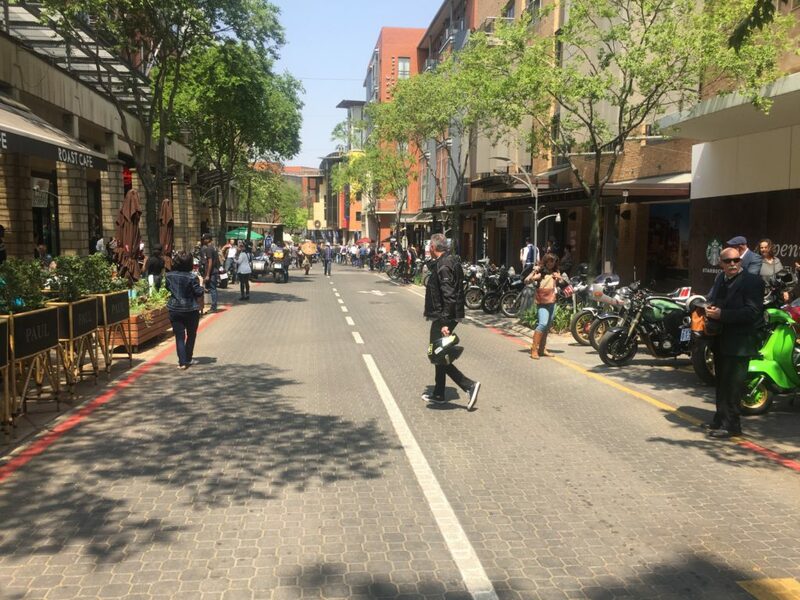 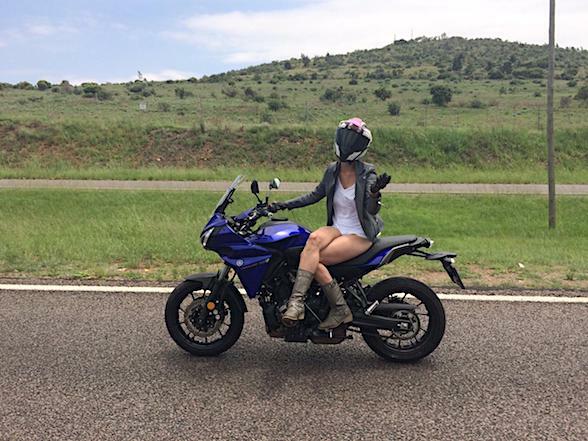 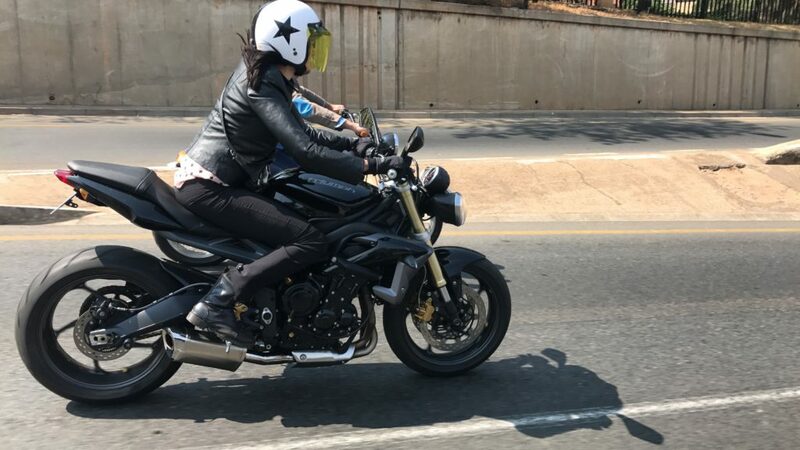 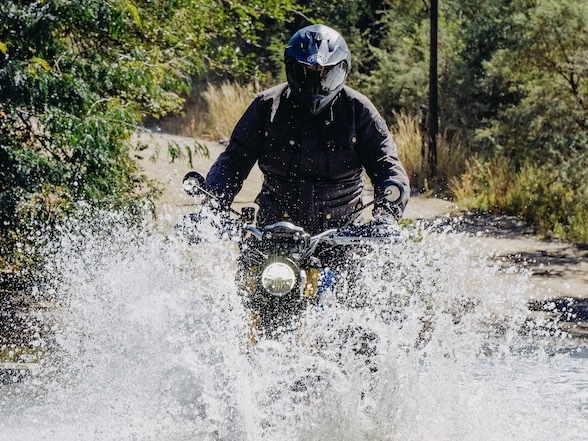 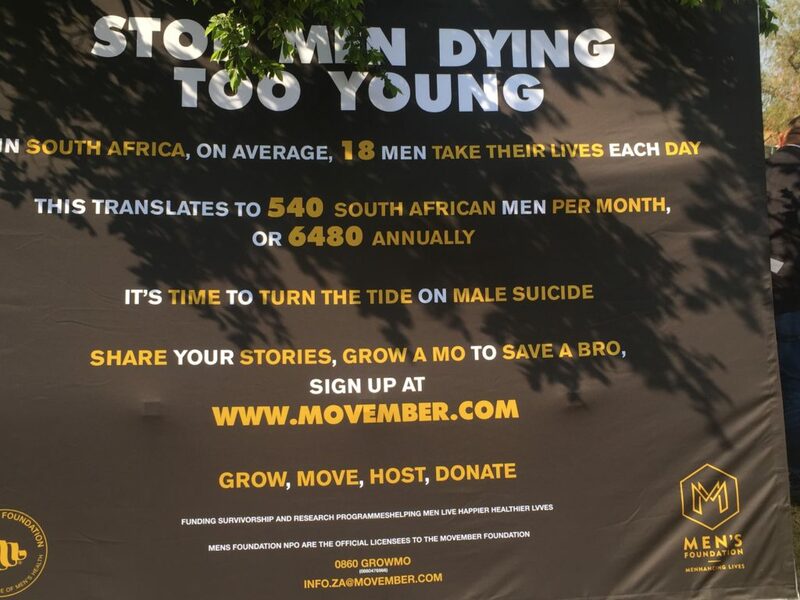 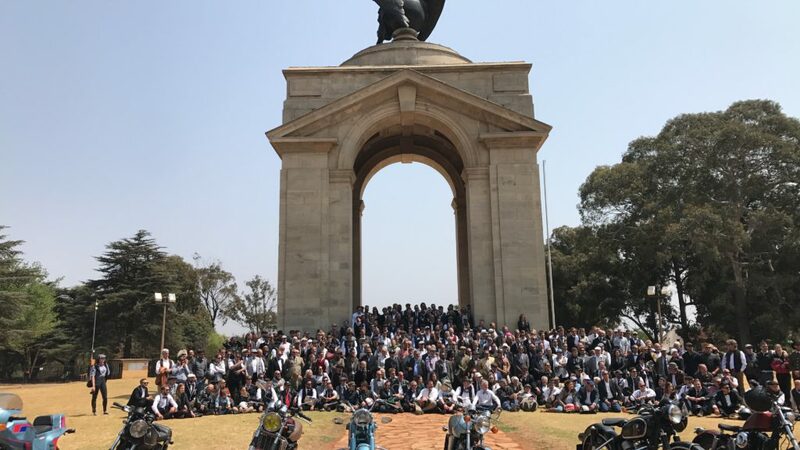 In South Africa, events took place in Bloemfontein, Cape Town, East London, Durban and Johannesburg, with a tally of 900 SA riders registered on the global website and more than $21000 raised. 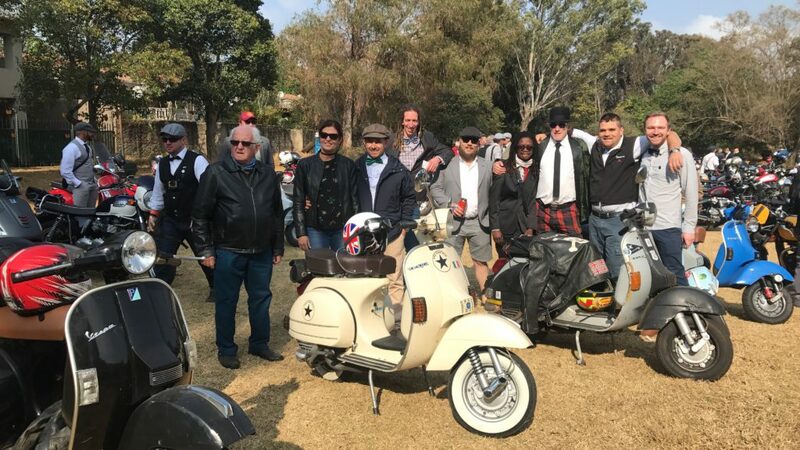 The Jo’burg run officially started at the Vintage & Veteran Club Joburg, but dealers and groups had their own mini-starts everywhere. 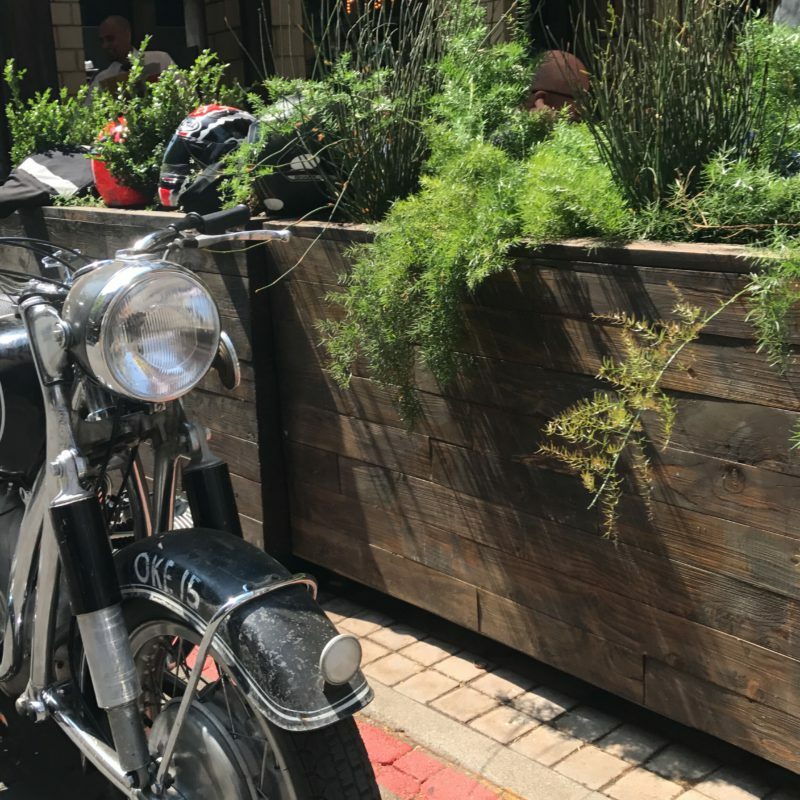 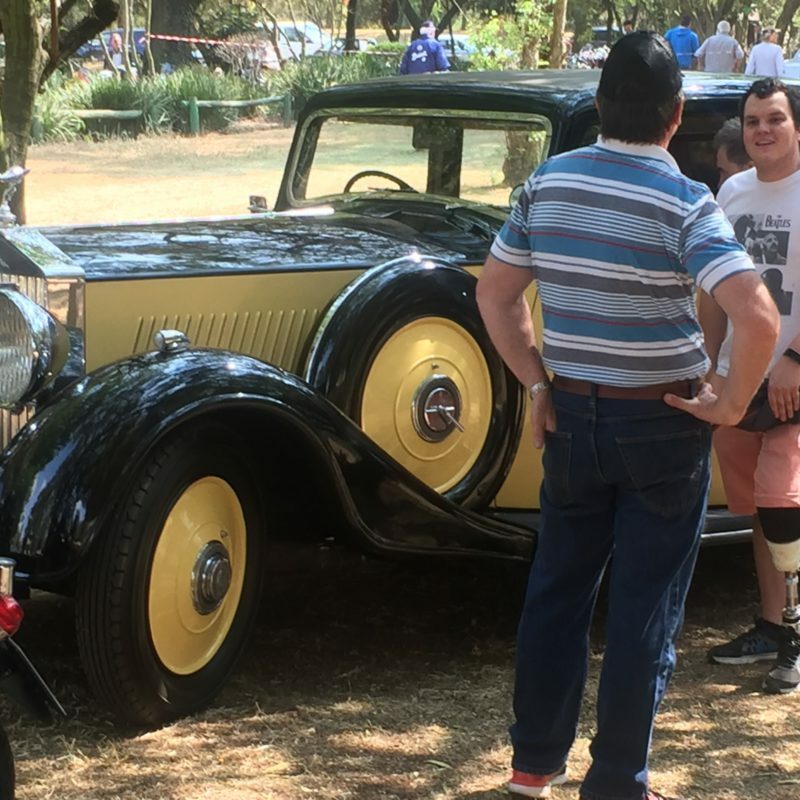 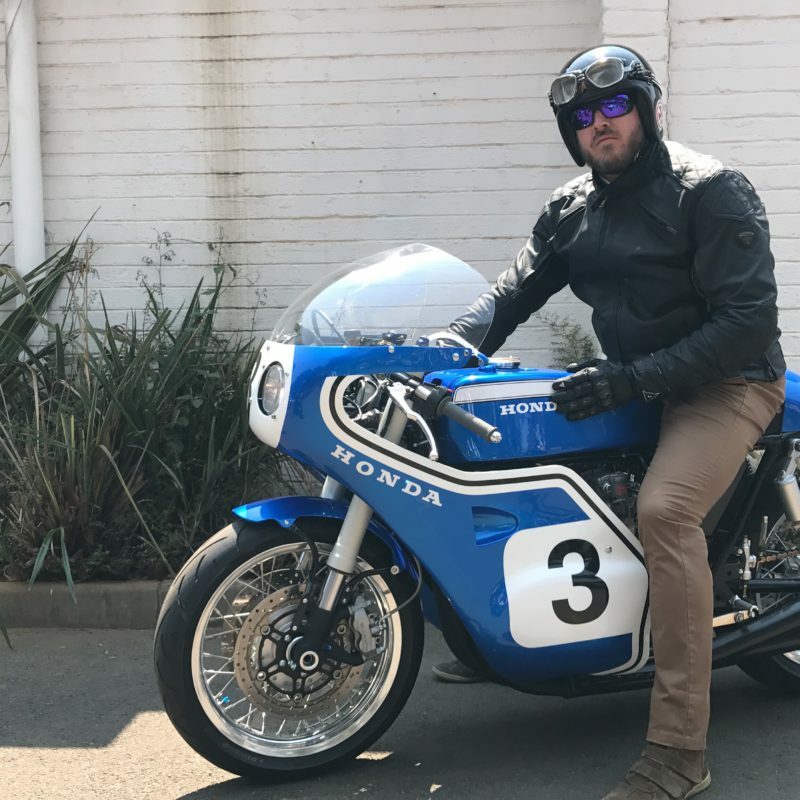 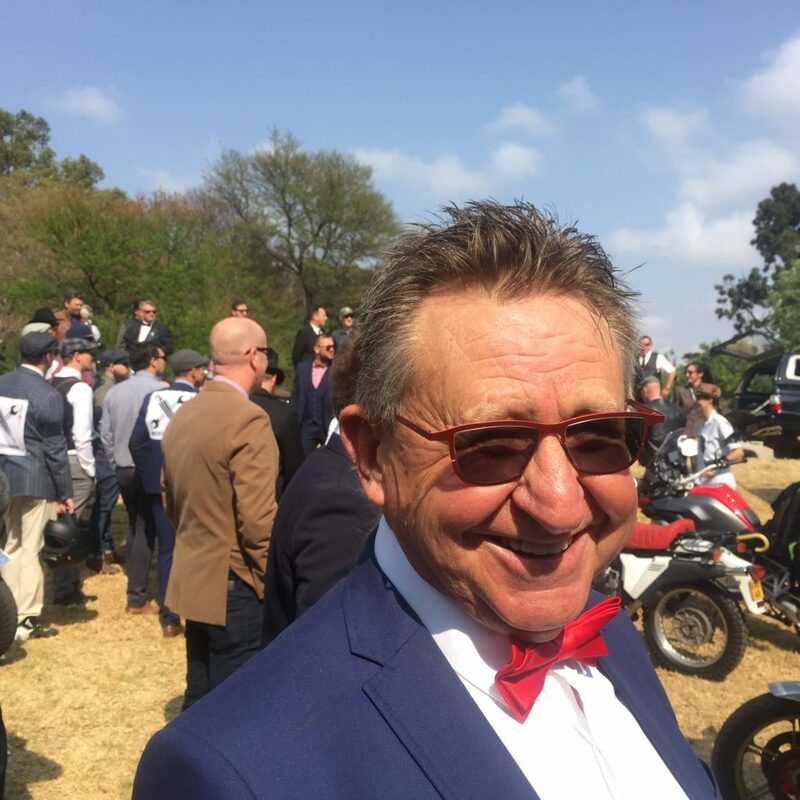 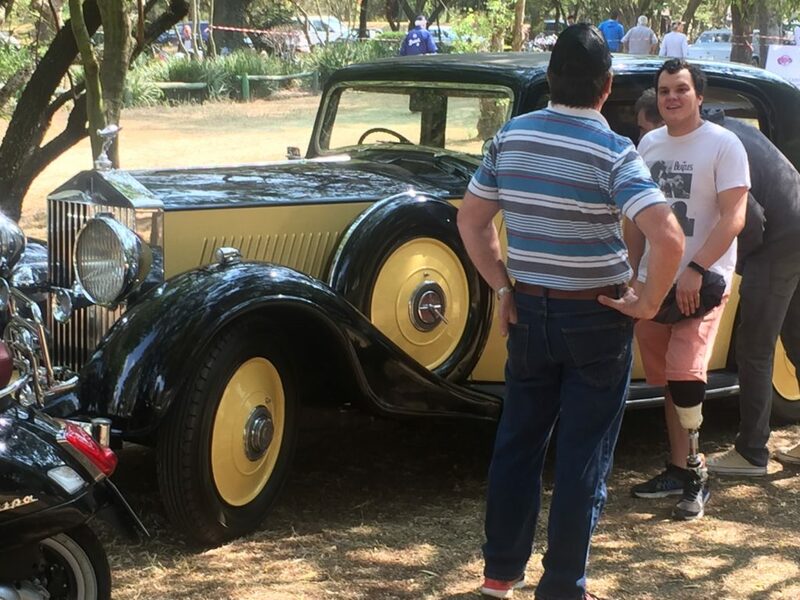 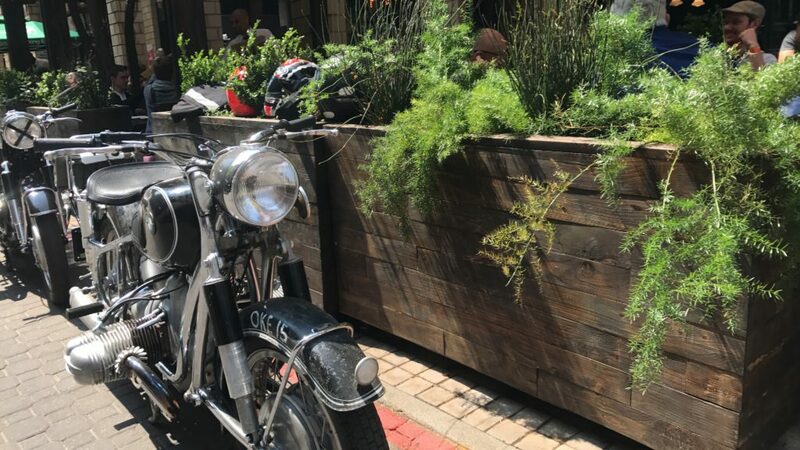 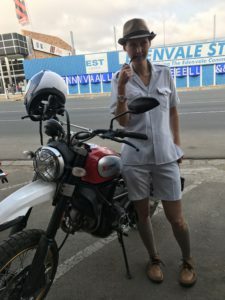 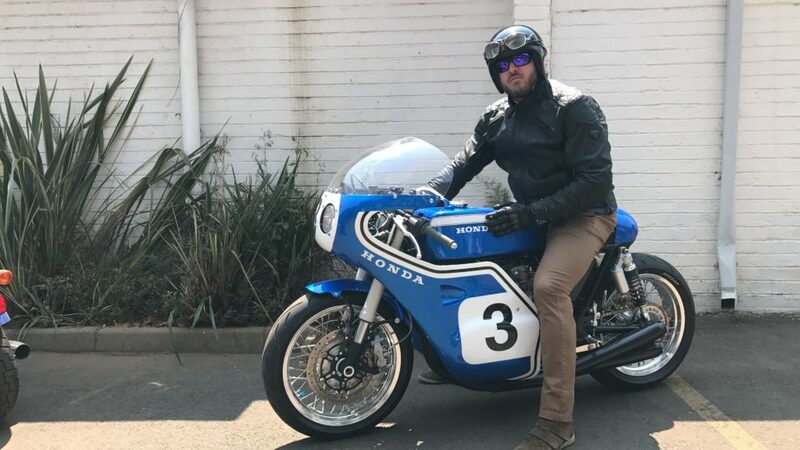 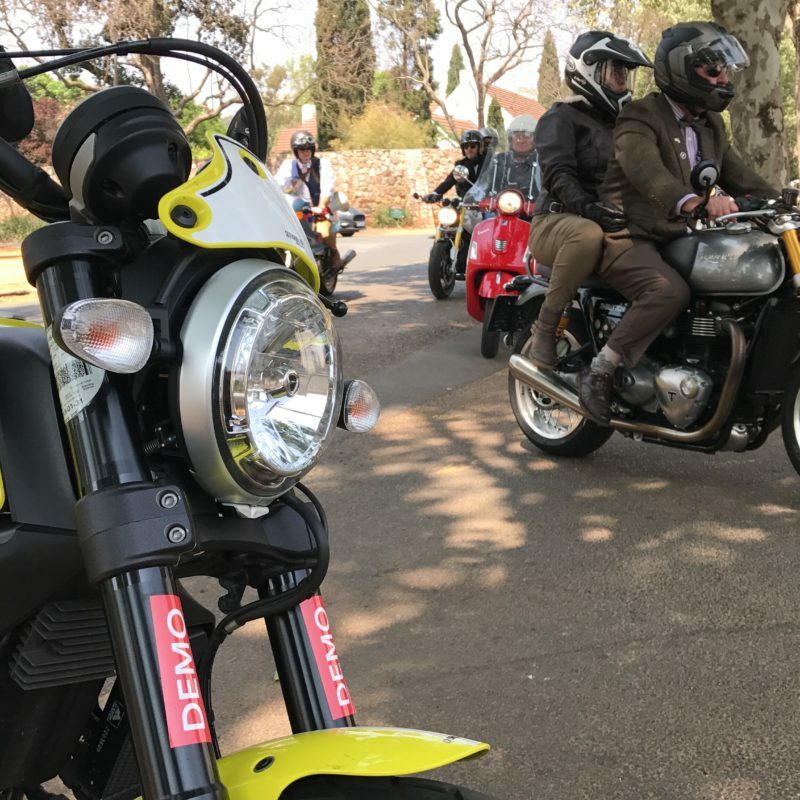 We found ourselves drinking coffee in Edenvale with Nick Davidson, the ever-effervescent owner of Traditional Triumph, and a gang of the Traditional stalwarts. 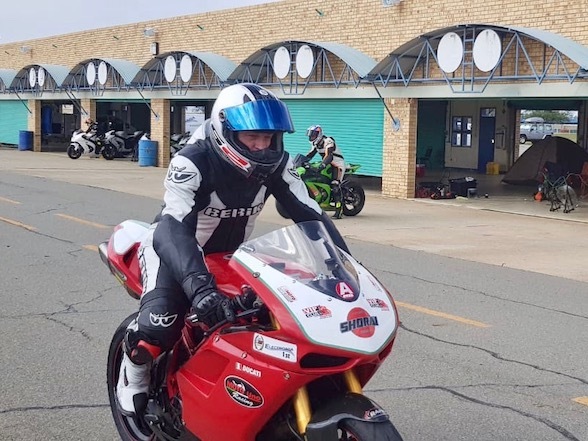 As is the cruel way of the weather gods, it was bloody freezing. 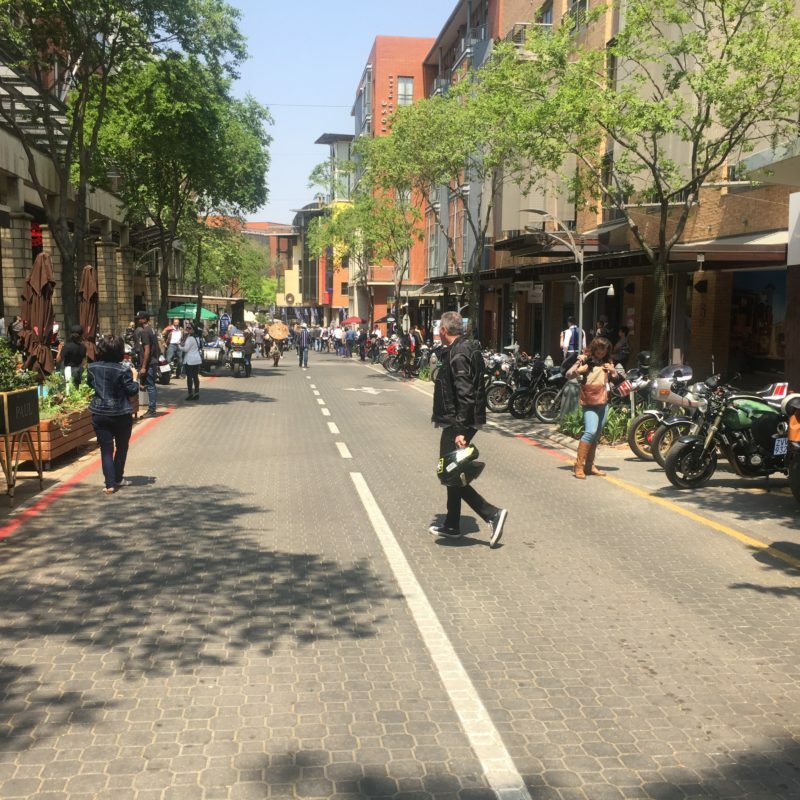 We’d had a few weeks of sunshine, sweltering heat and happiness, but today was blanketed by grey misery and icy gusts. Skinny Van Skalkwyk, of tank girls fame, with her Desert Sled. 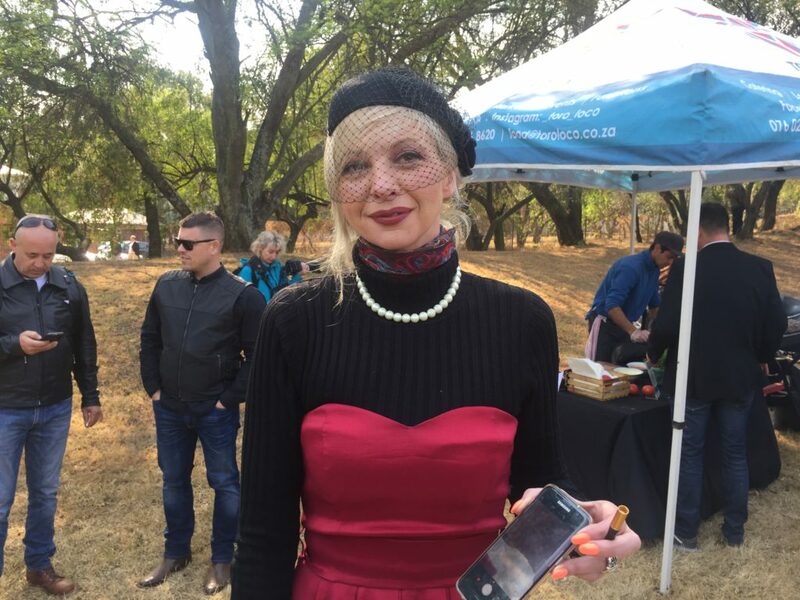 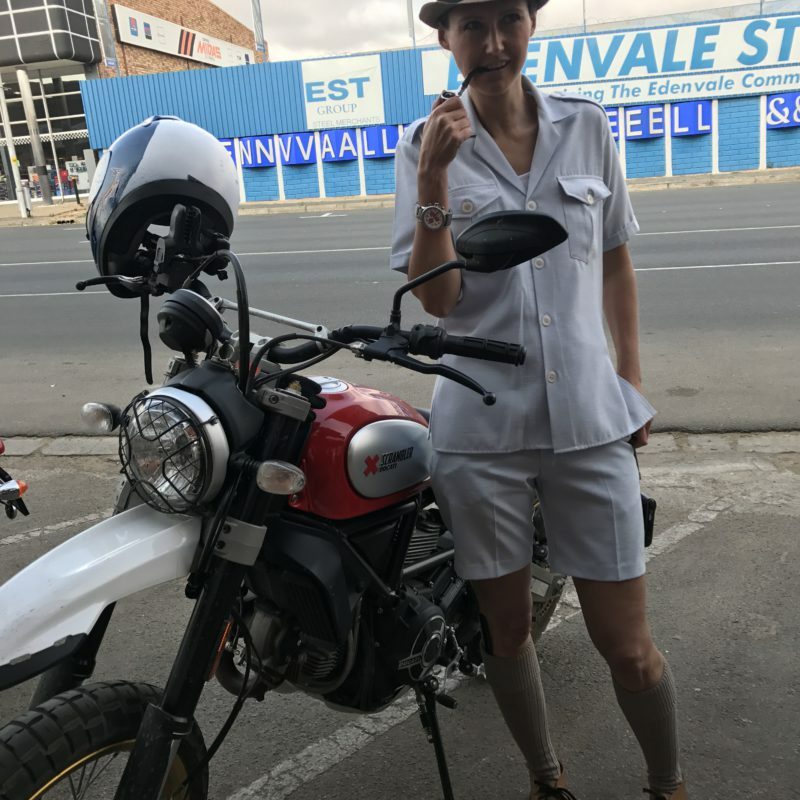 She decided to dress like a distinguished Afrikaans gentlemen, comb in sock and everything. 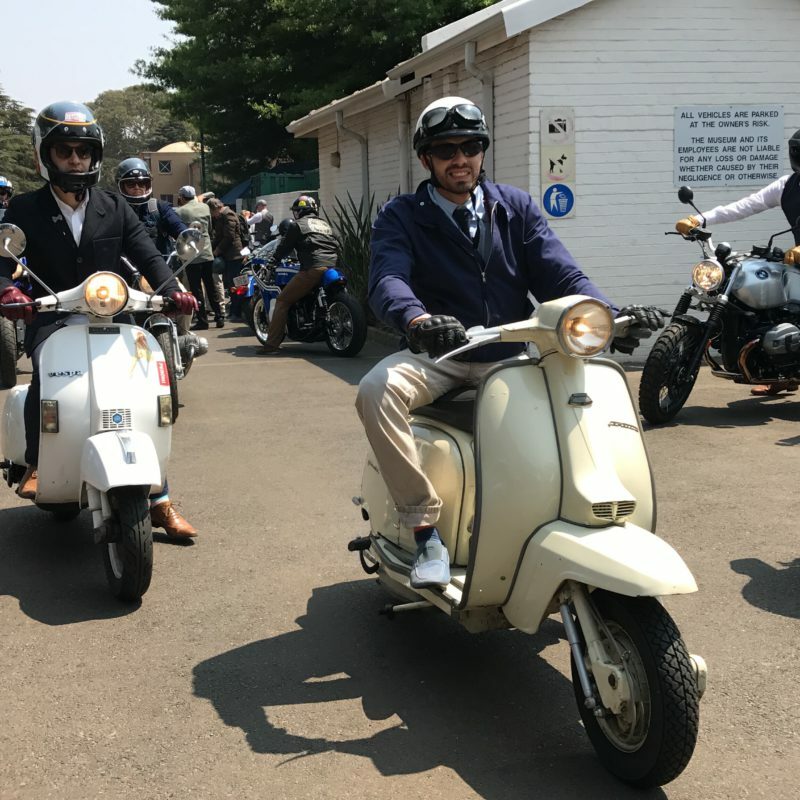 Of course, dapper outfits don’t usually cater for arctic winds, thus the group left the Traditional mini-start shivered their way to the maxi-start at VVC. 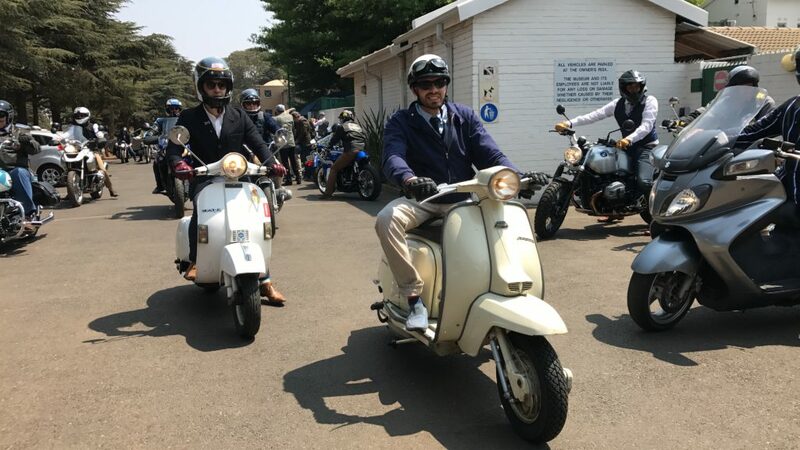 Even when your skin tone is various shades of blue and bits of anatomy are threatening to freeze off, riding flashy bikes in flashy outfits is deeply amusing, especially when in a group such as this. 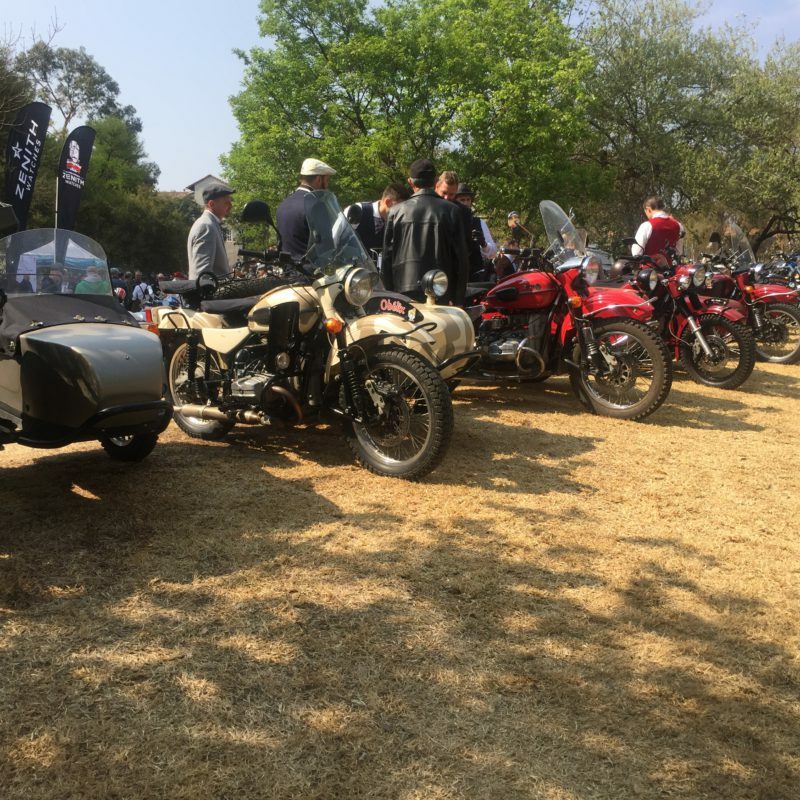 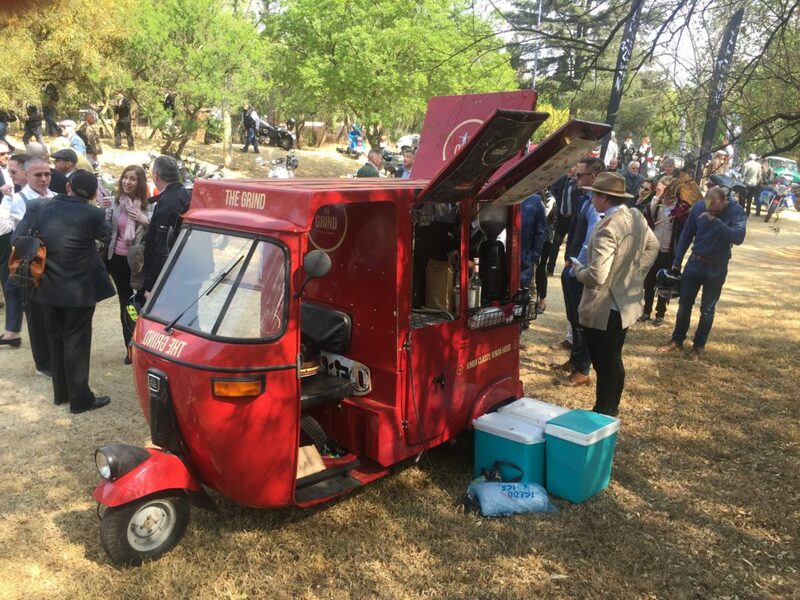 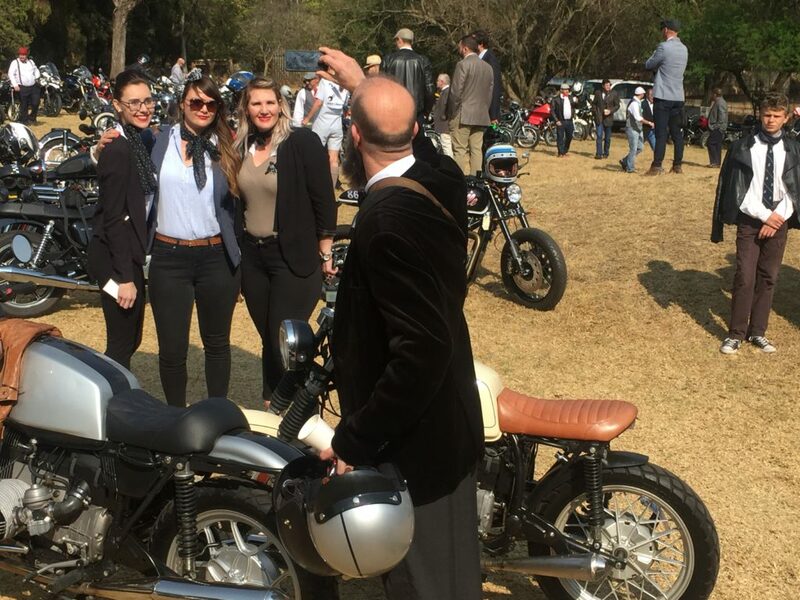 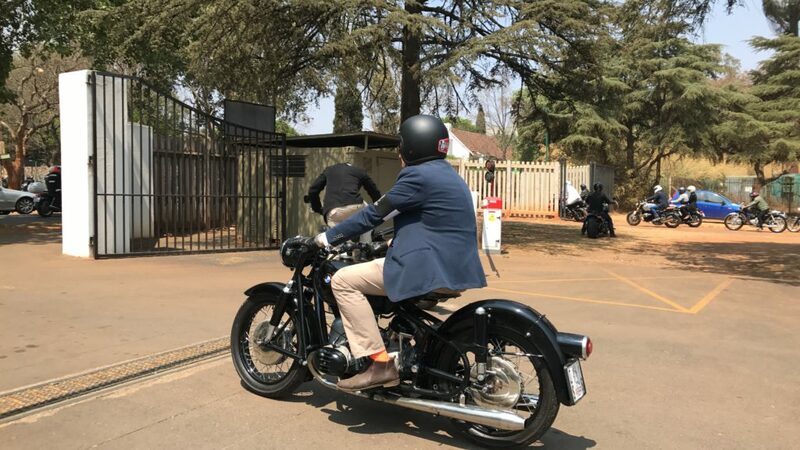 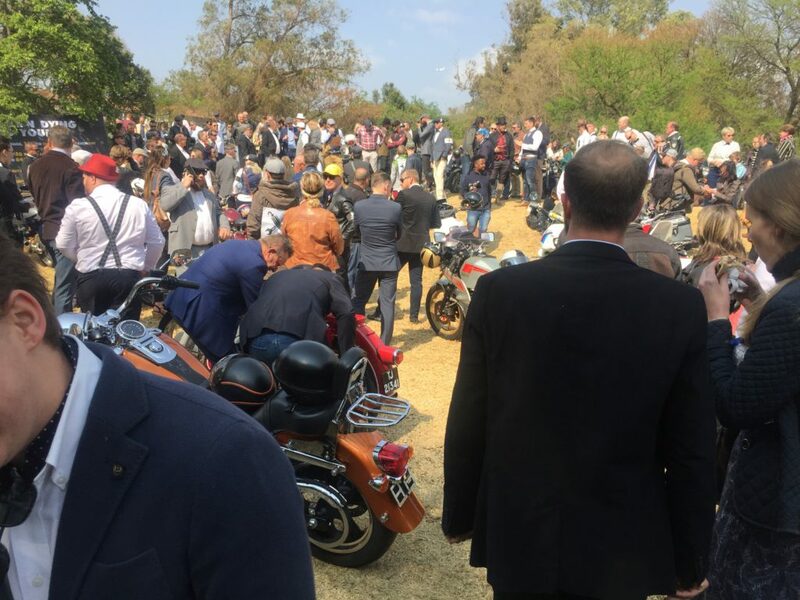 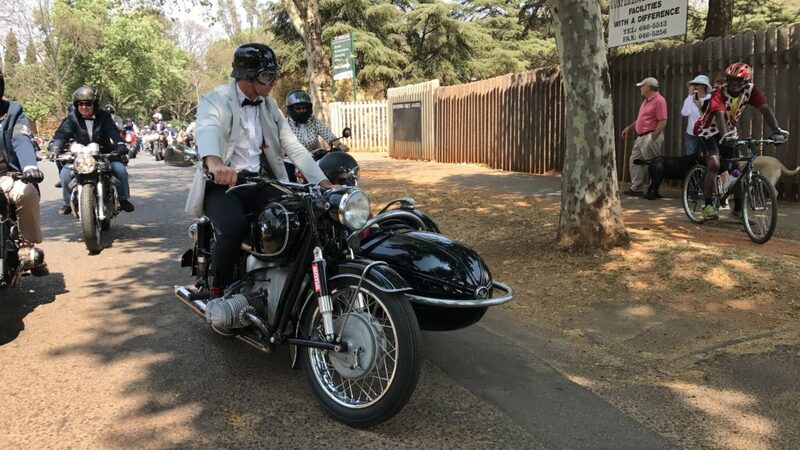 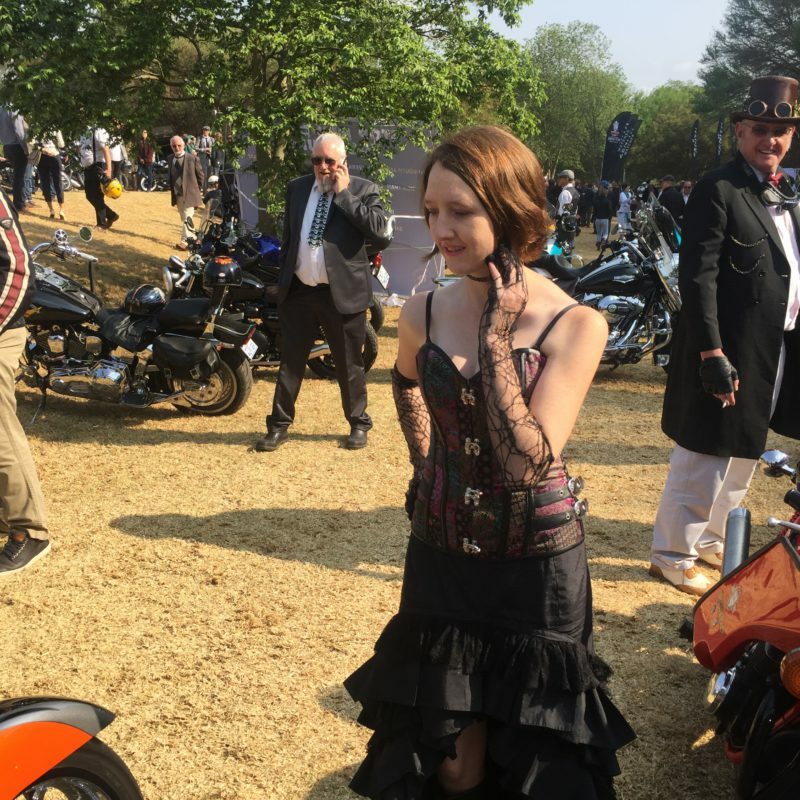 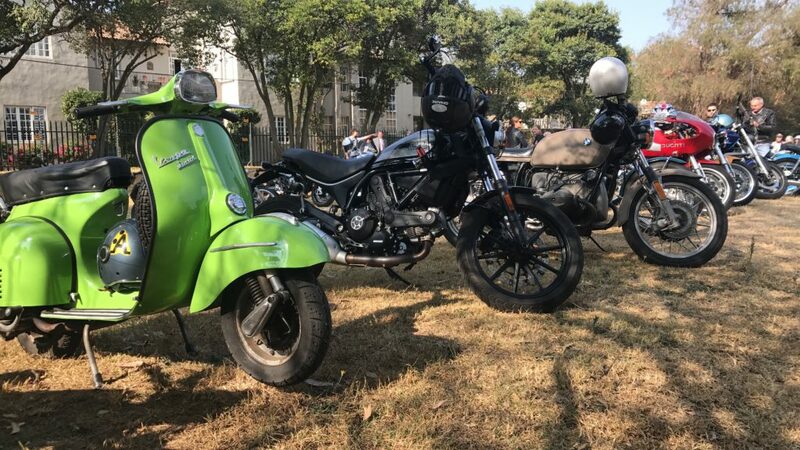 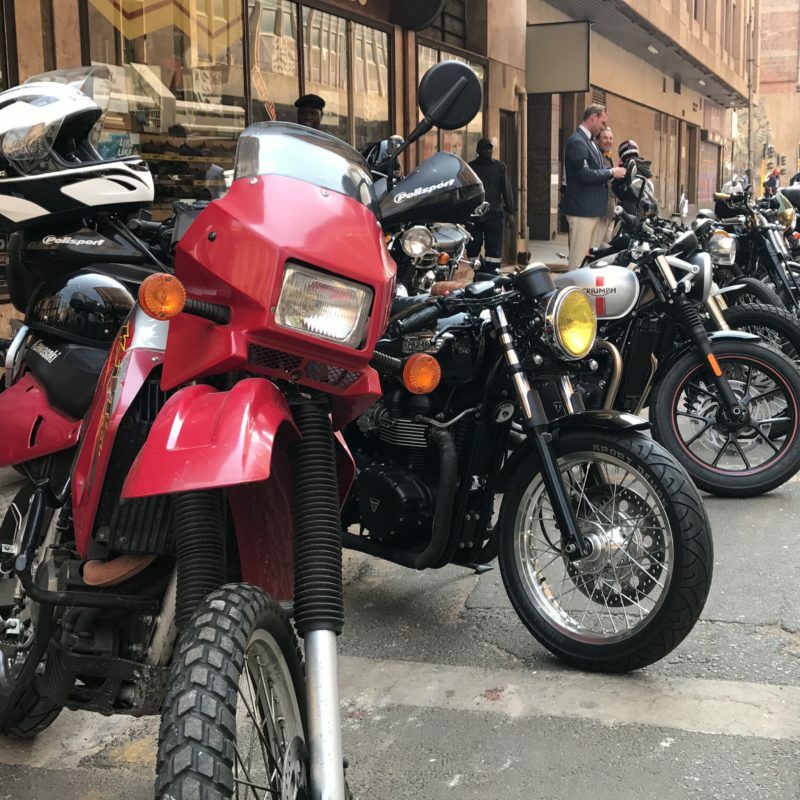 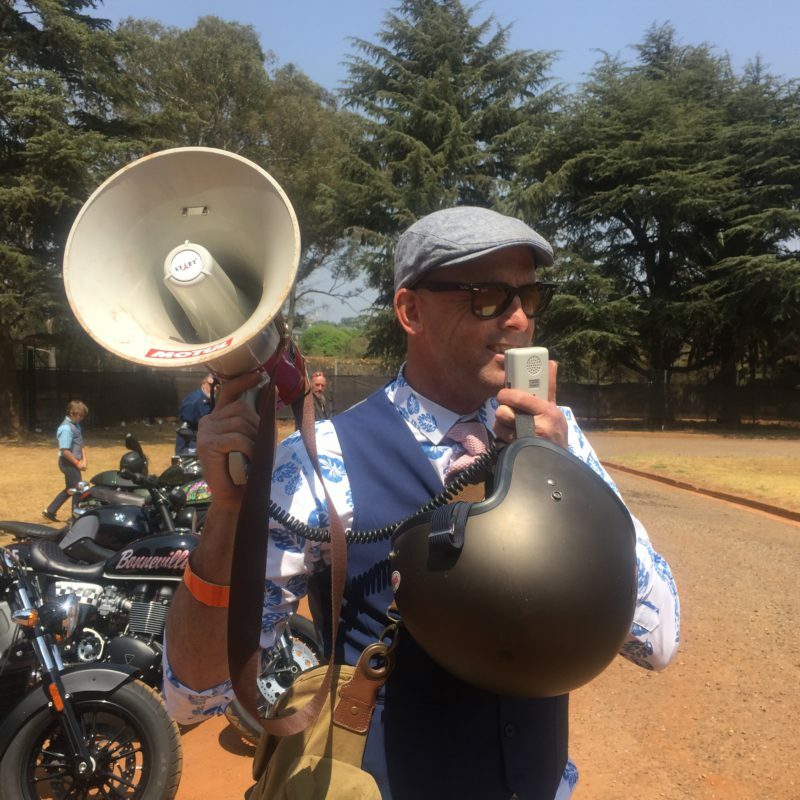 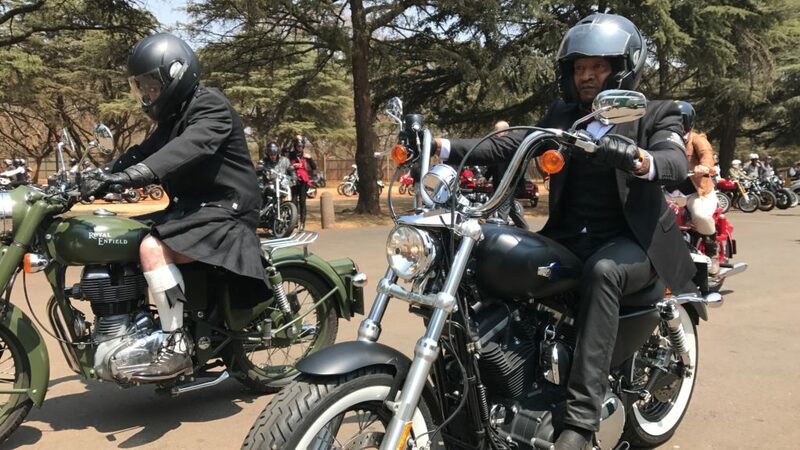 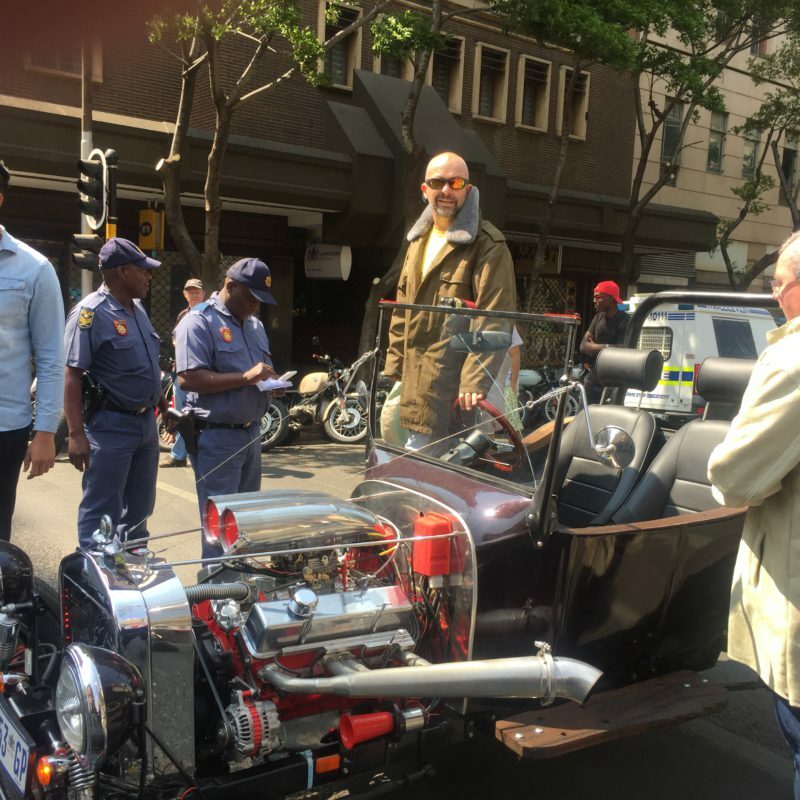 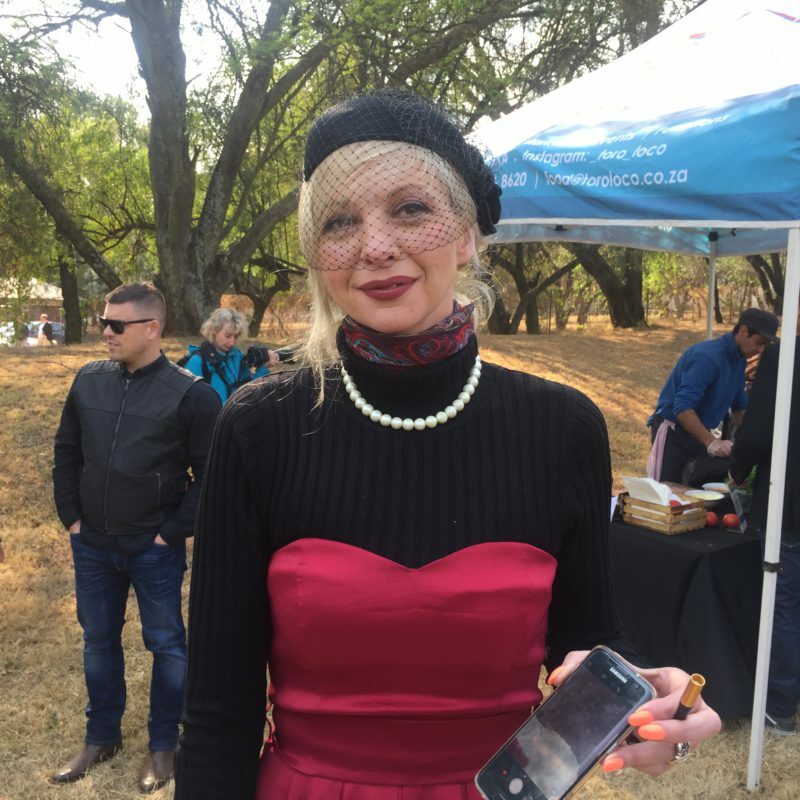 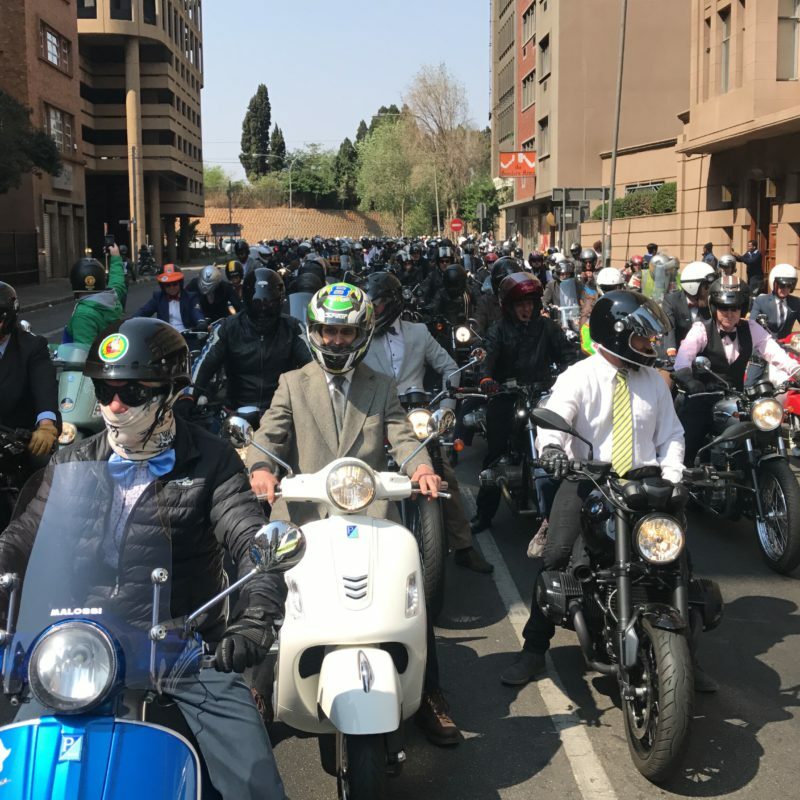 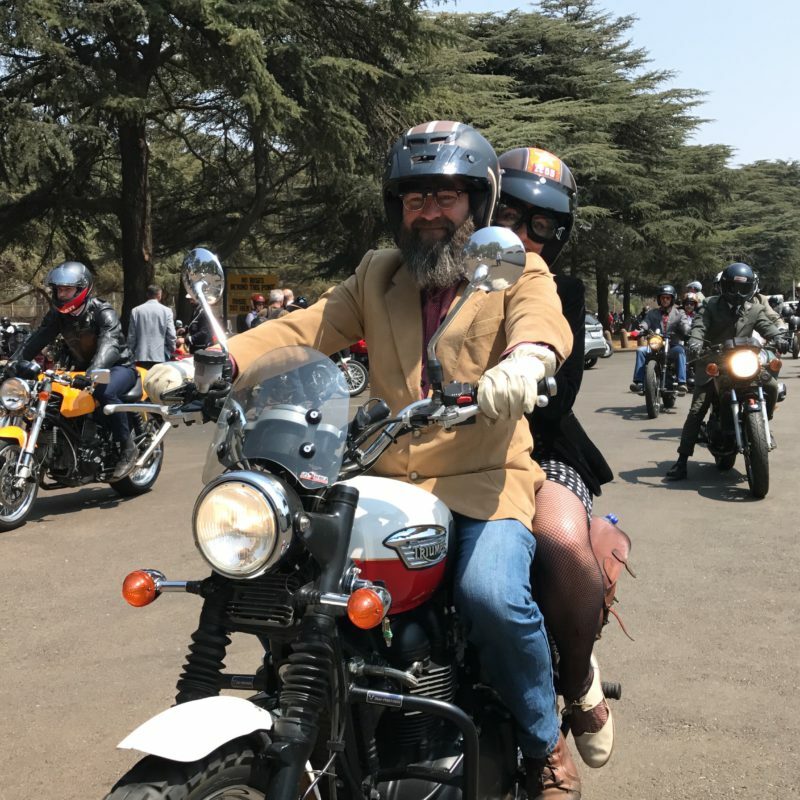 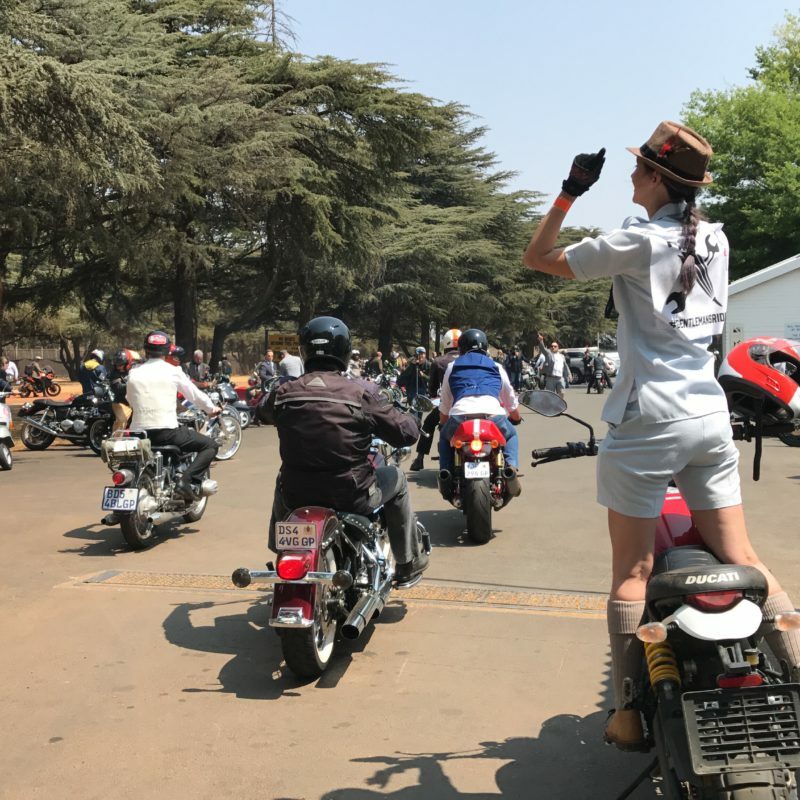 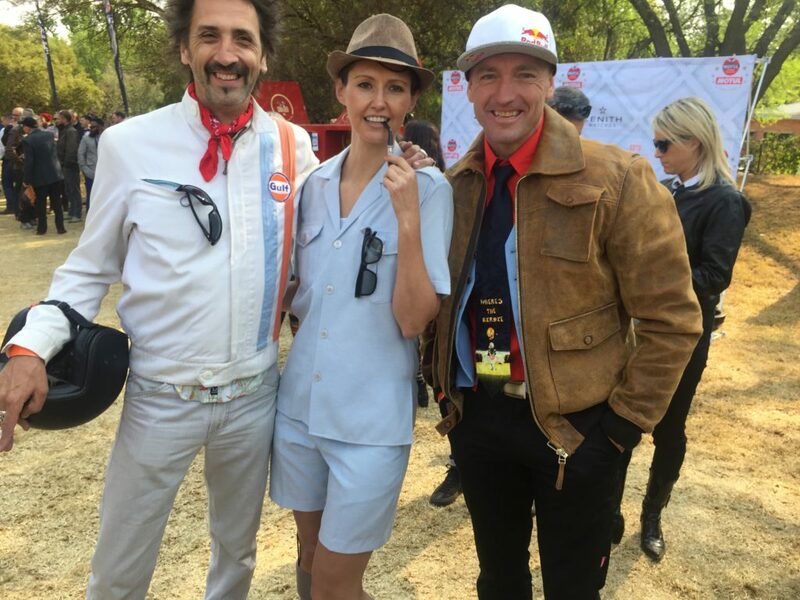 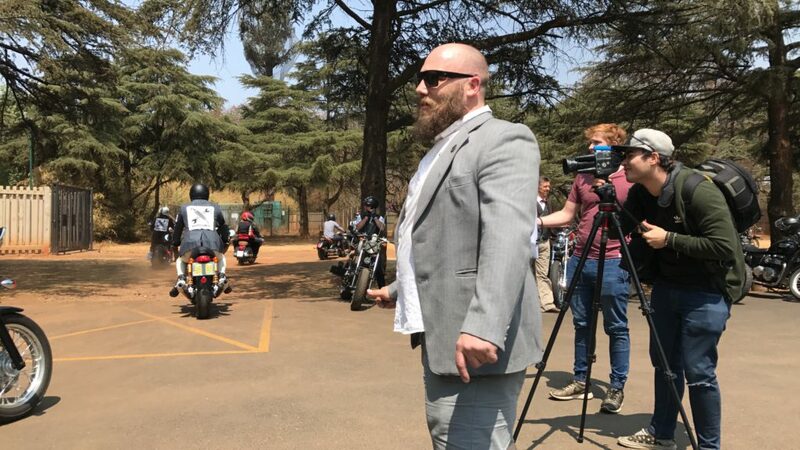 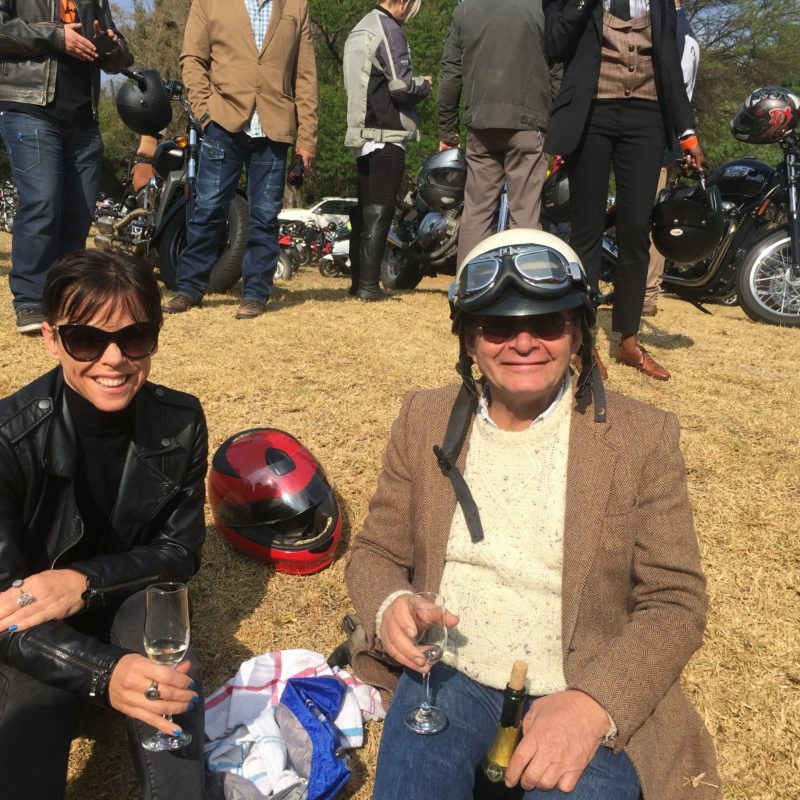 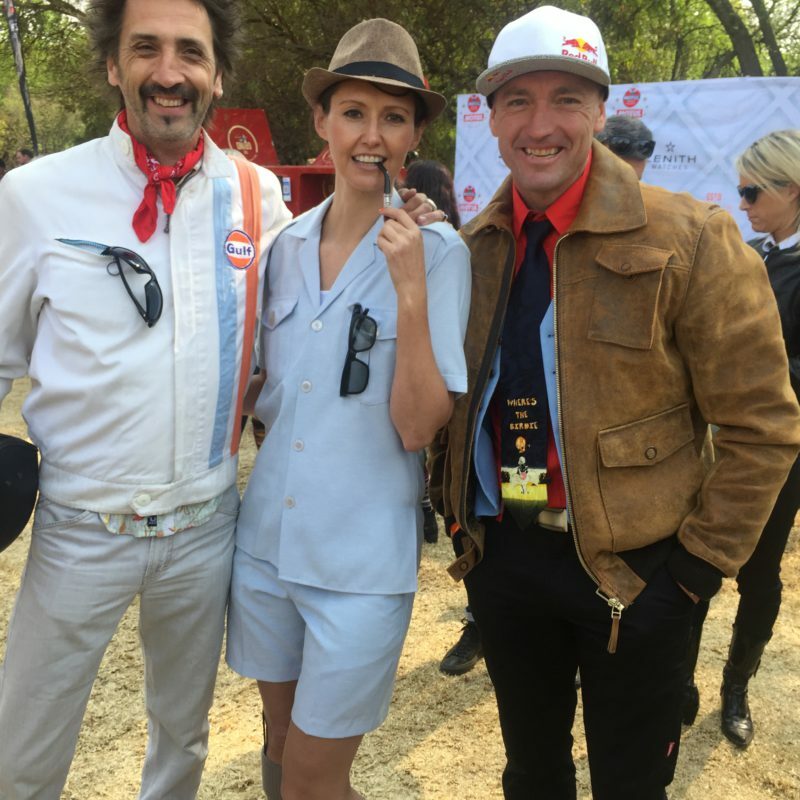 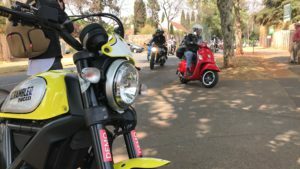 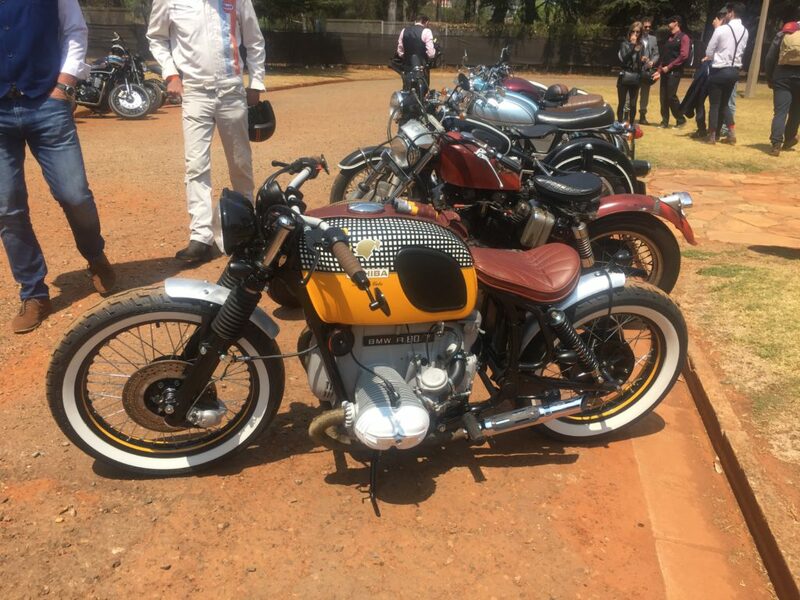 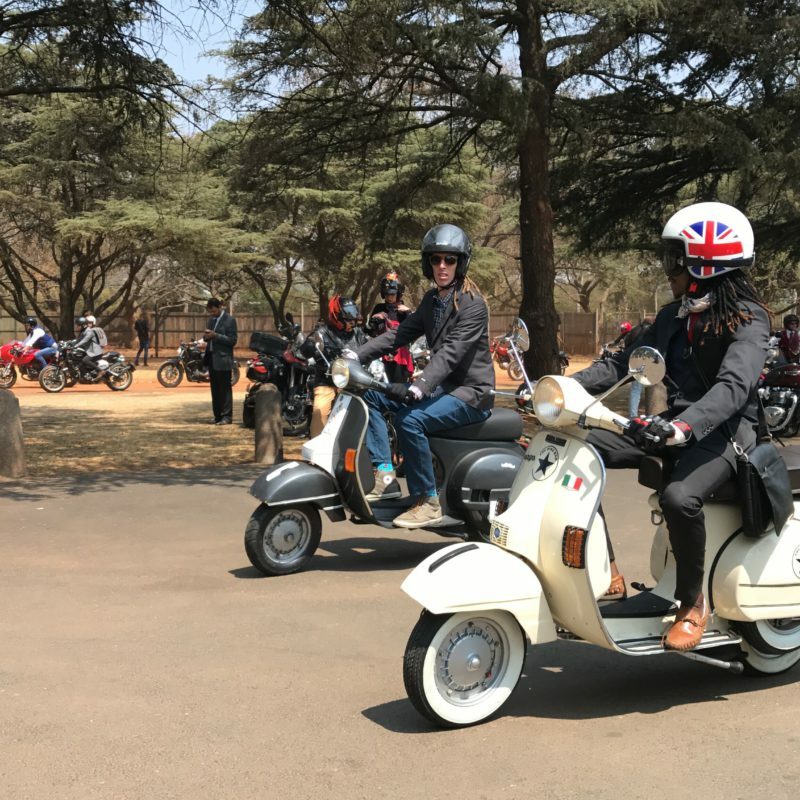 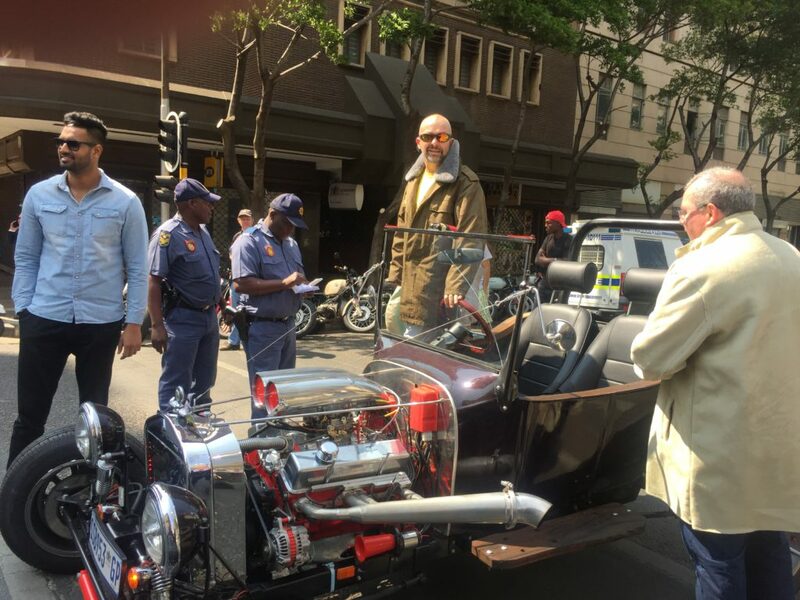 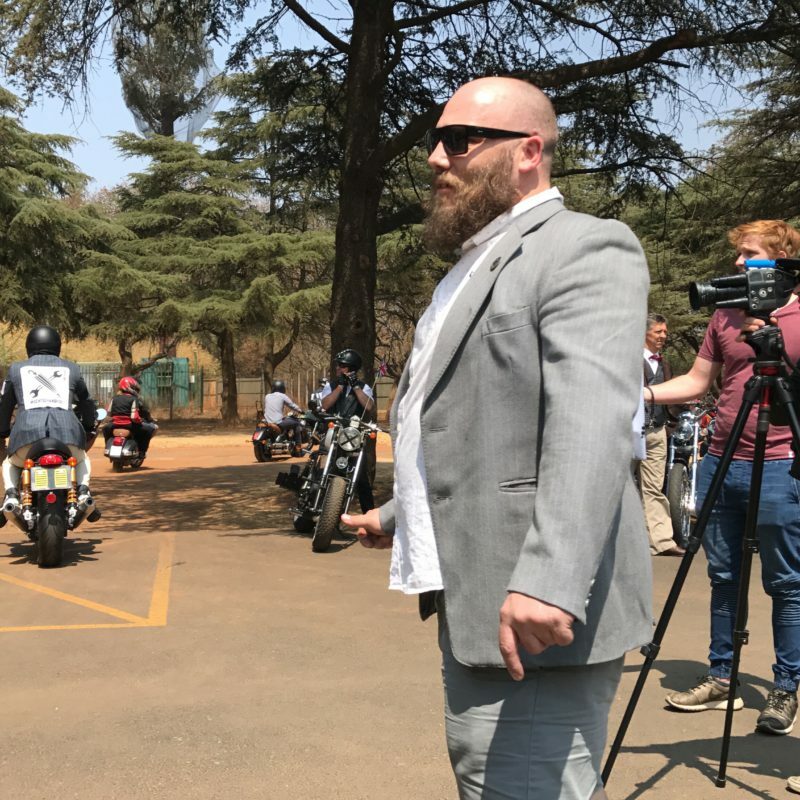 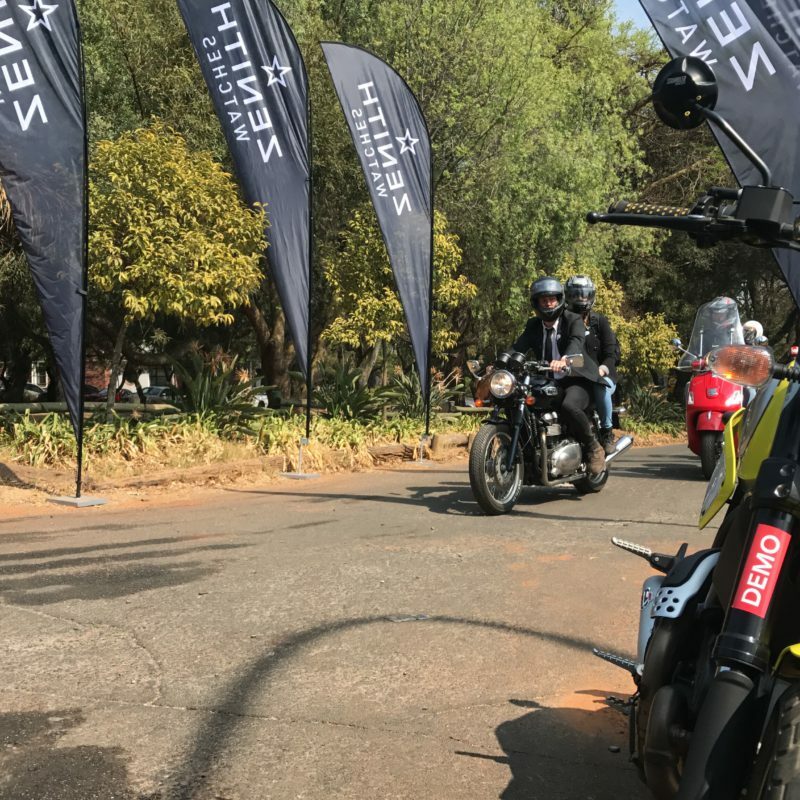 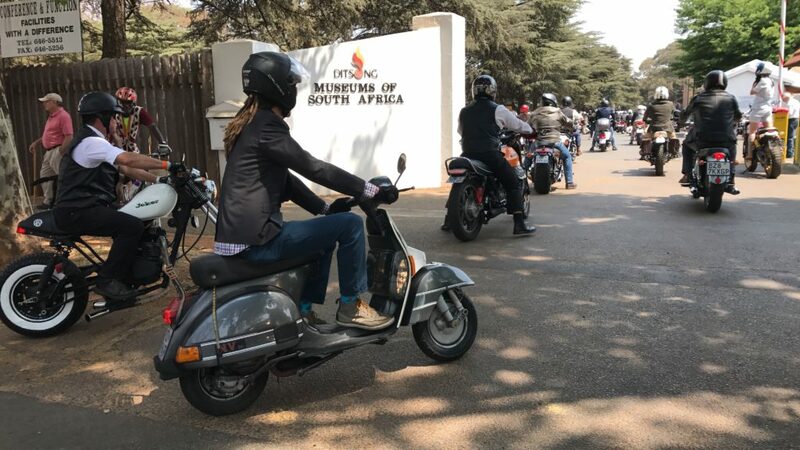 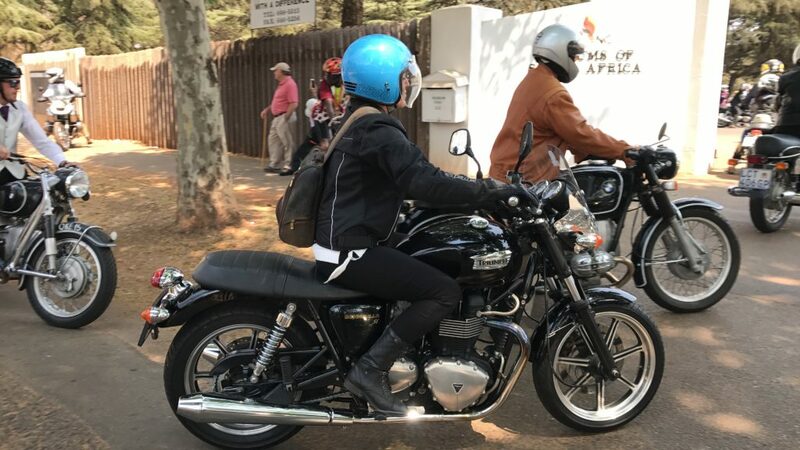 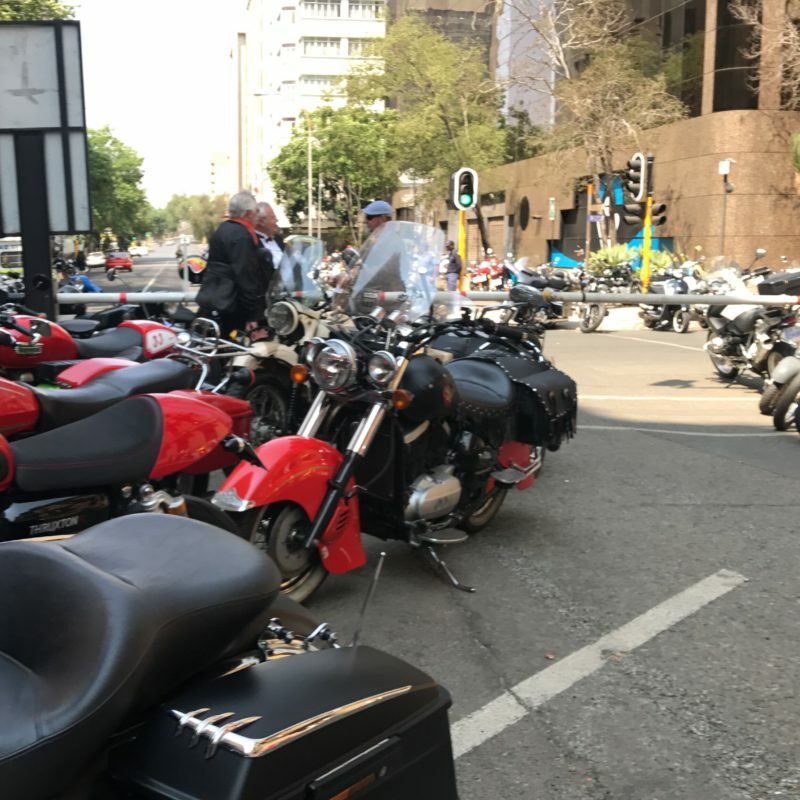 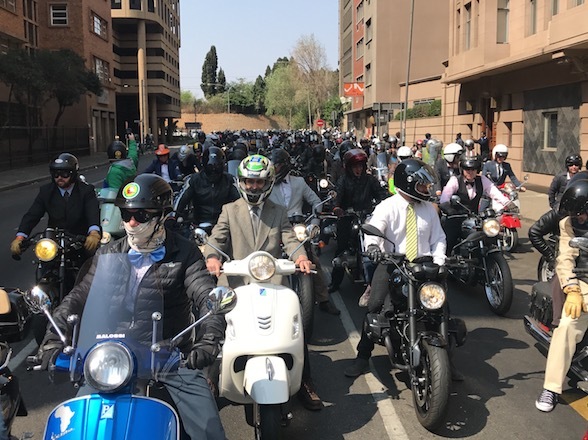 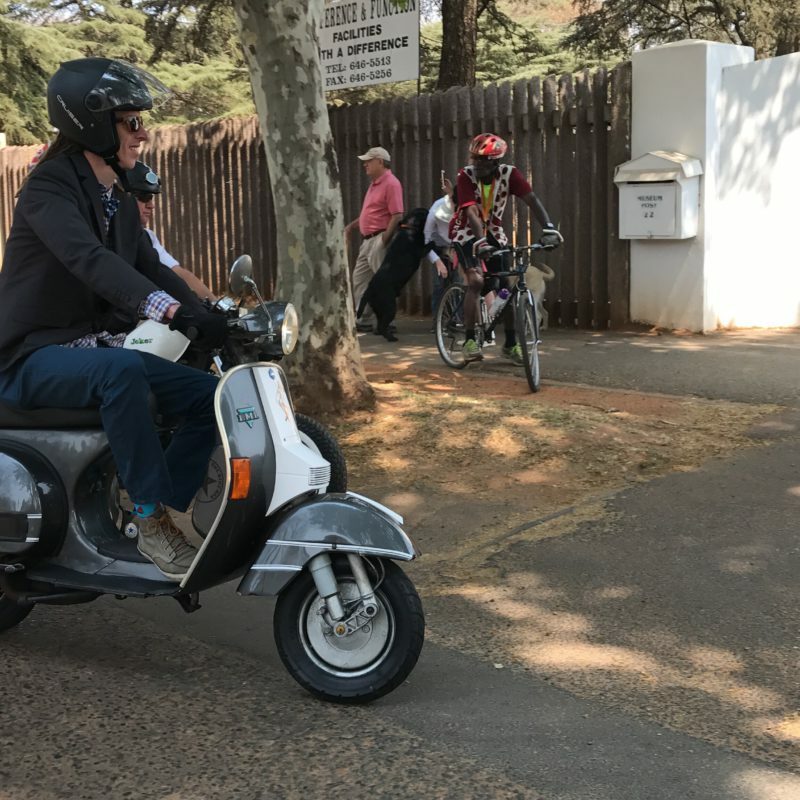 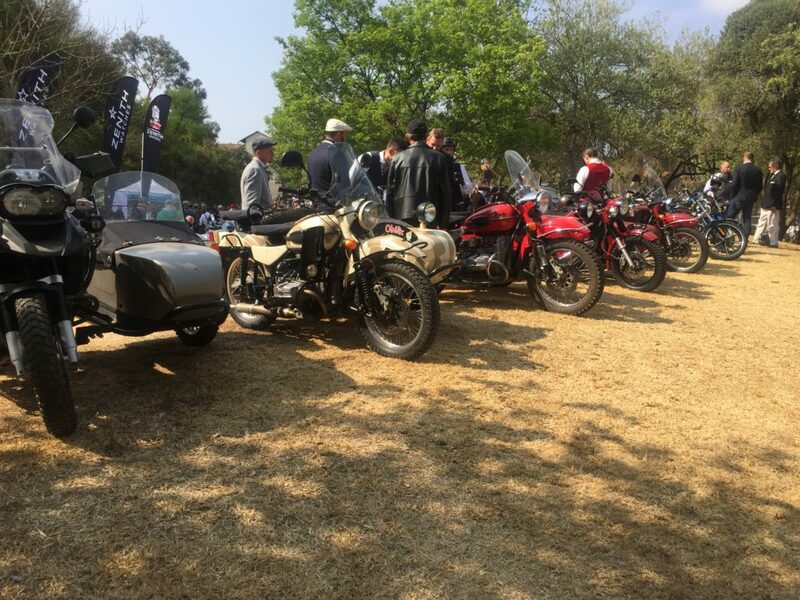 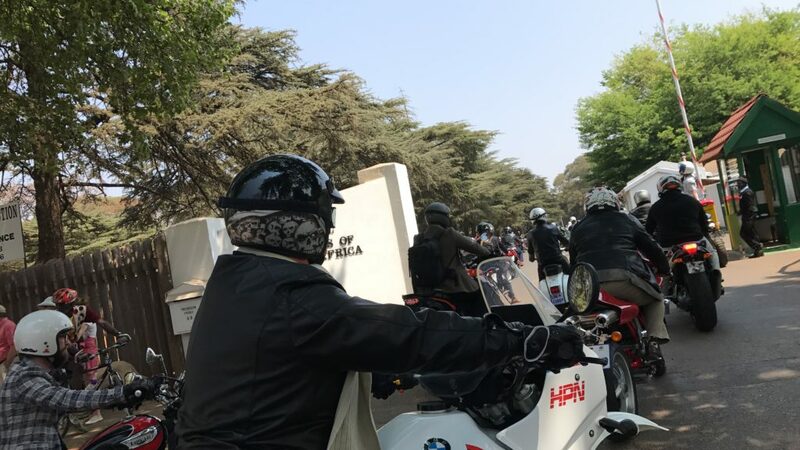 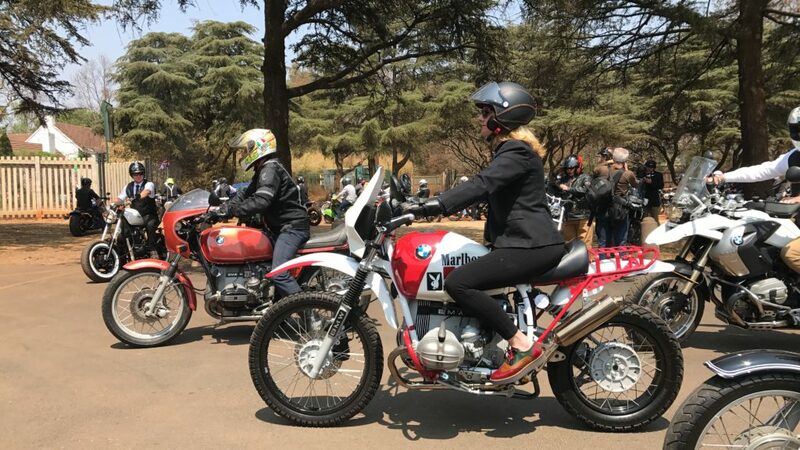 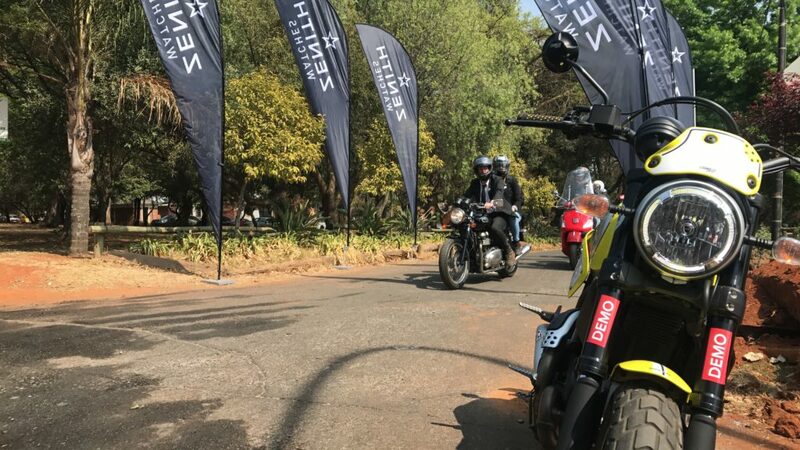 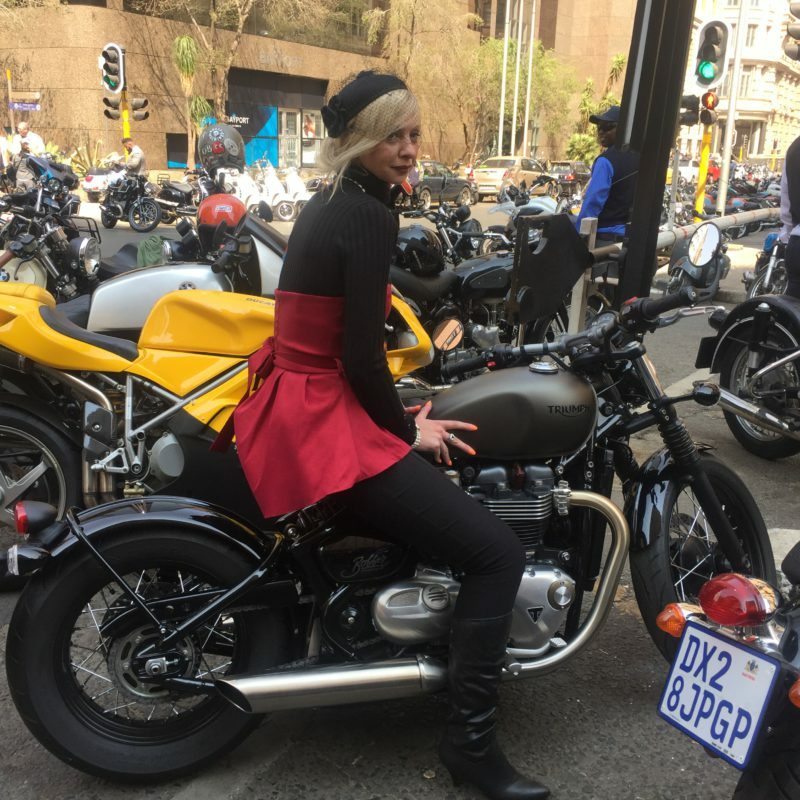 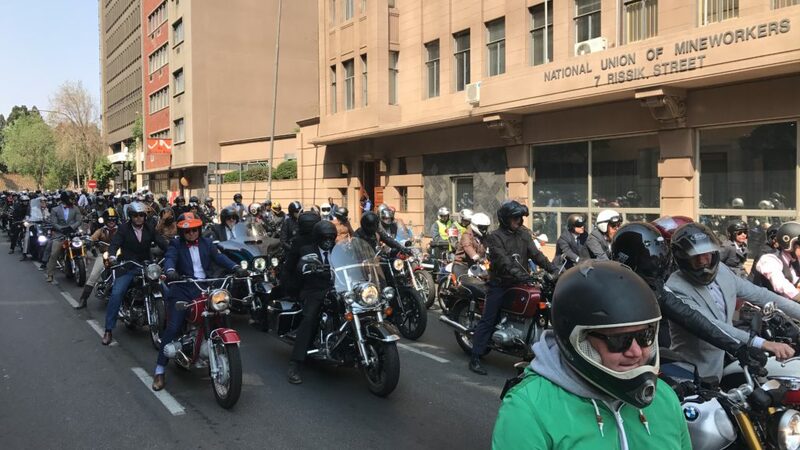 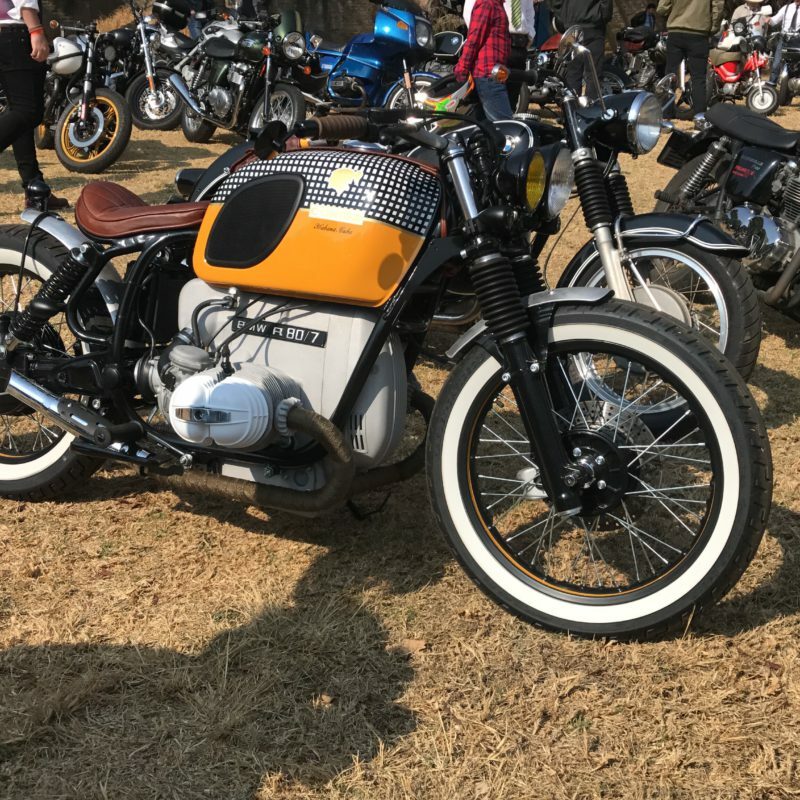 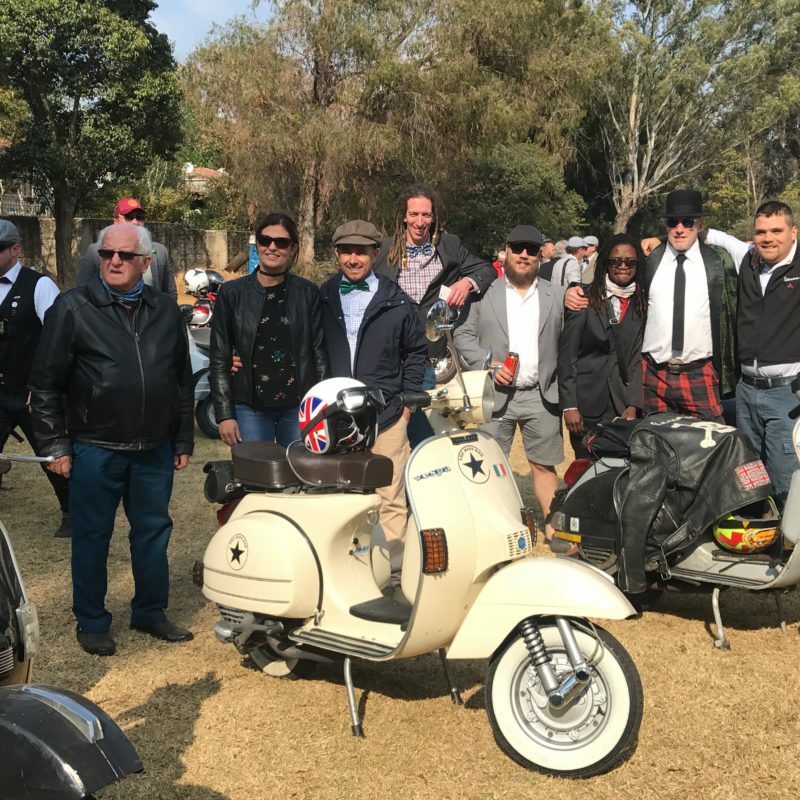 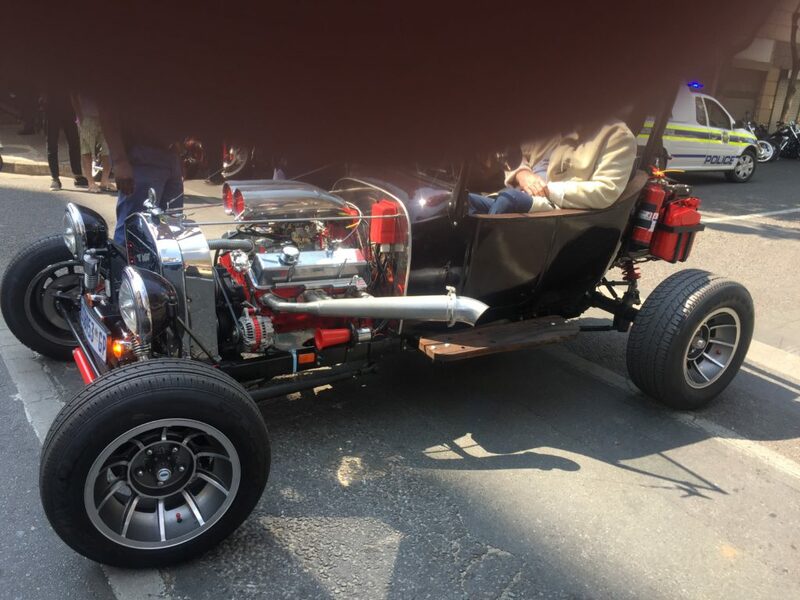 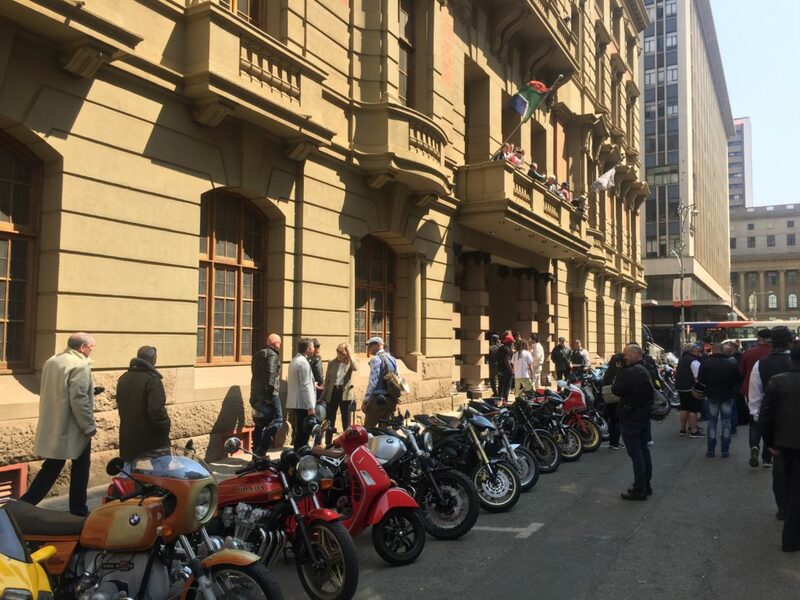 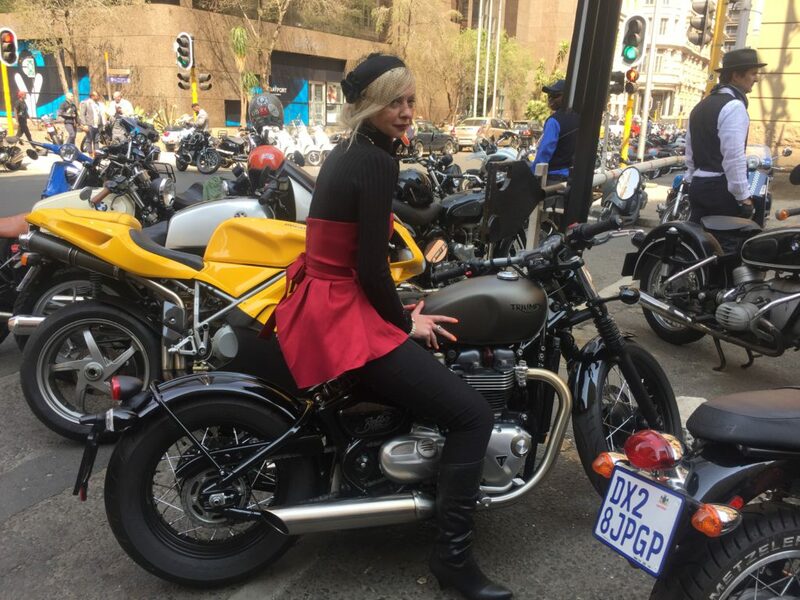 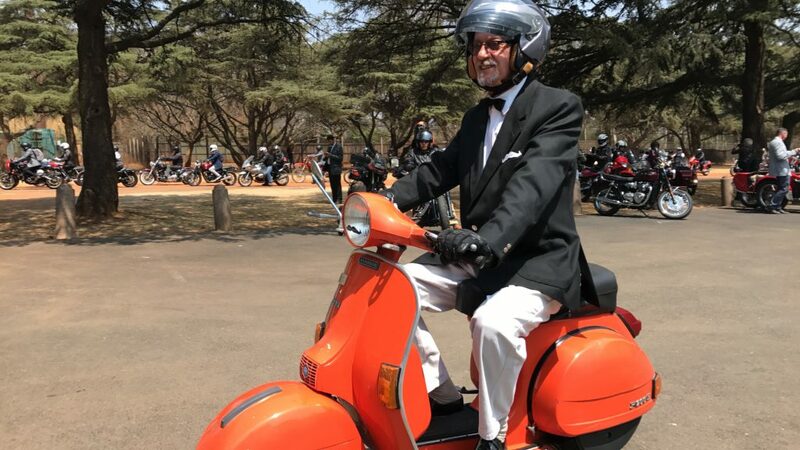 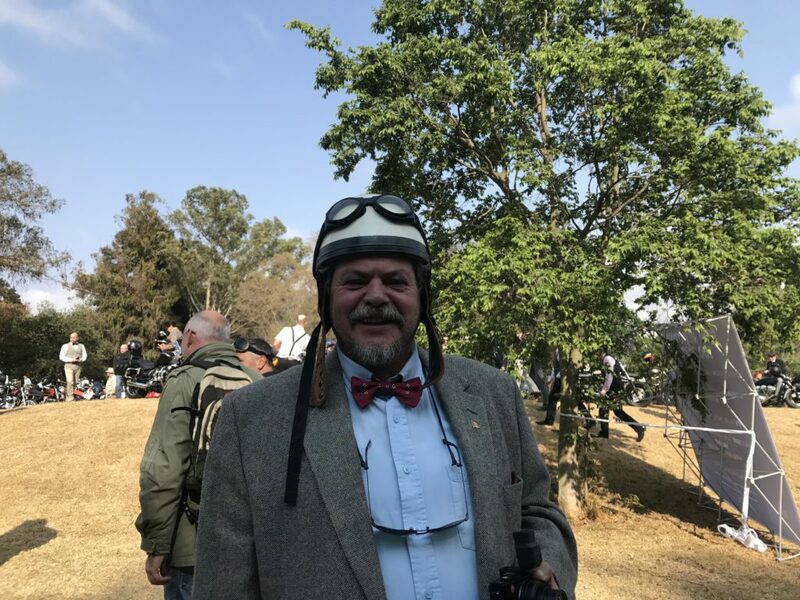 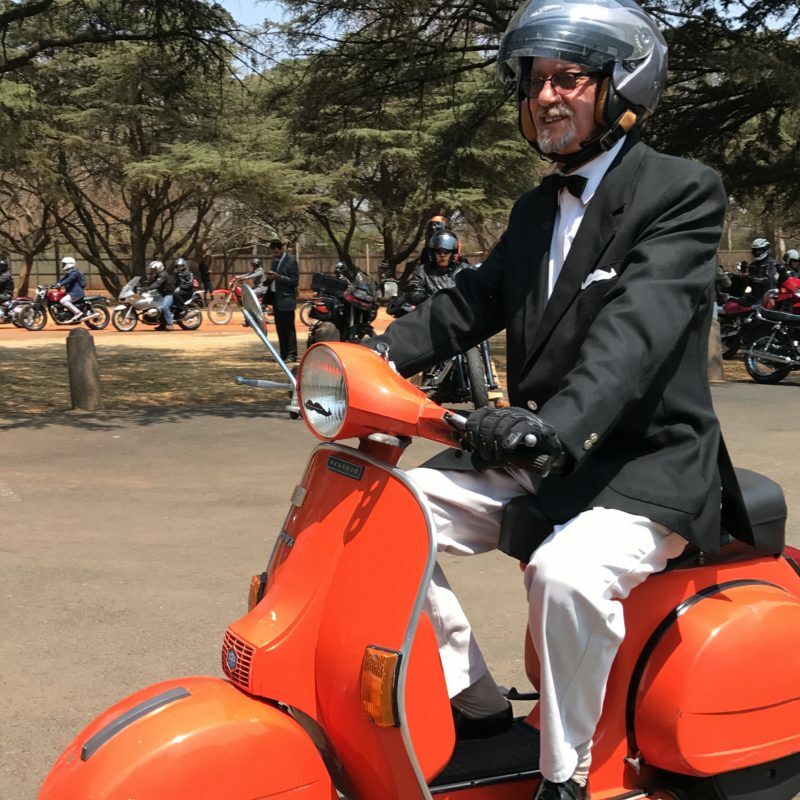 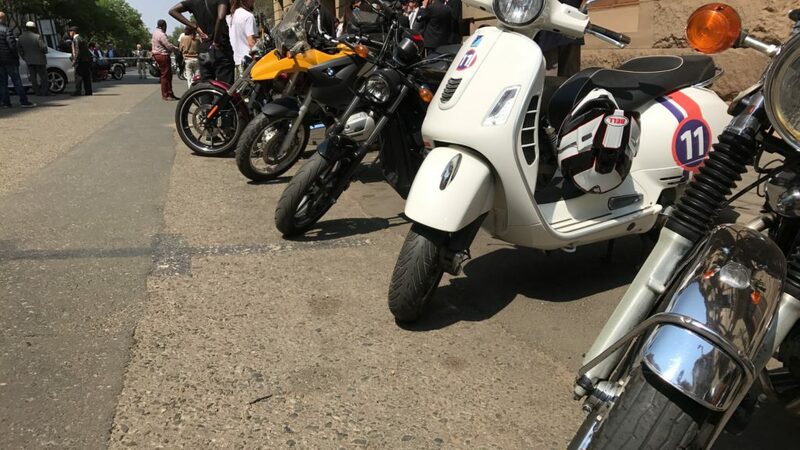 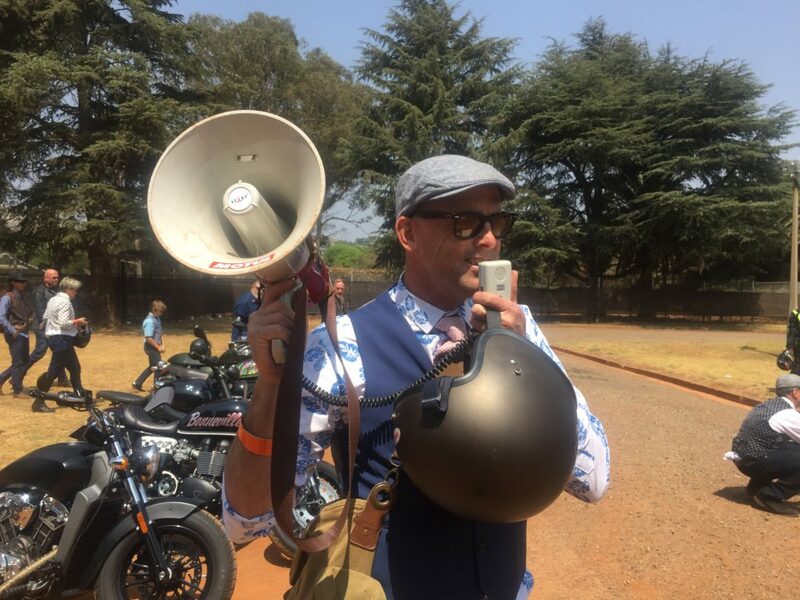 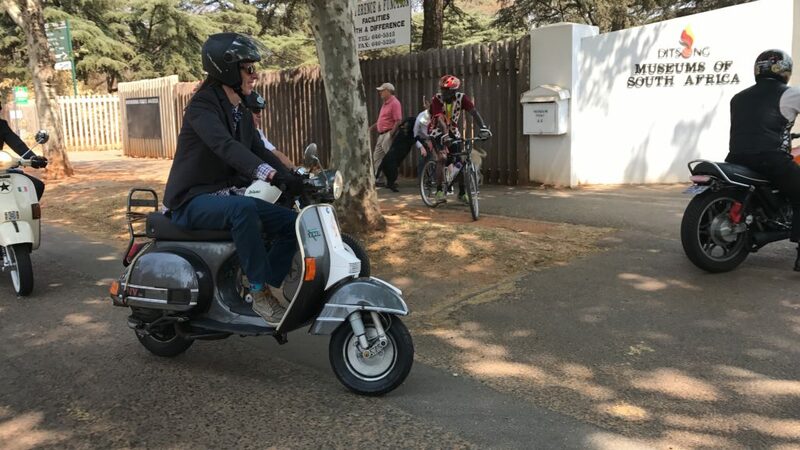 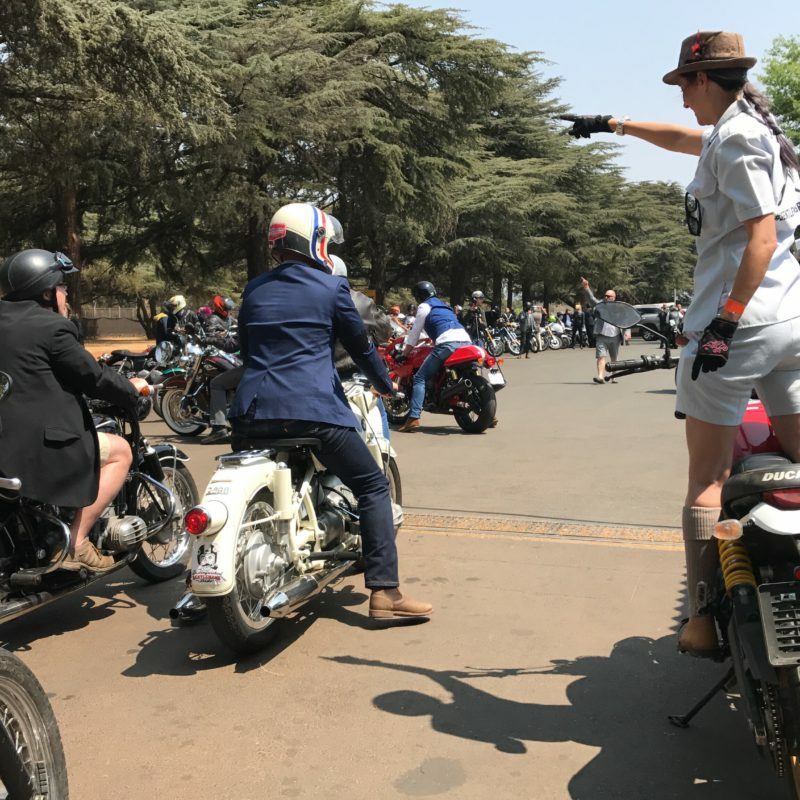 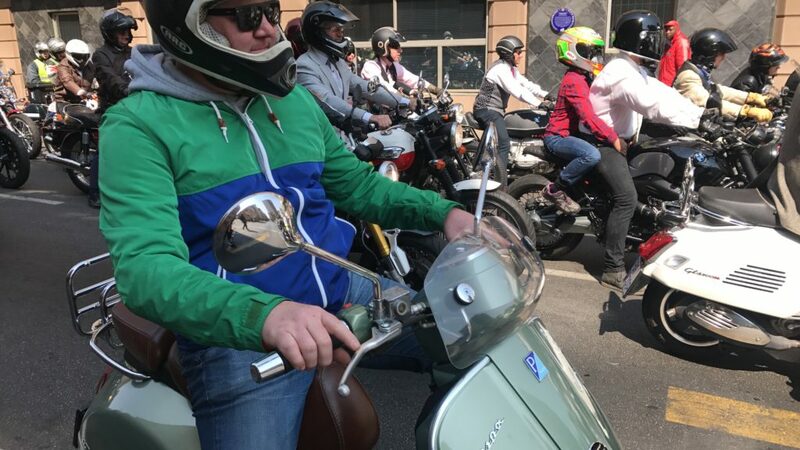 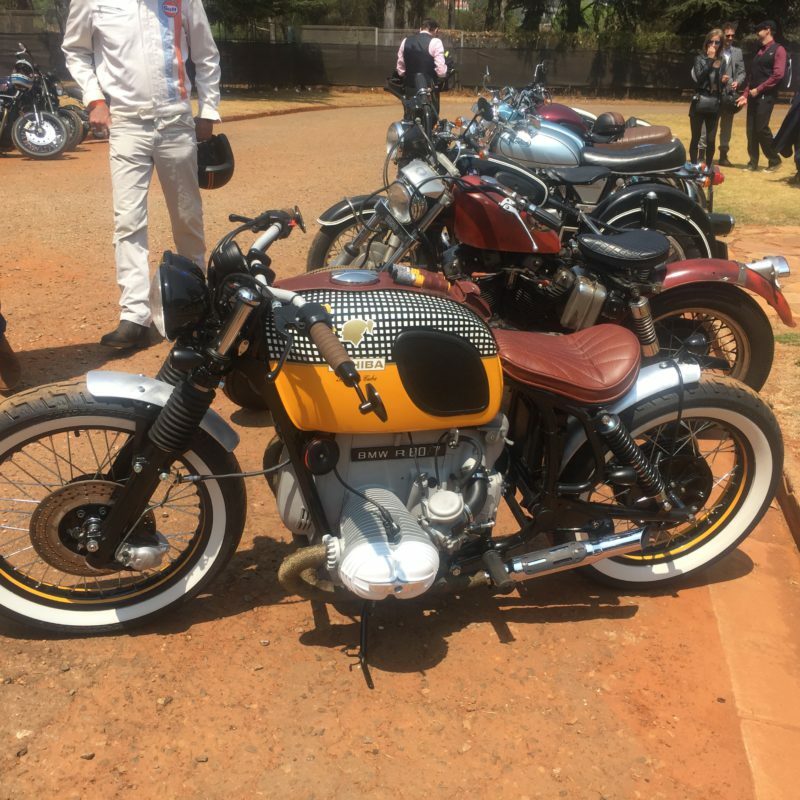 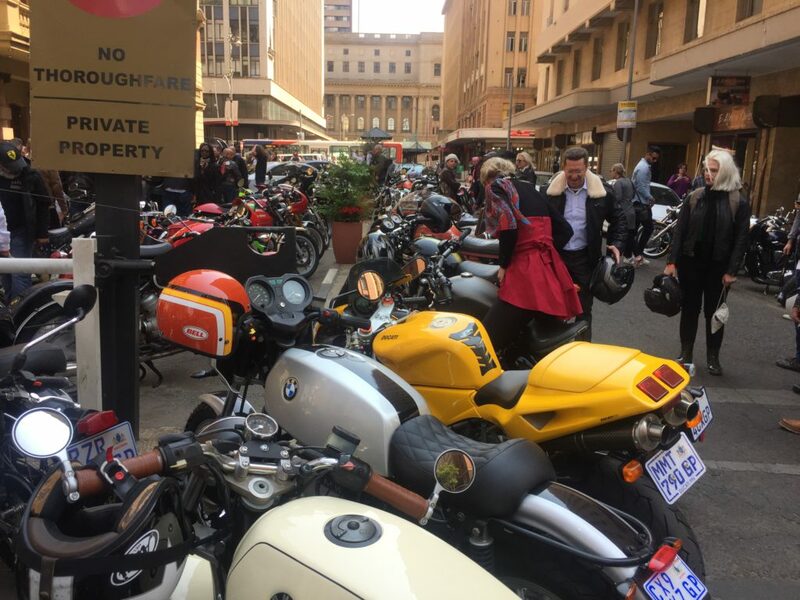 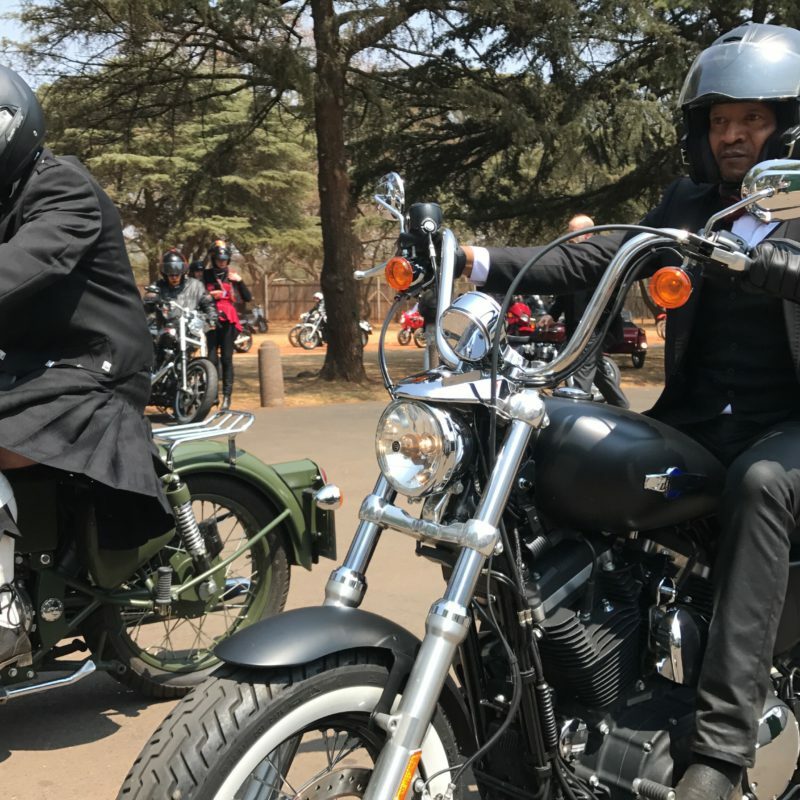 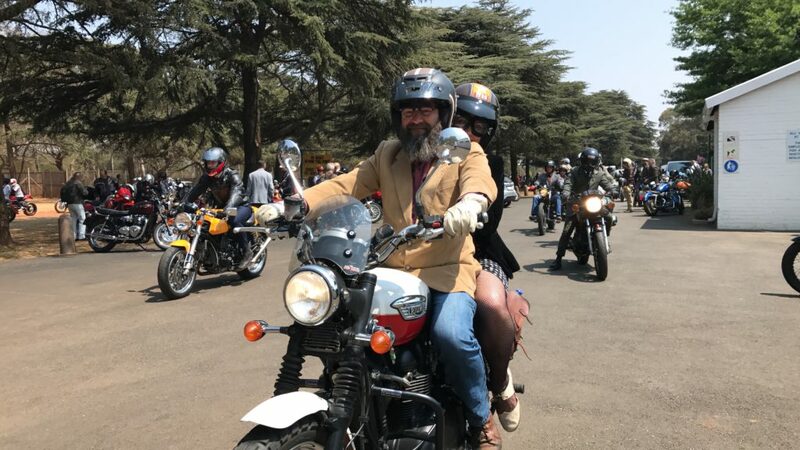 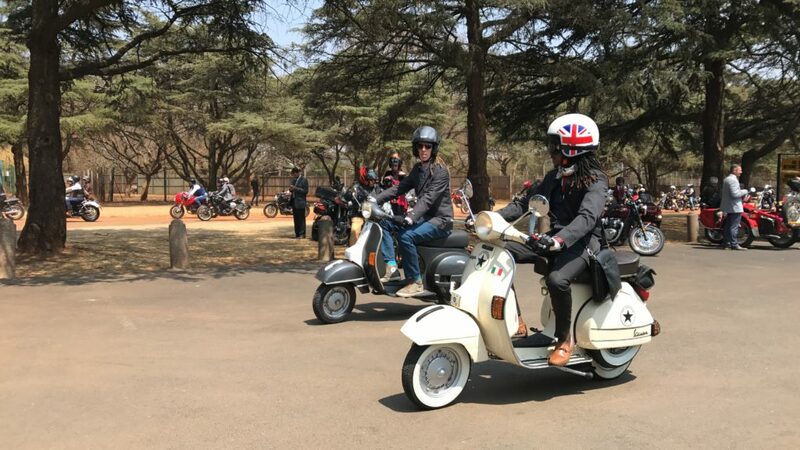 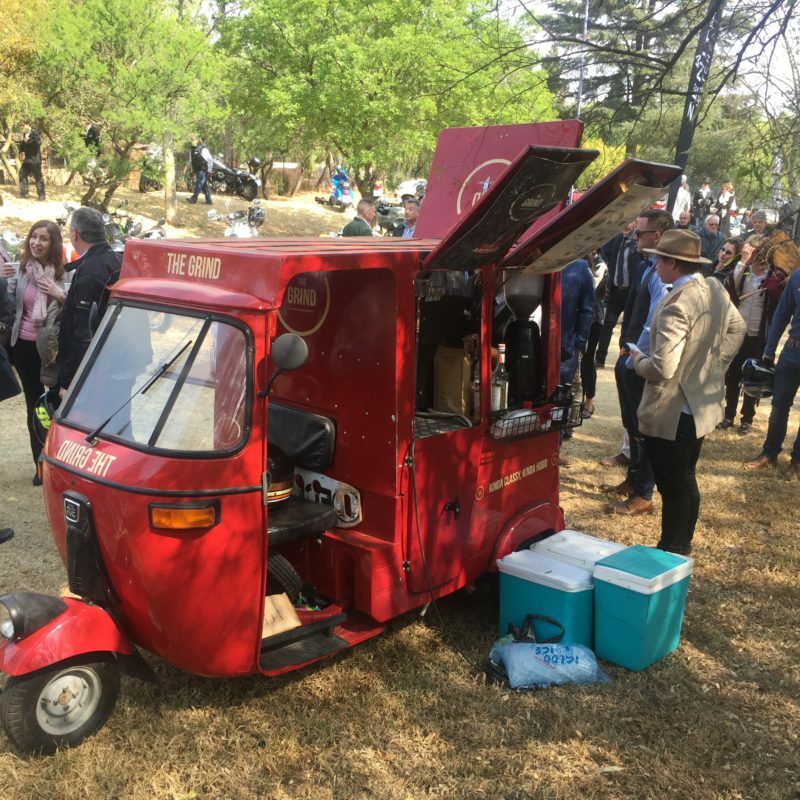 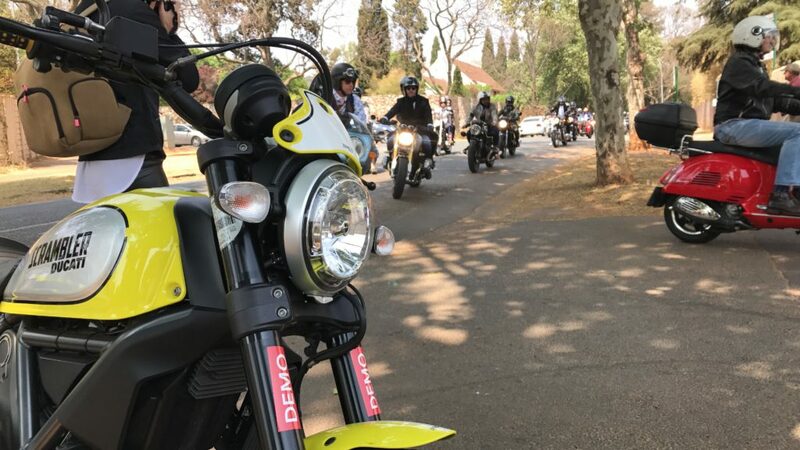 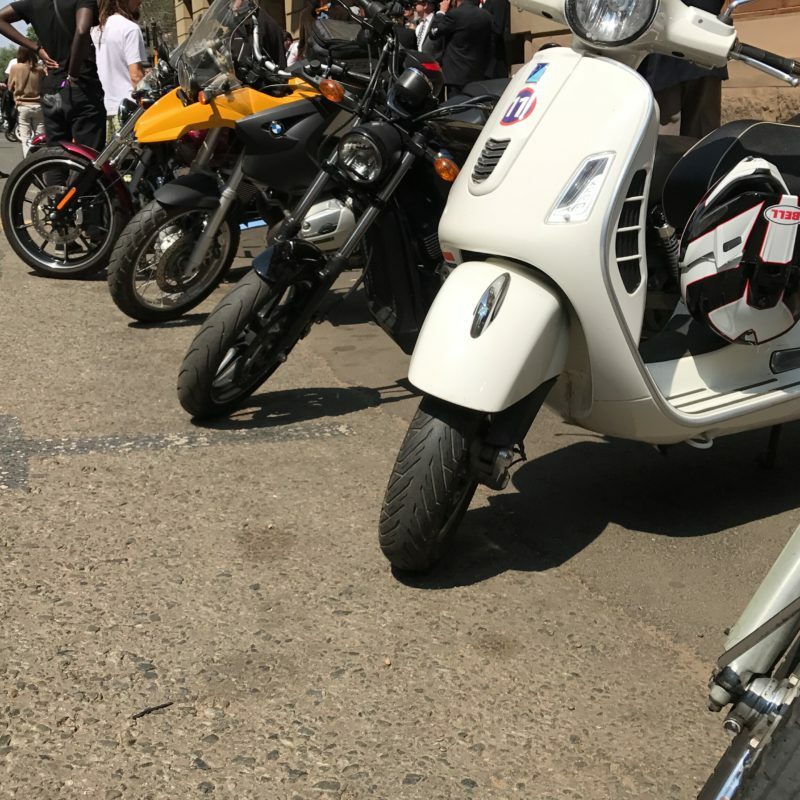 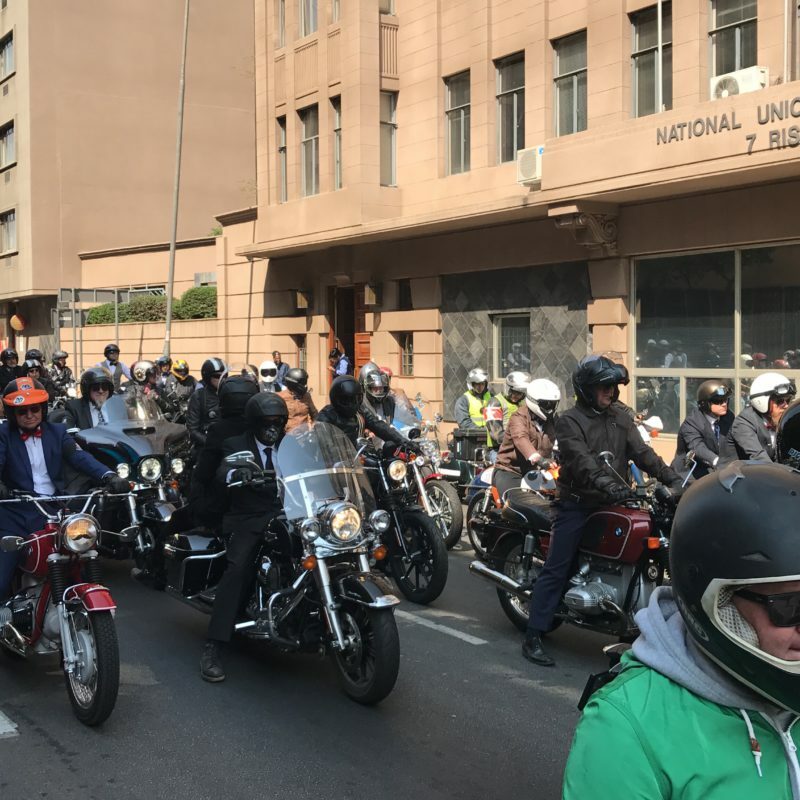 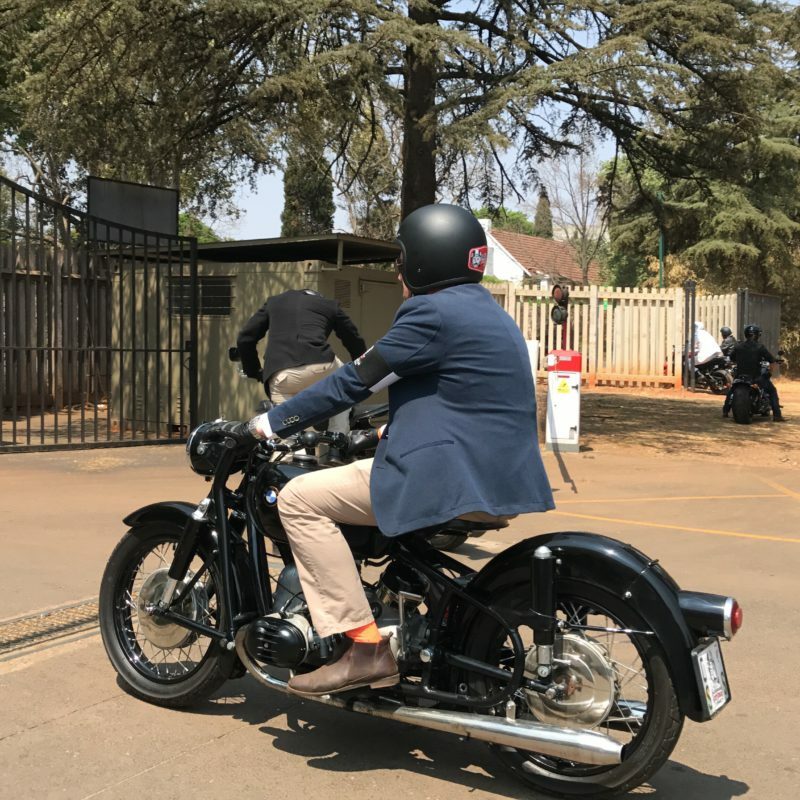 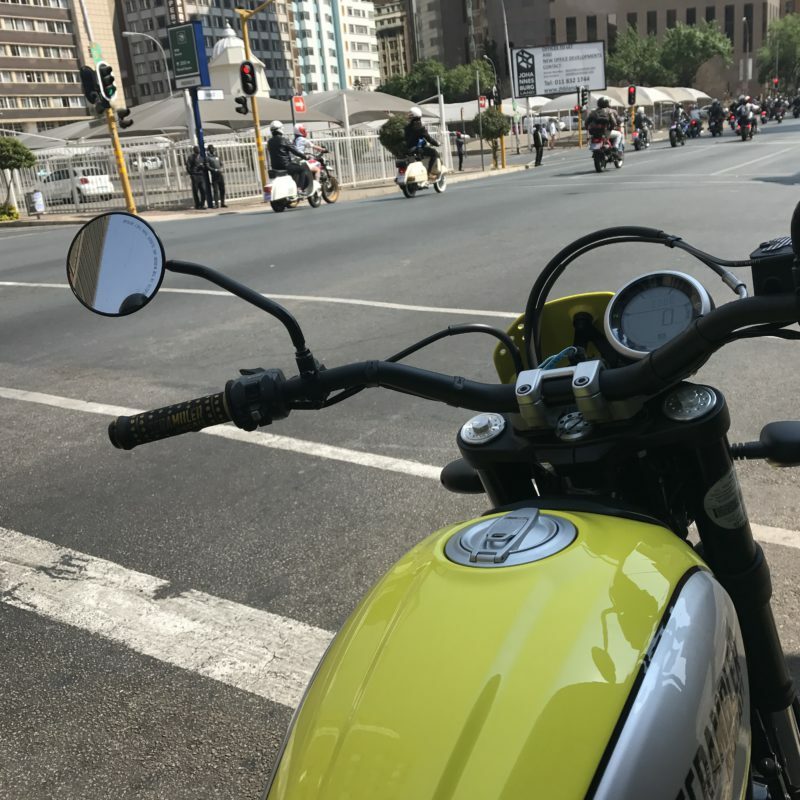 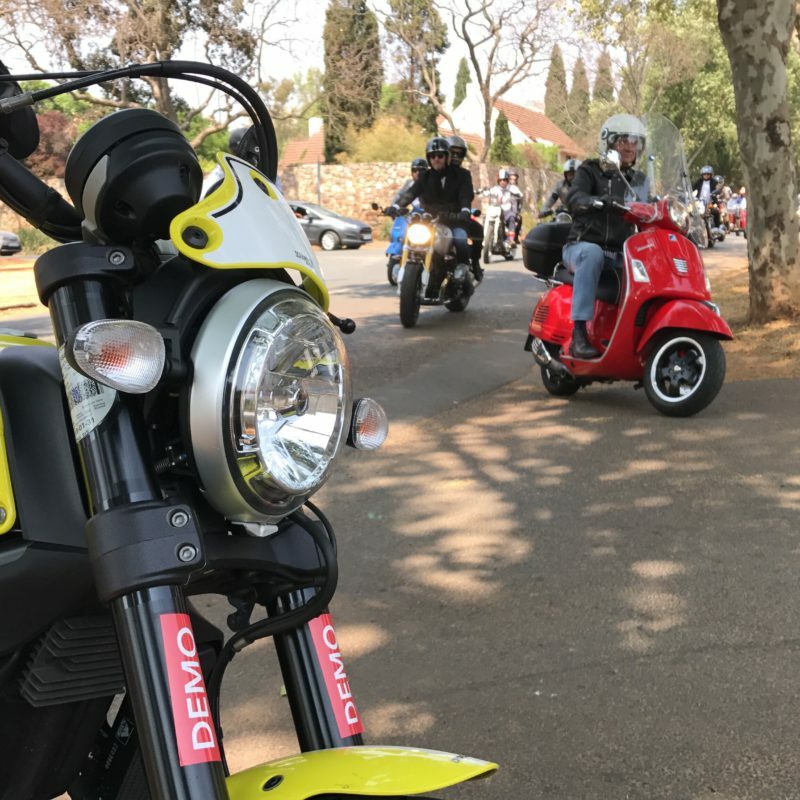 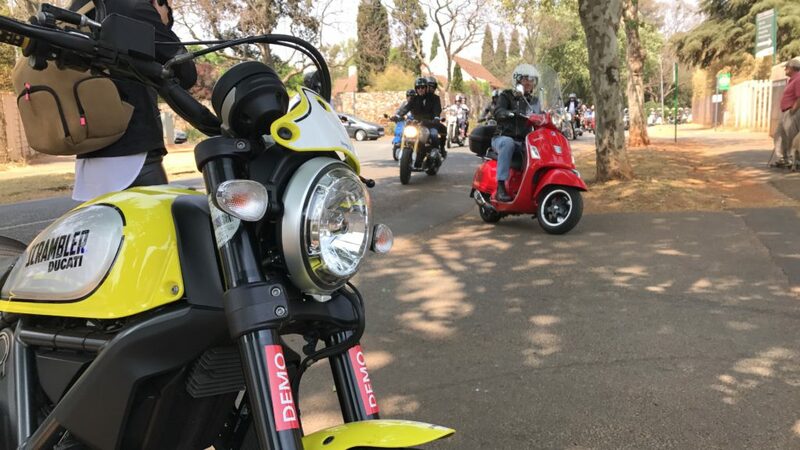 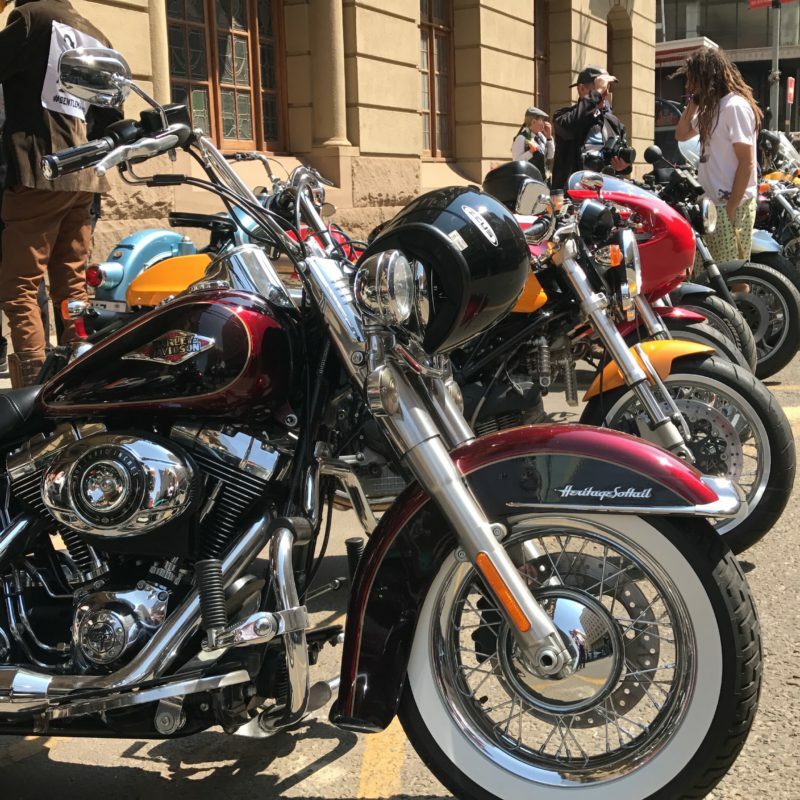 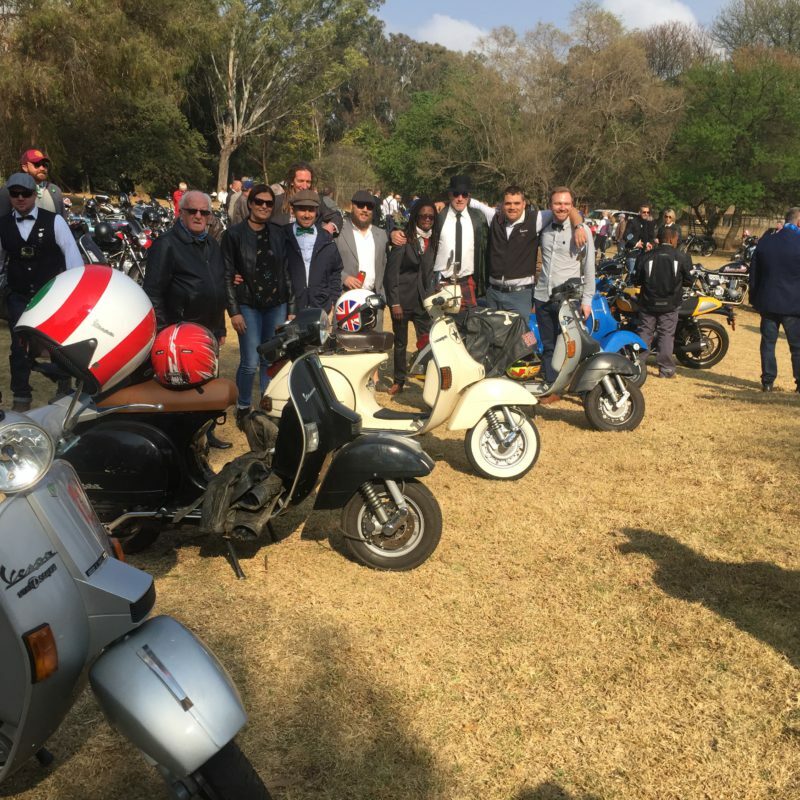 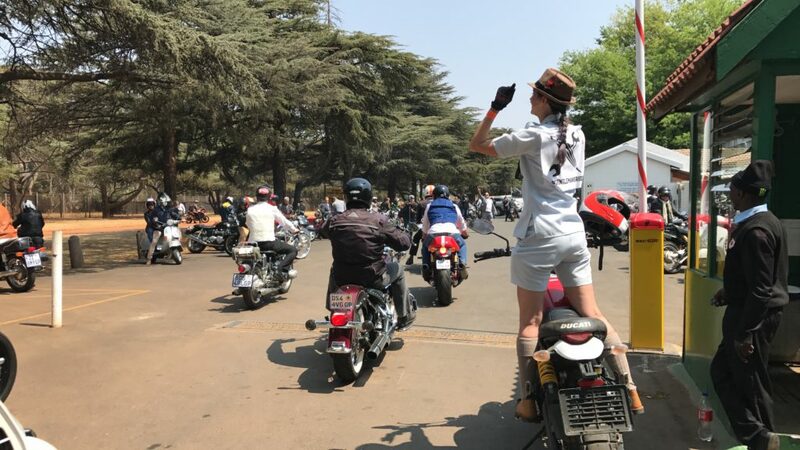 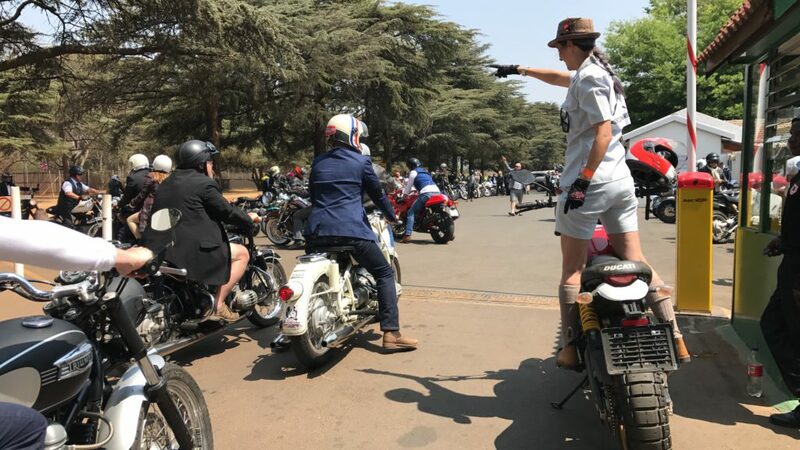 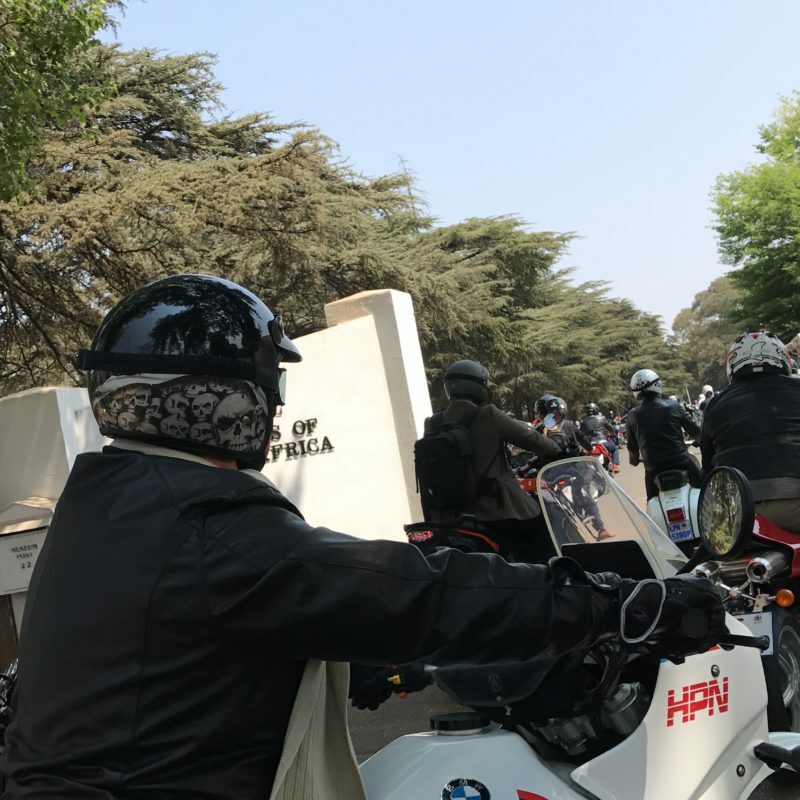 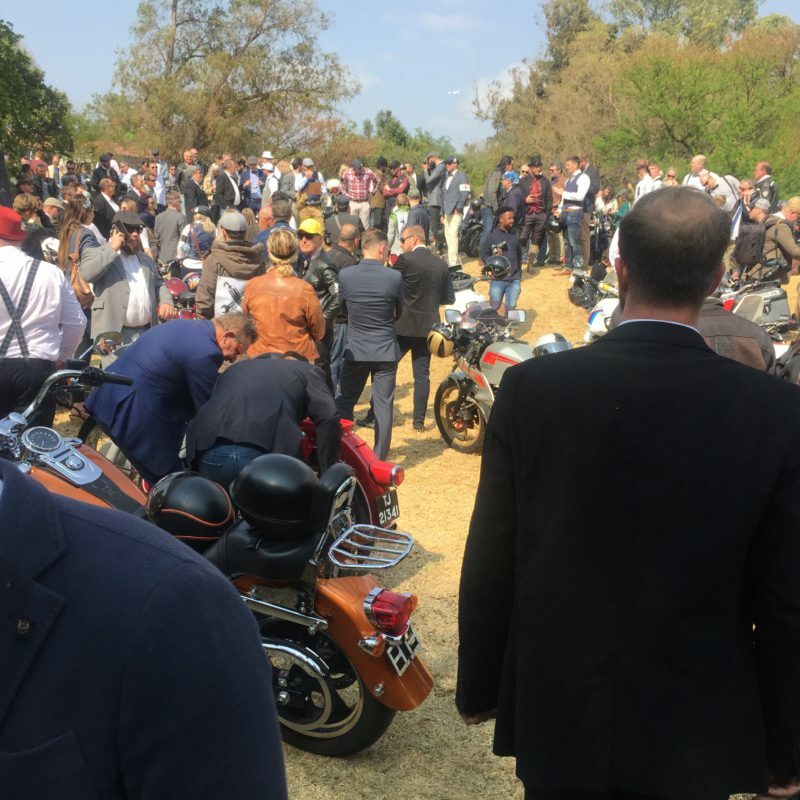 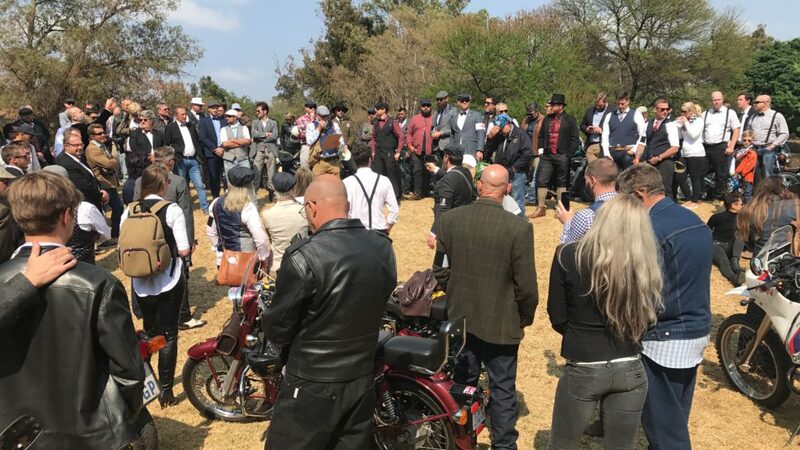 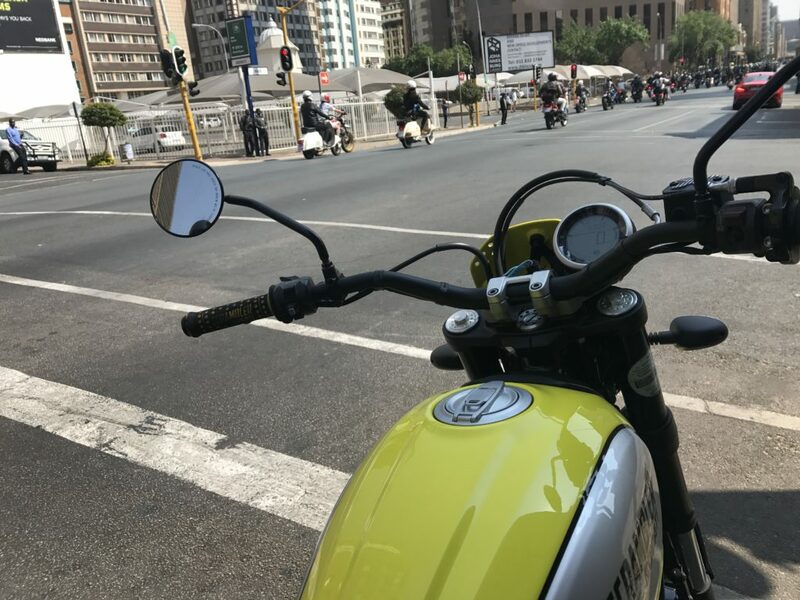 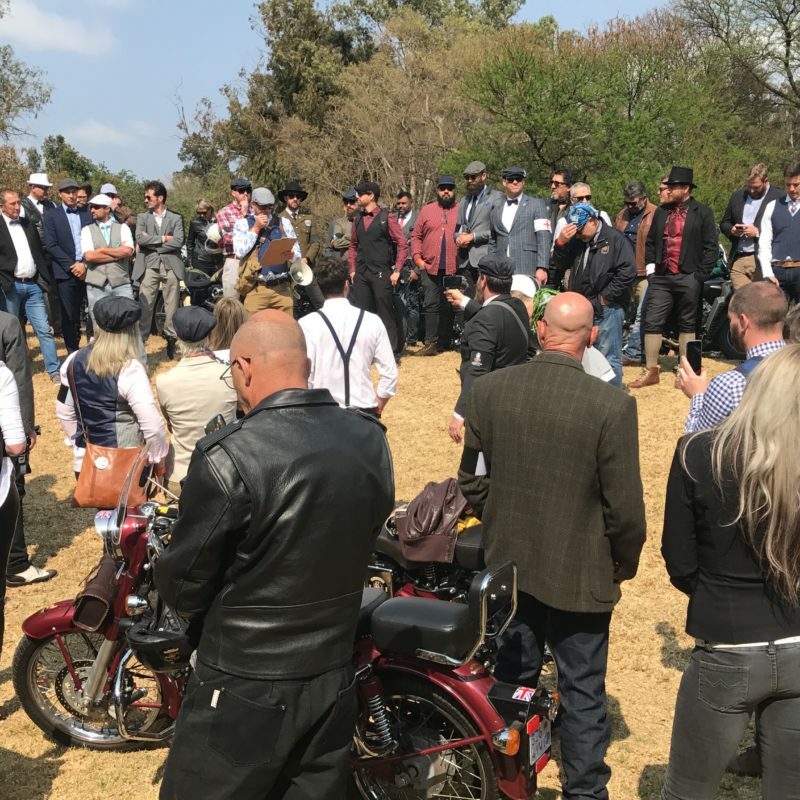 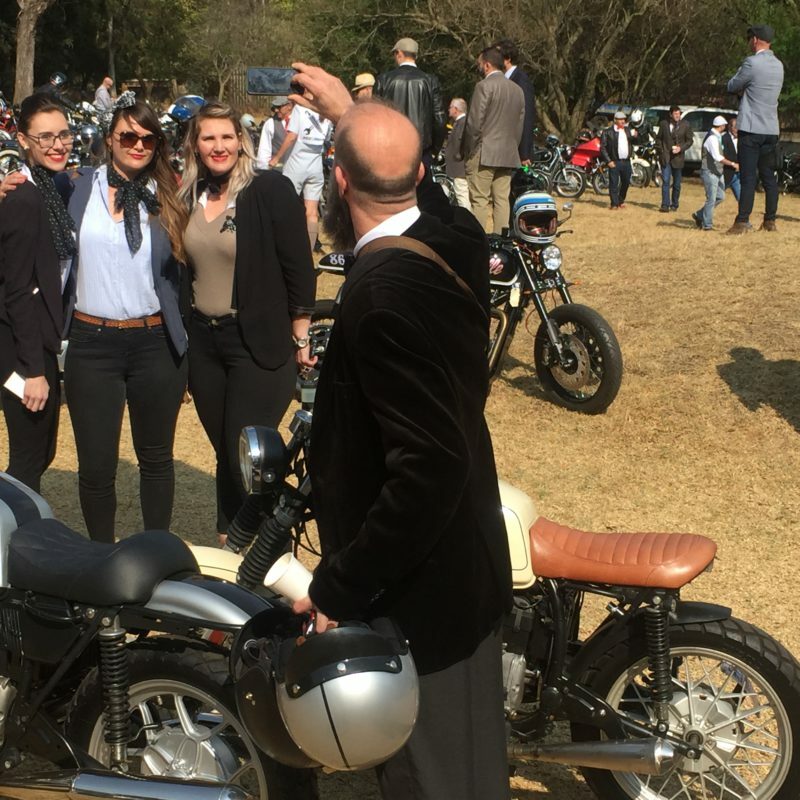 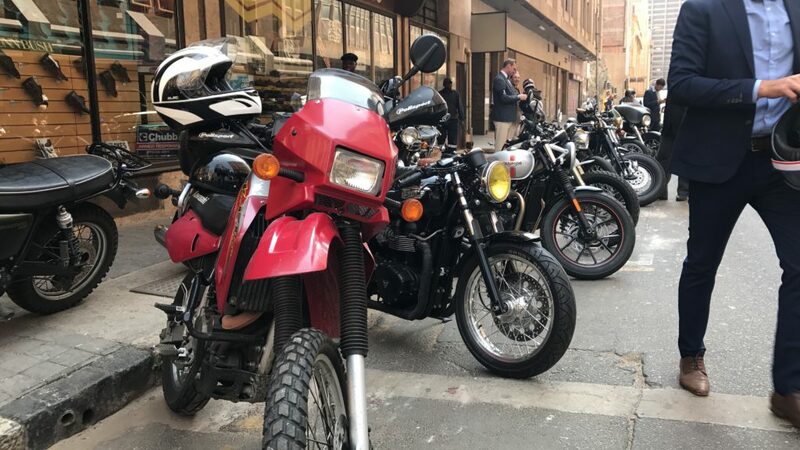 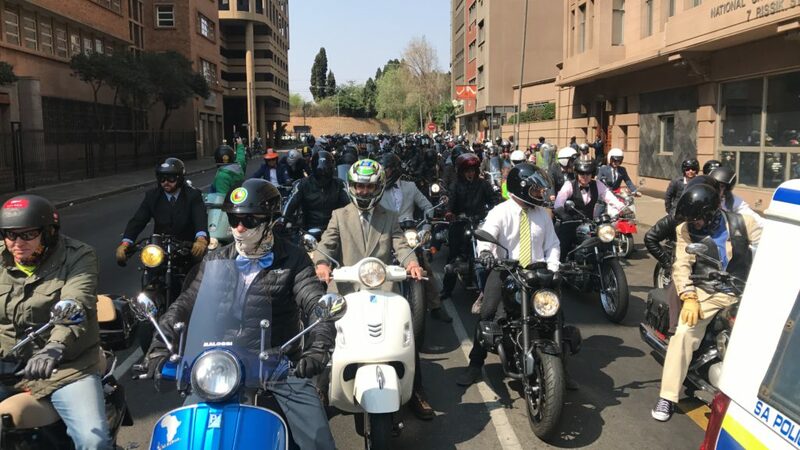 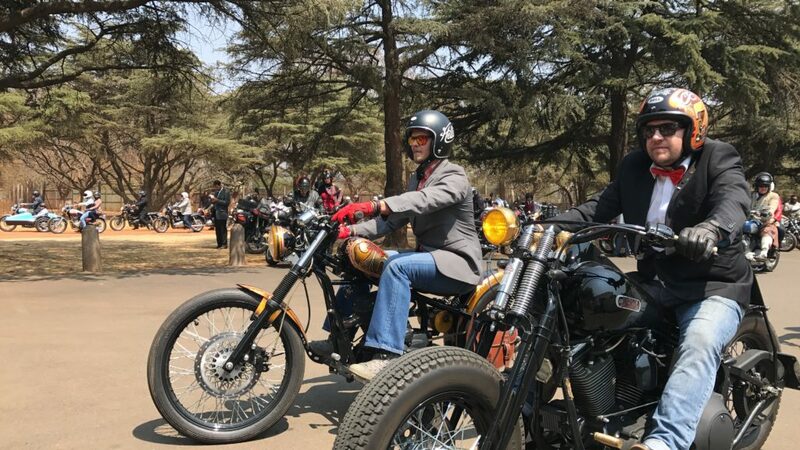 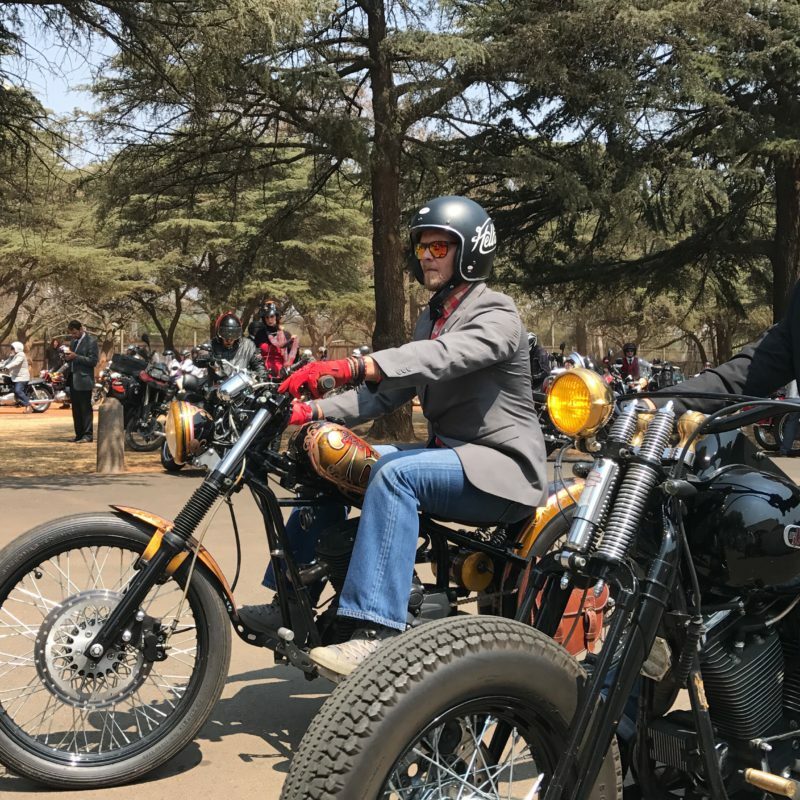 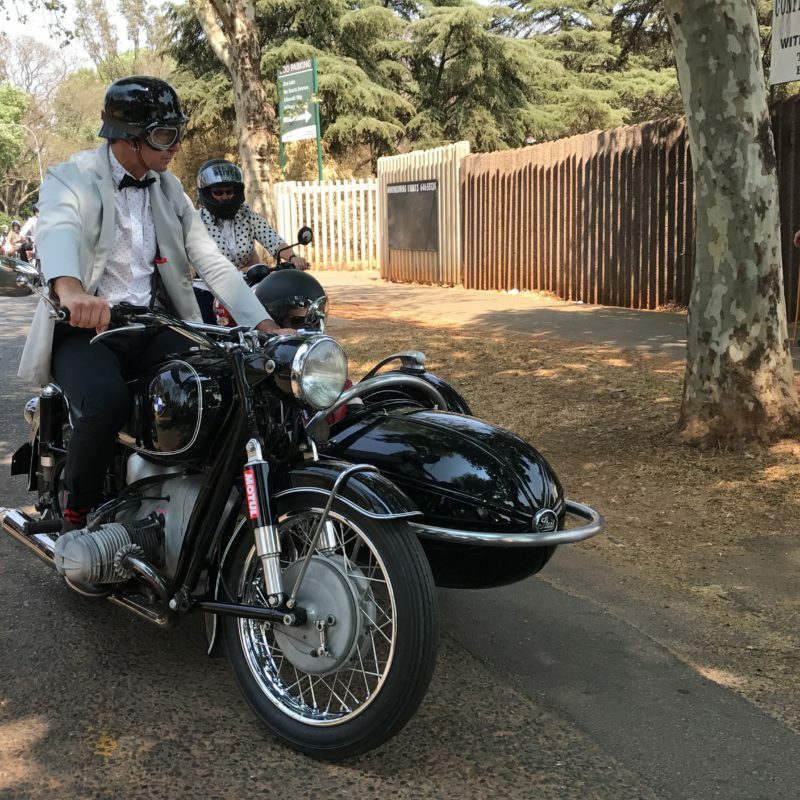 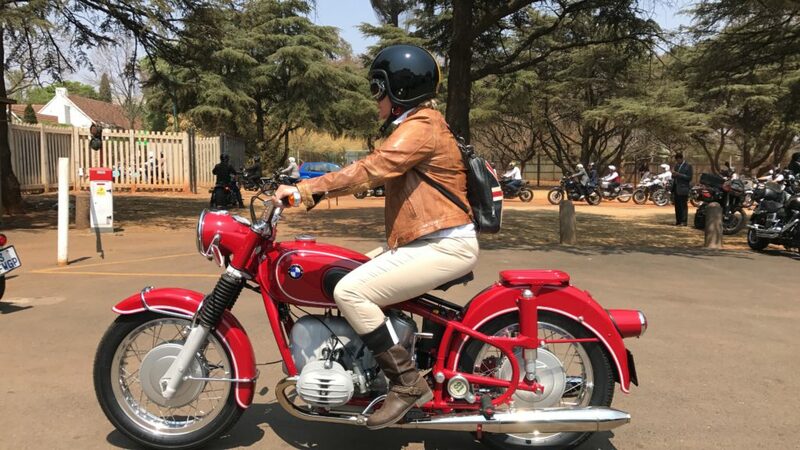 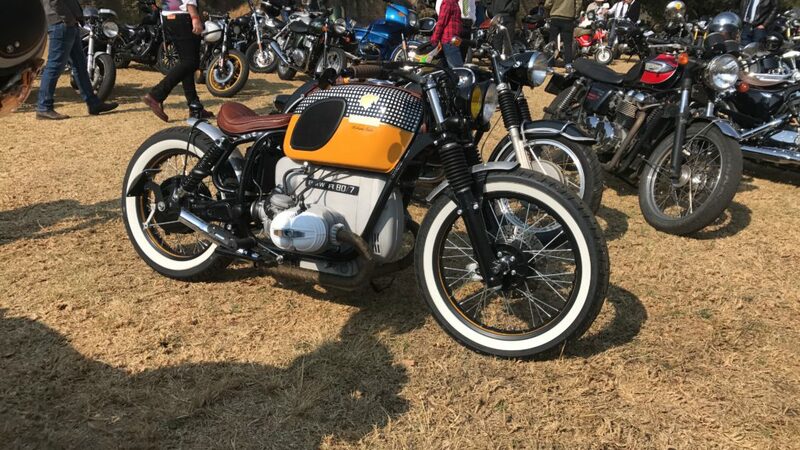 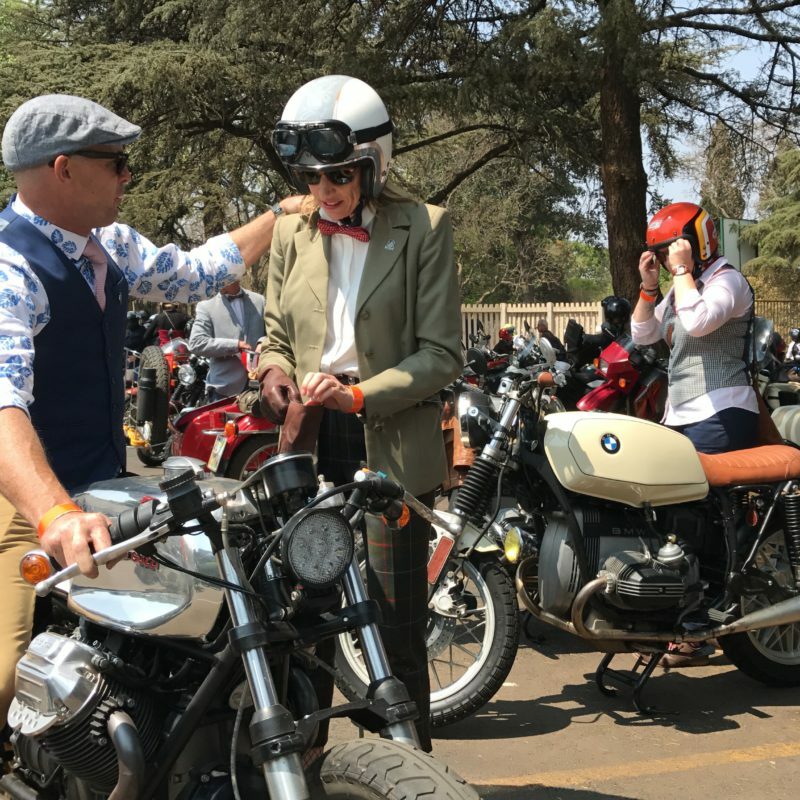 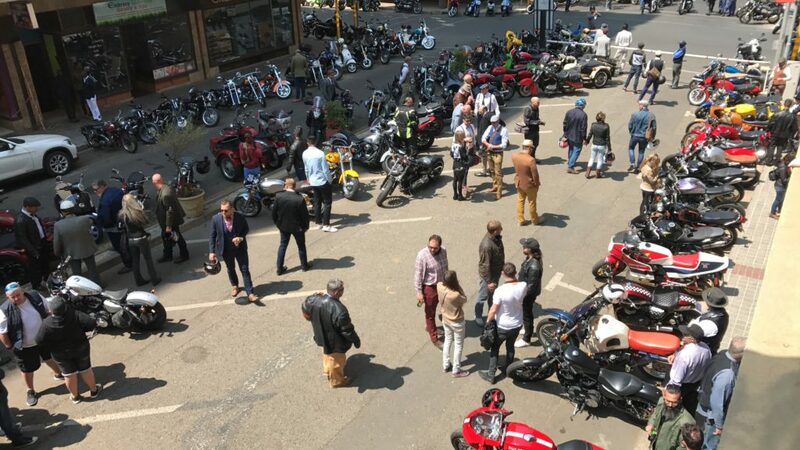 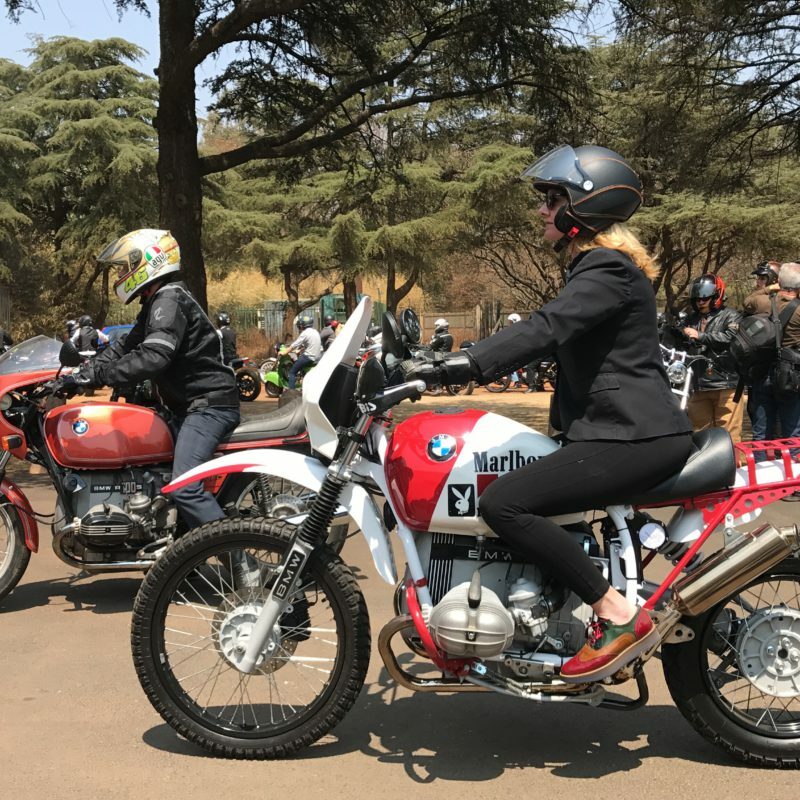 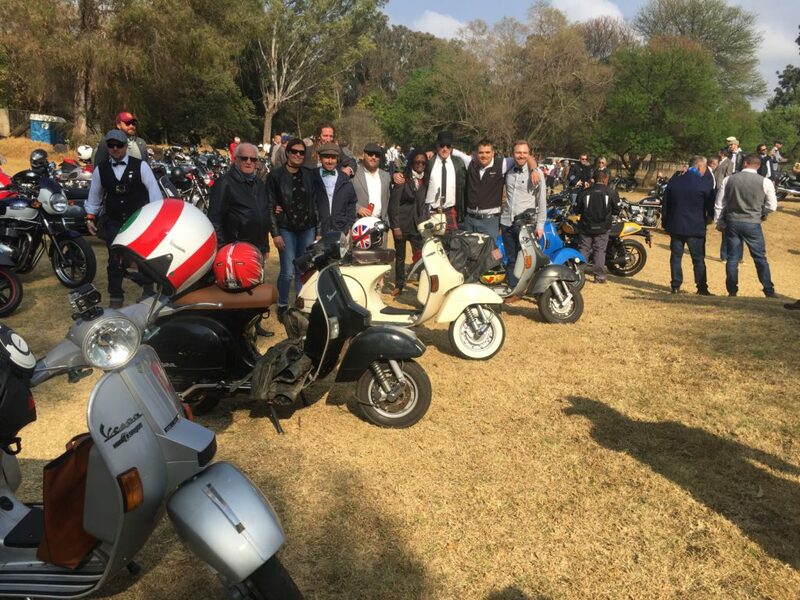 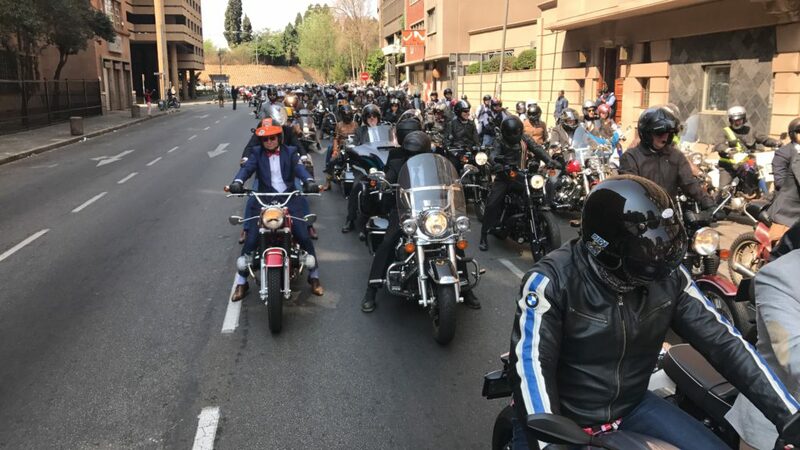 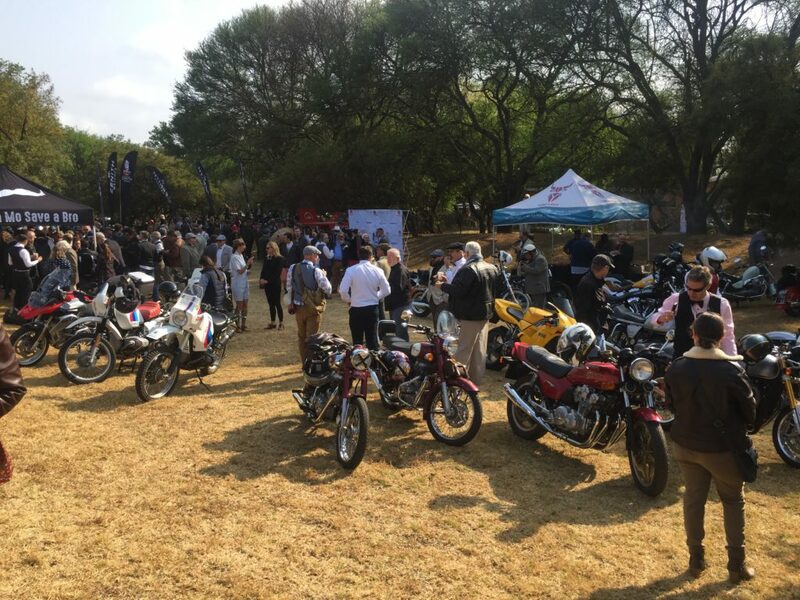 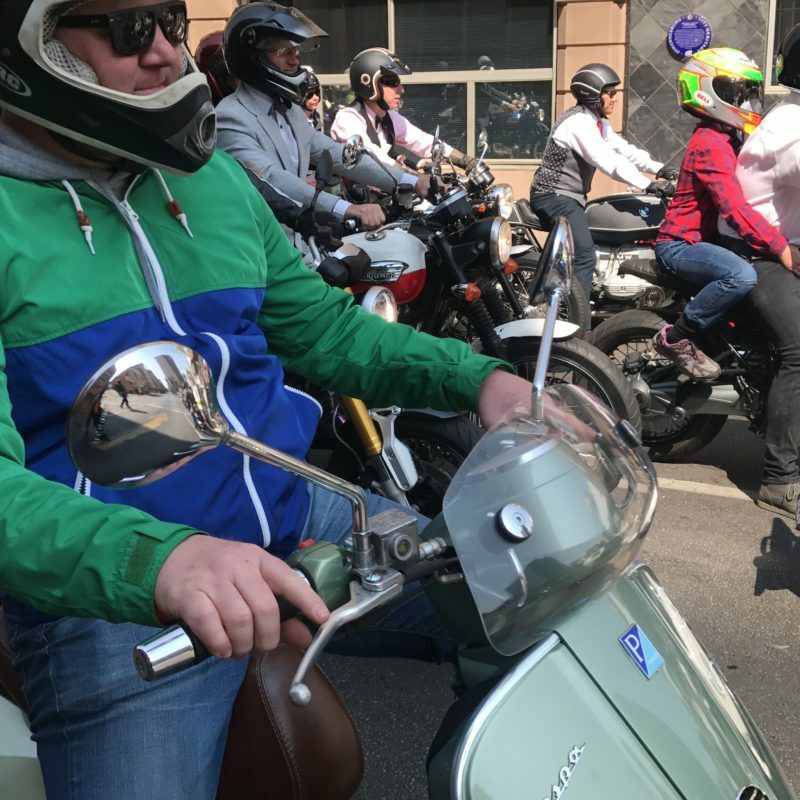 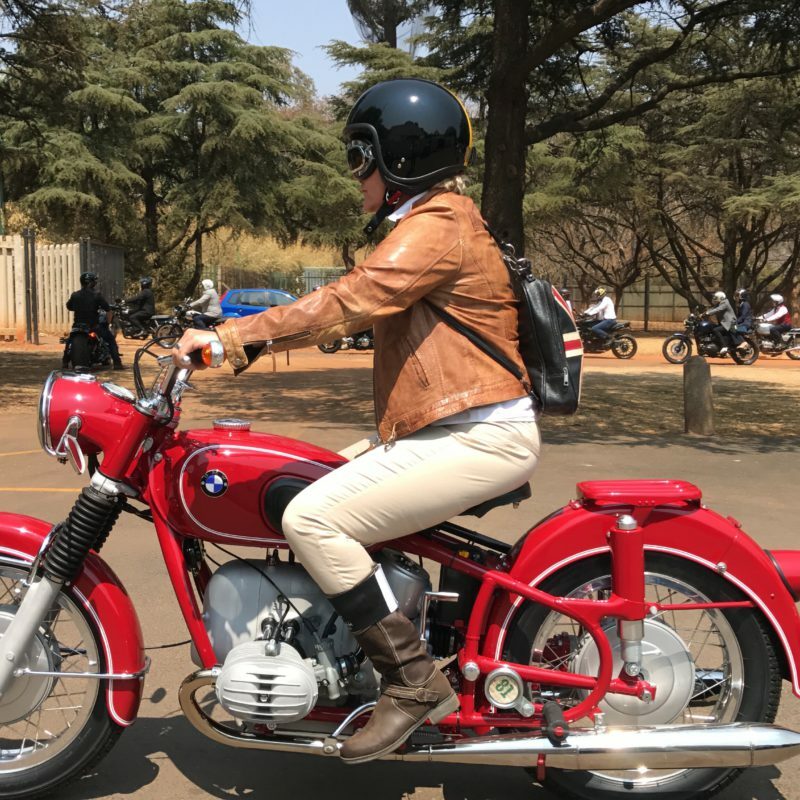 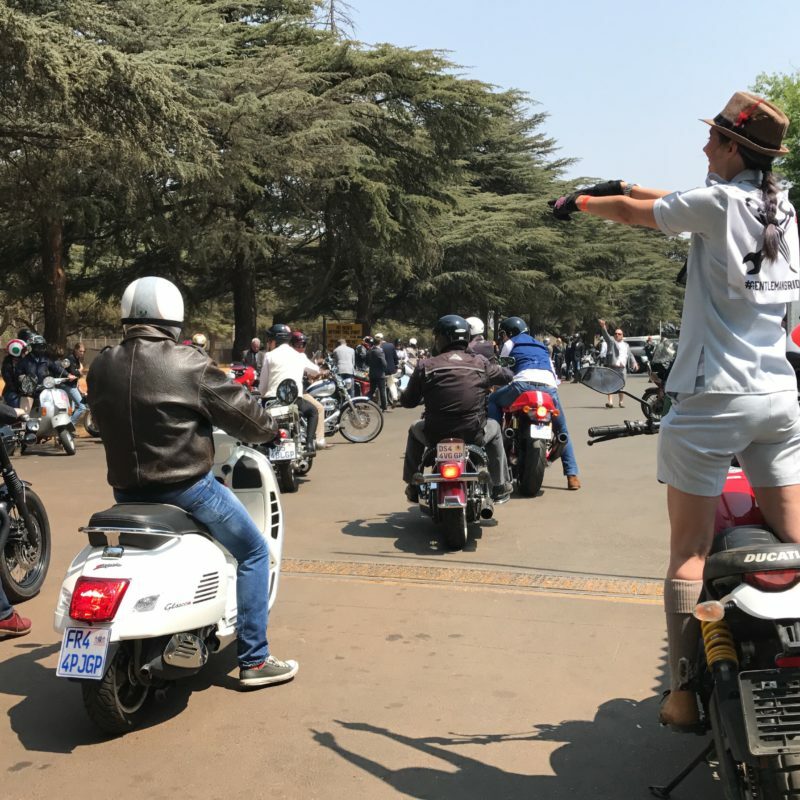 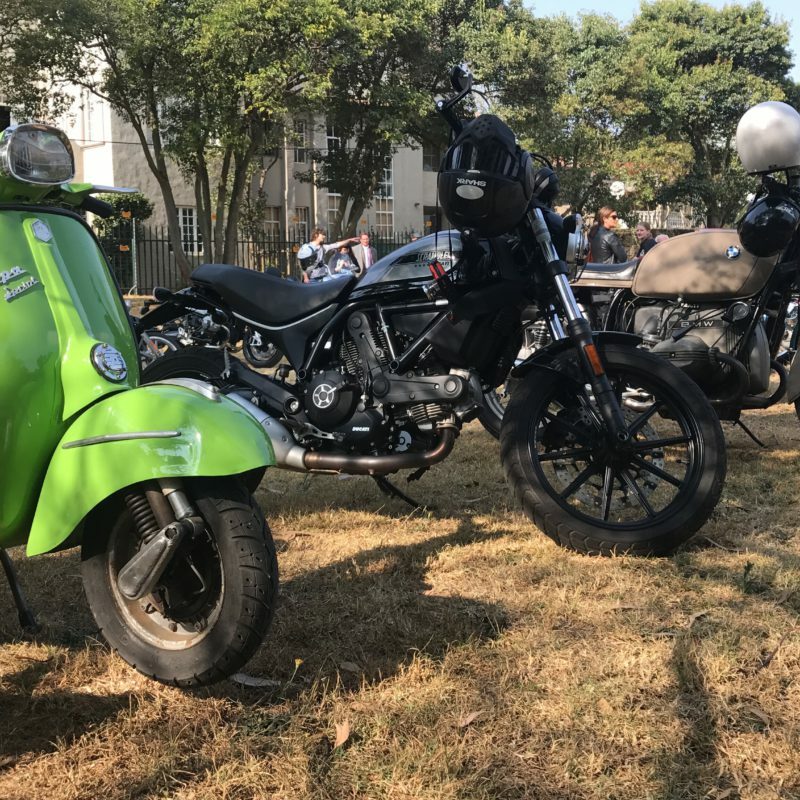 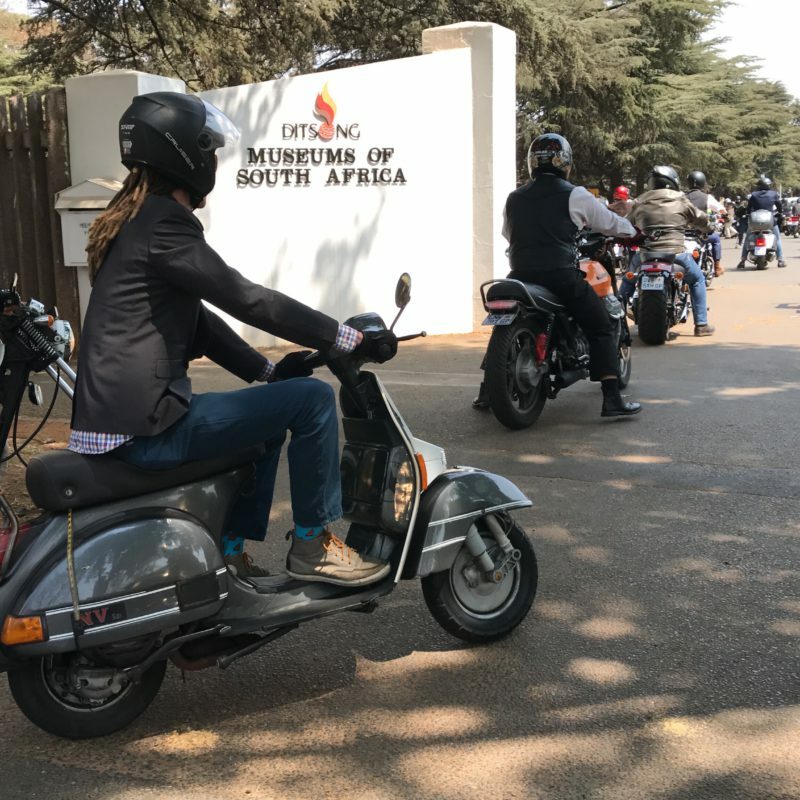 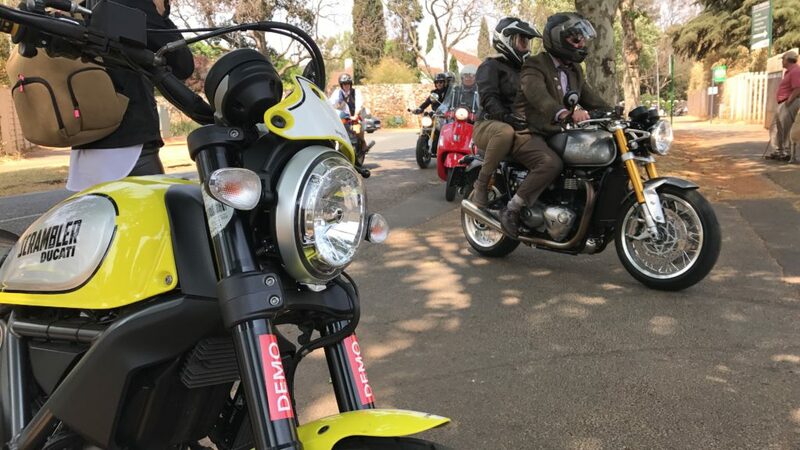 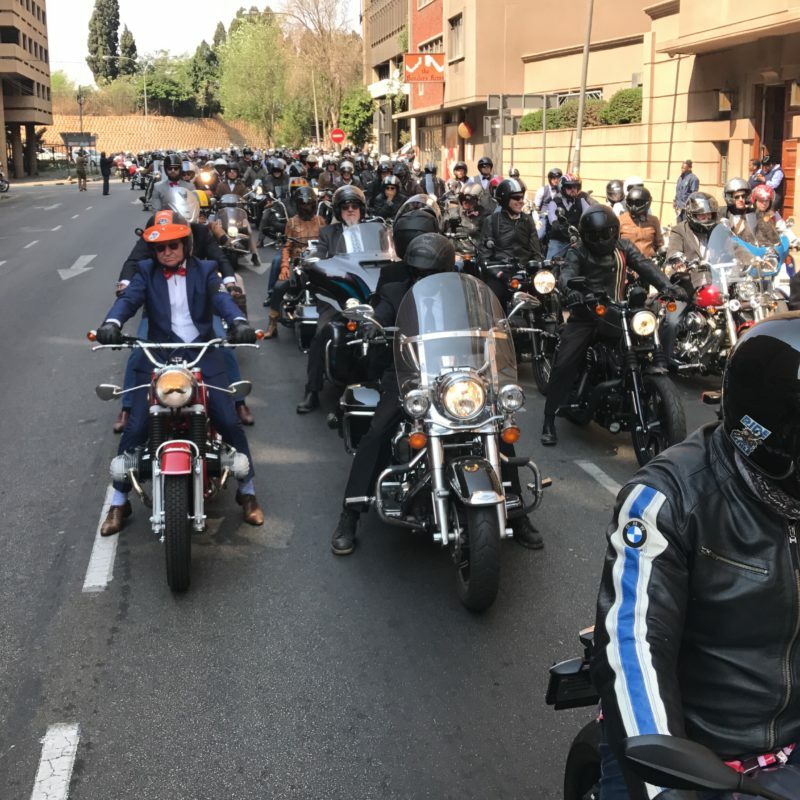 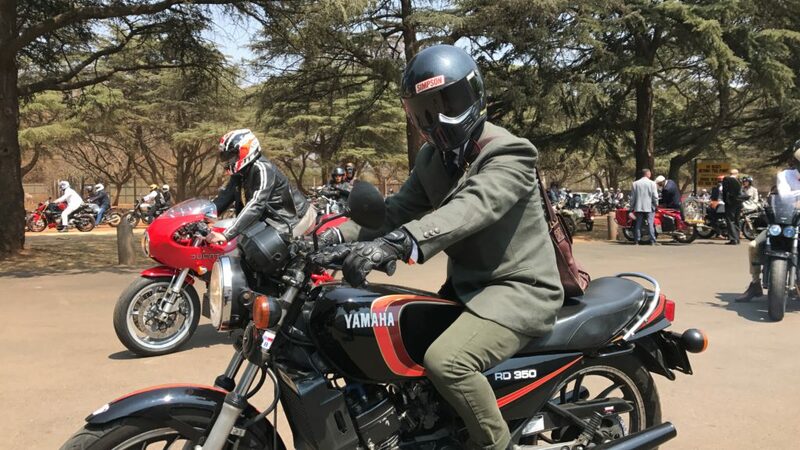 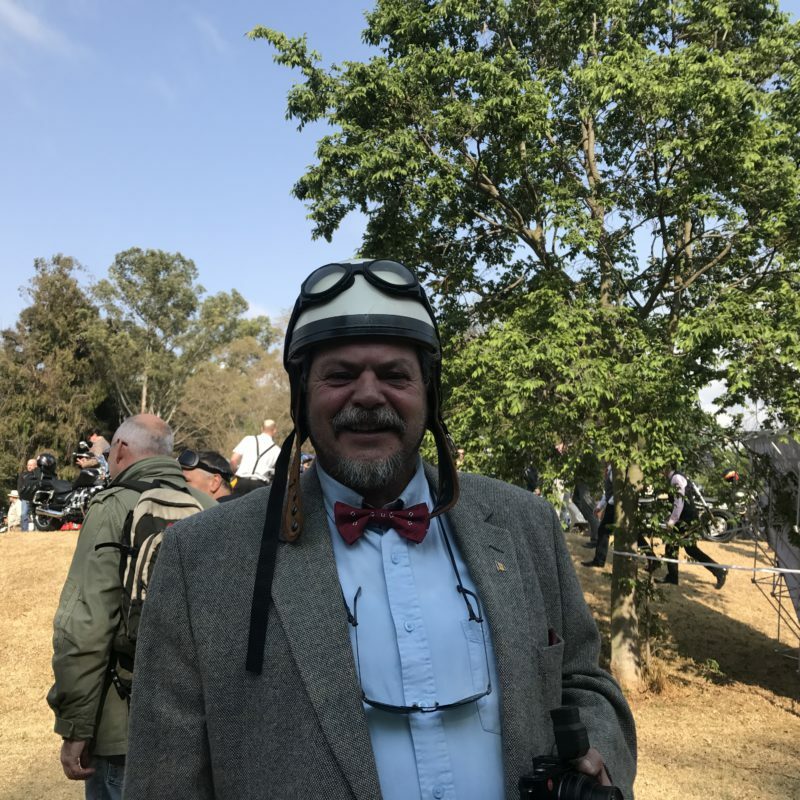 The group was one thing, the start was another – 500 riders at the Joburg event aboard classics, scooters, retros, sidecars, nakeds and one big, orange sports-tourer. 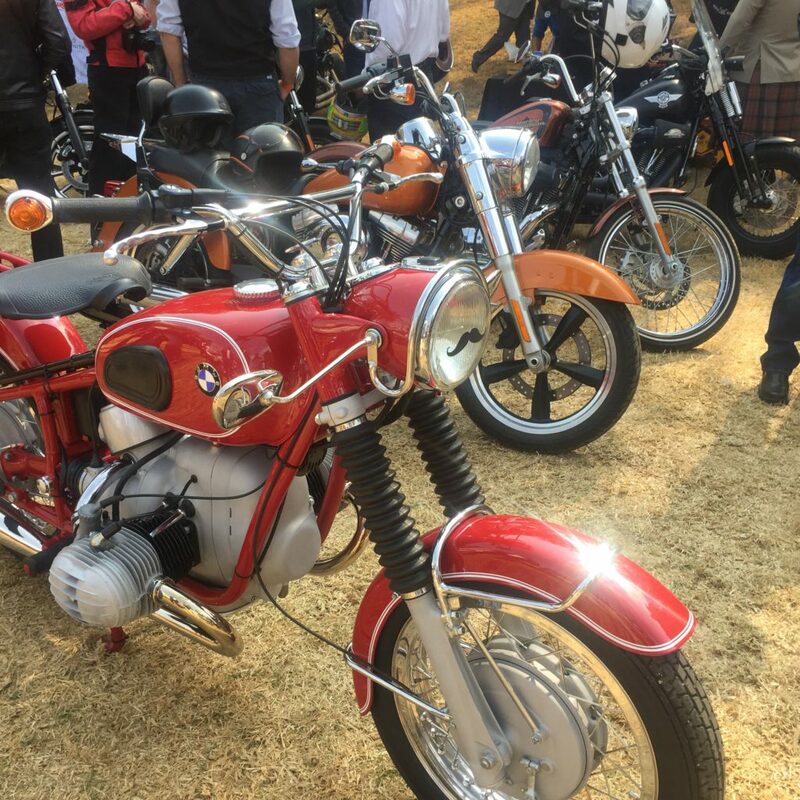 The rules say that bikes should be classic, vintage or retro-styled. 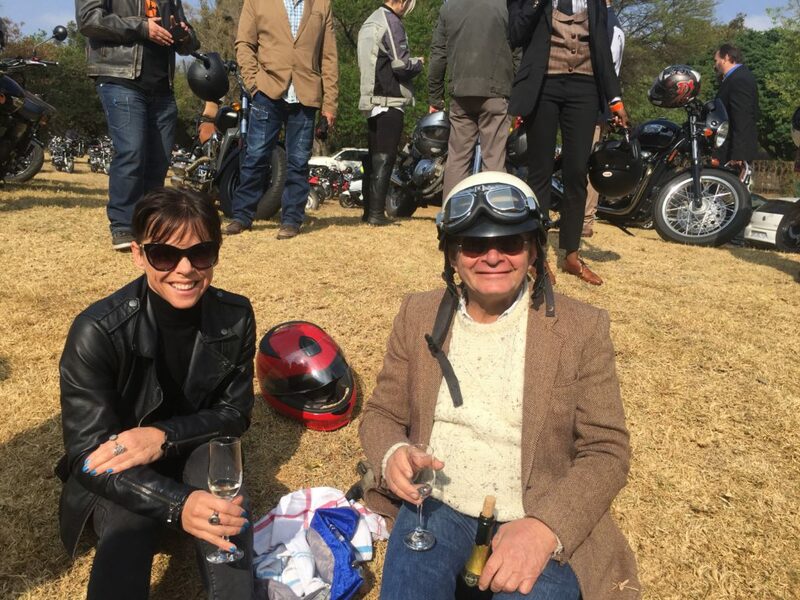 Of course, Harry Fisher pitched up on his long-termer KTM Super Duke GT because he has always been a bit of rebel. 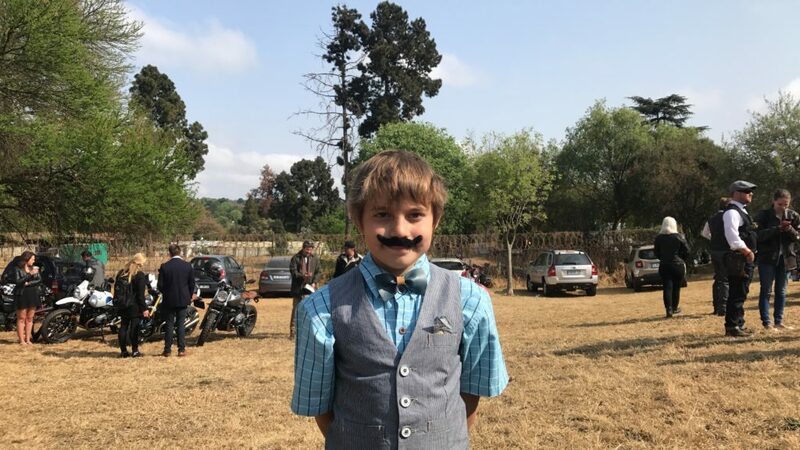 The fact that he was wearing old-fashioned clothing, we suspect, was a happy accident. 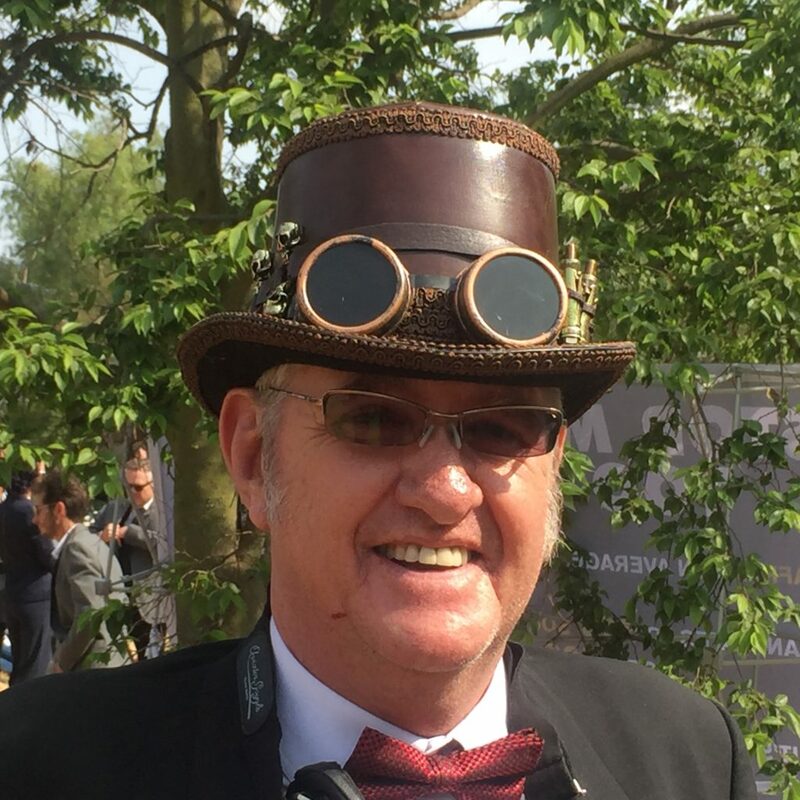 I, on the other hand, looked magnificent in my suspenders, bowtie and red hat. 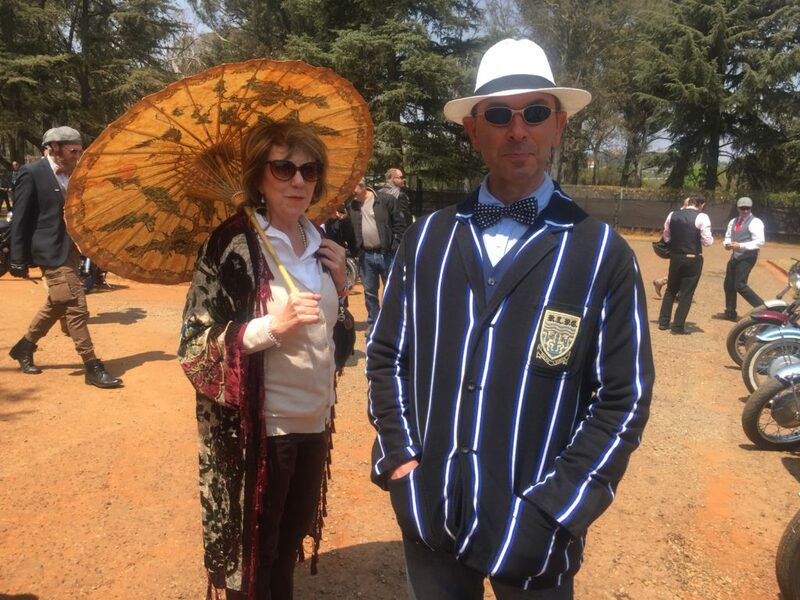 Many ladies agreed that I looked magnificent, right before they burst out laughing. 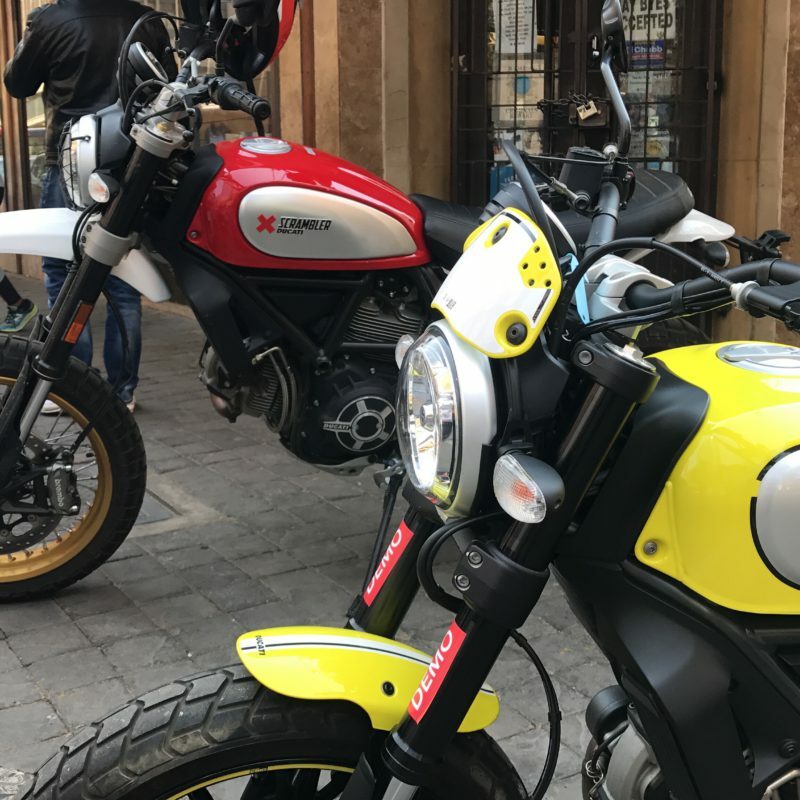 I did get the bike right – a Ducati Scrambler Flat Track Pro, the one on special for R119,ooo. 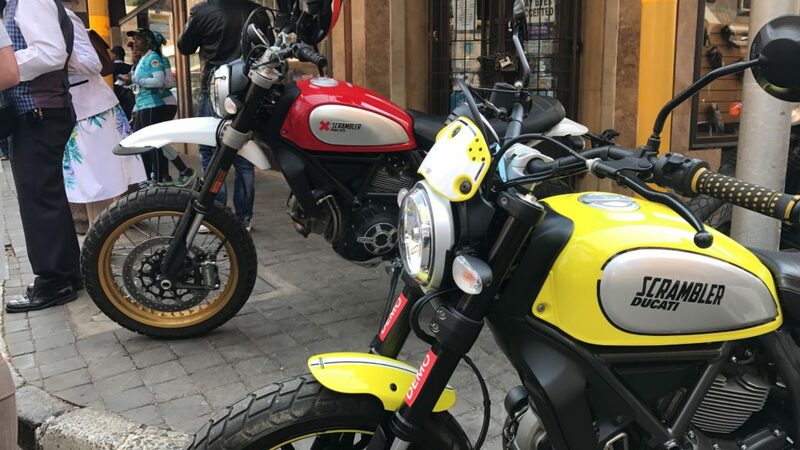 A short while ago, we did a story on three modern scramblers, and so the choice of bike was not difficult. 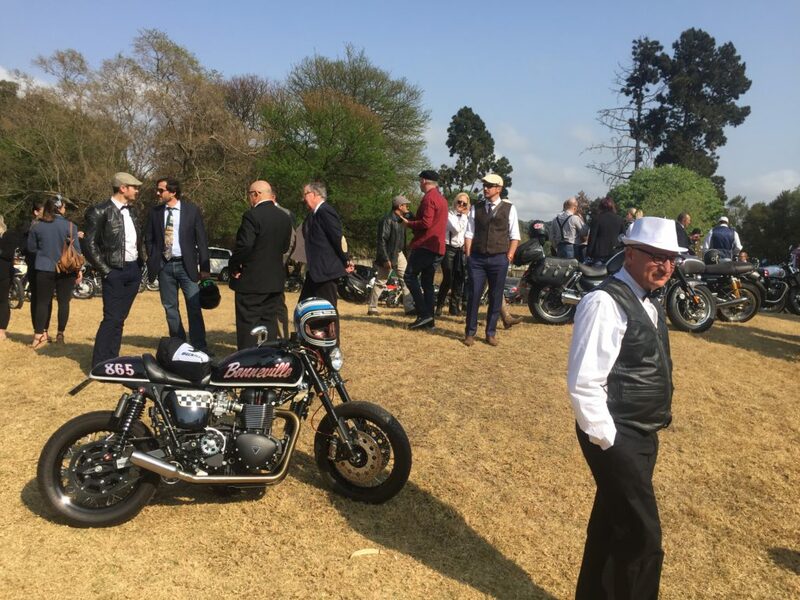 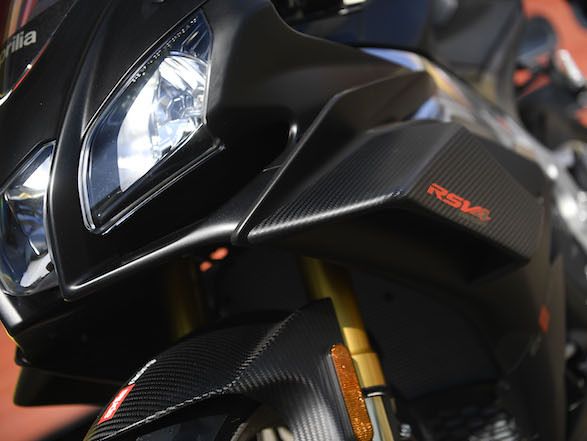 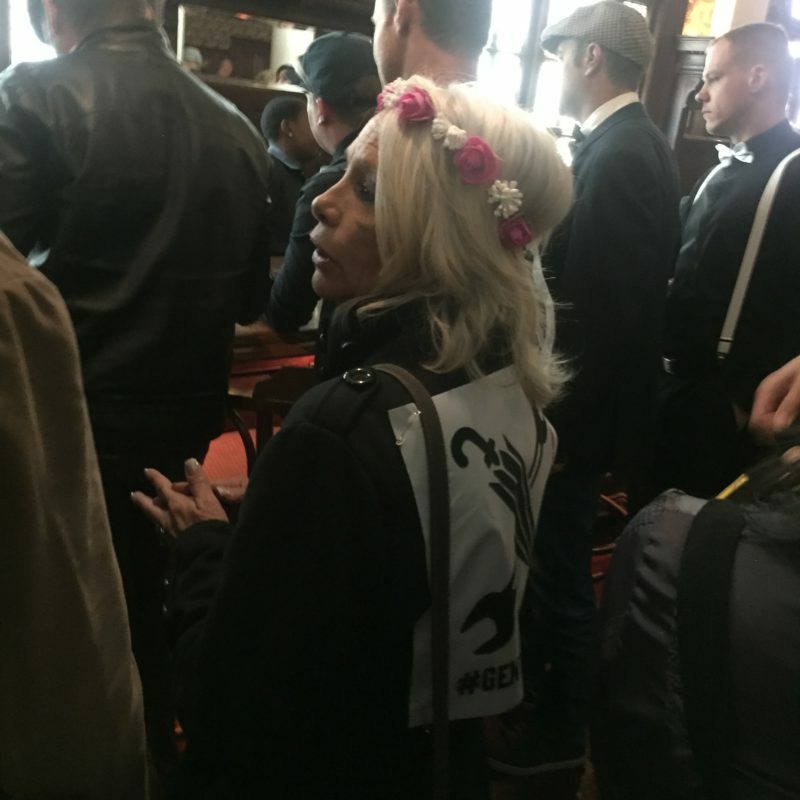 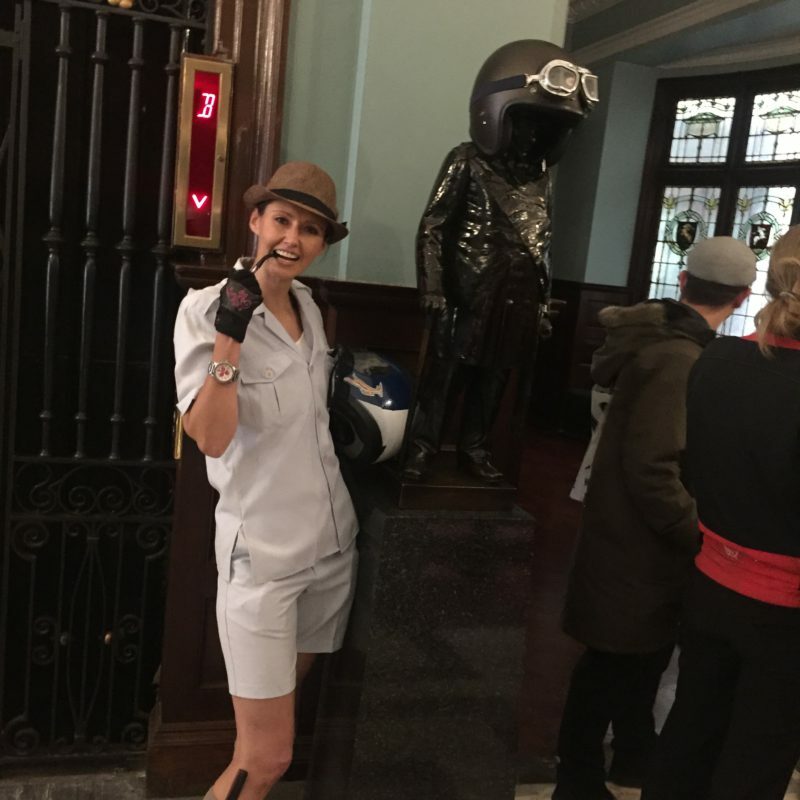 It not only has a retro style that suits the theme of DGR perfectly, but its small size and sporty agility meant zapping in and out of the mobile crowd to get footage was a right doddle. 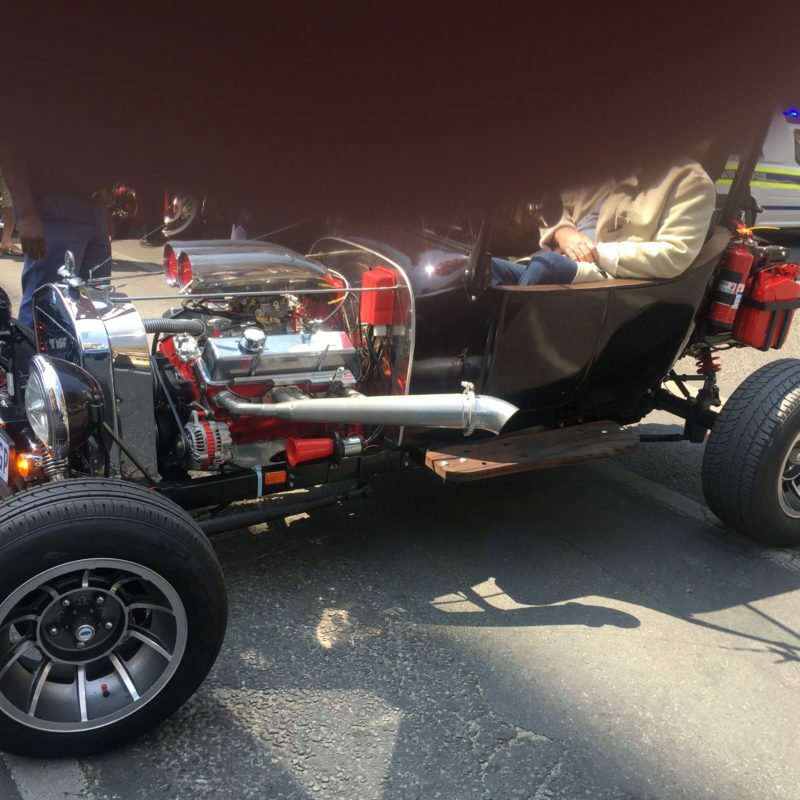 The motor is perky, it’s comfortable and it looks damn good. 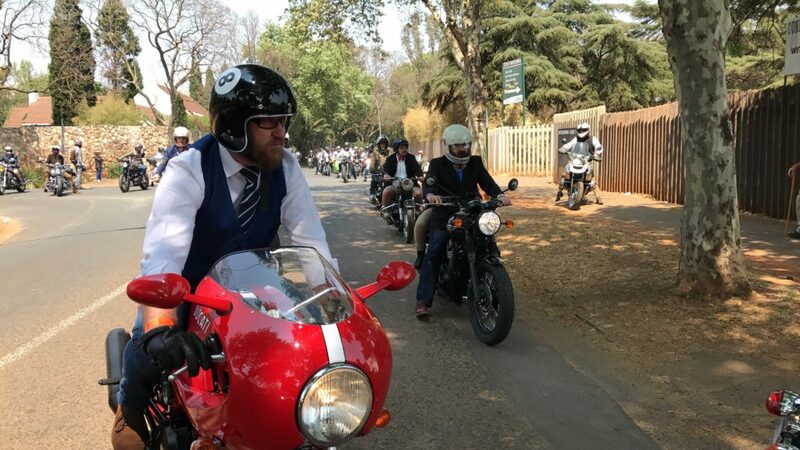 Even the unjustifiably smug rider in his funny bowtie couldn’t ruin it. The Jo’burg DGR group at the Military Museum. 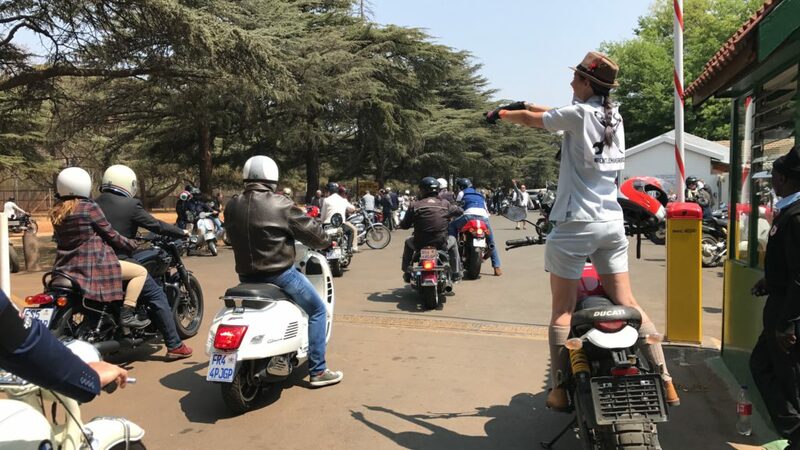 By the time we left, the clouds had realised that they weren’t deterring anyone and buggered off, so the rest of the ride was in glorious sunshine. 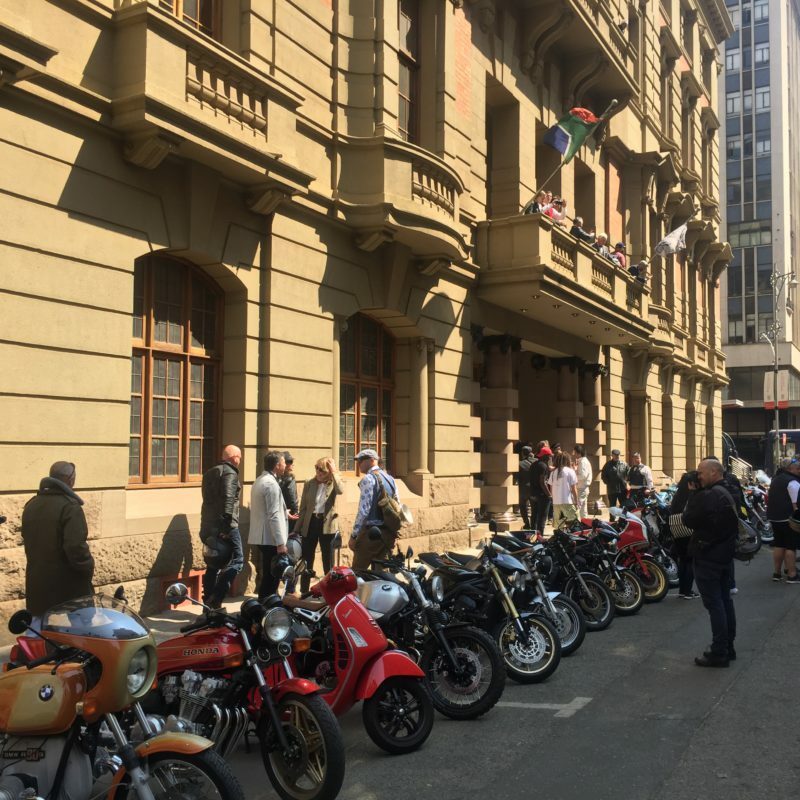 From VVC, the kilometer-long stretch of debonaire glamour chugged its way along to the Rand Club in Jo’burg CBD, the oldest private members’ club in the country having been founded in 1887, just one year after Jo’burg itself. 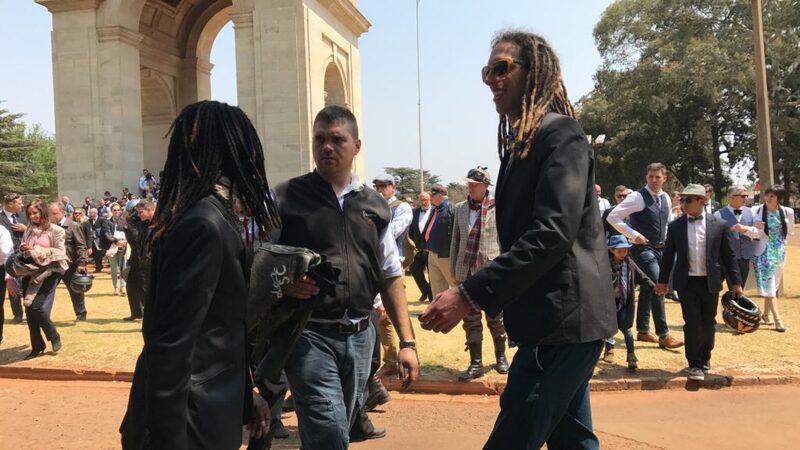 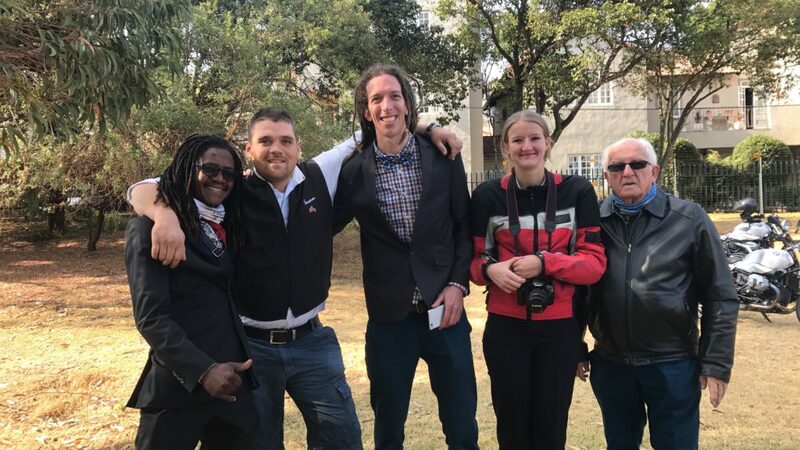 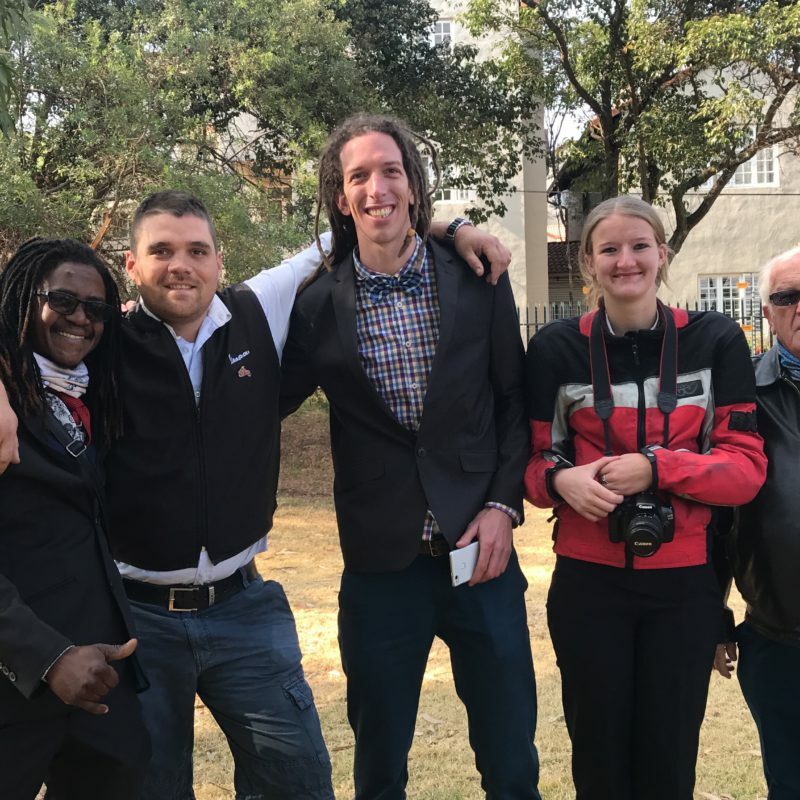 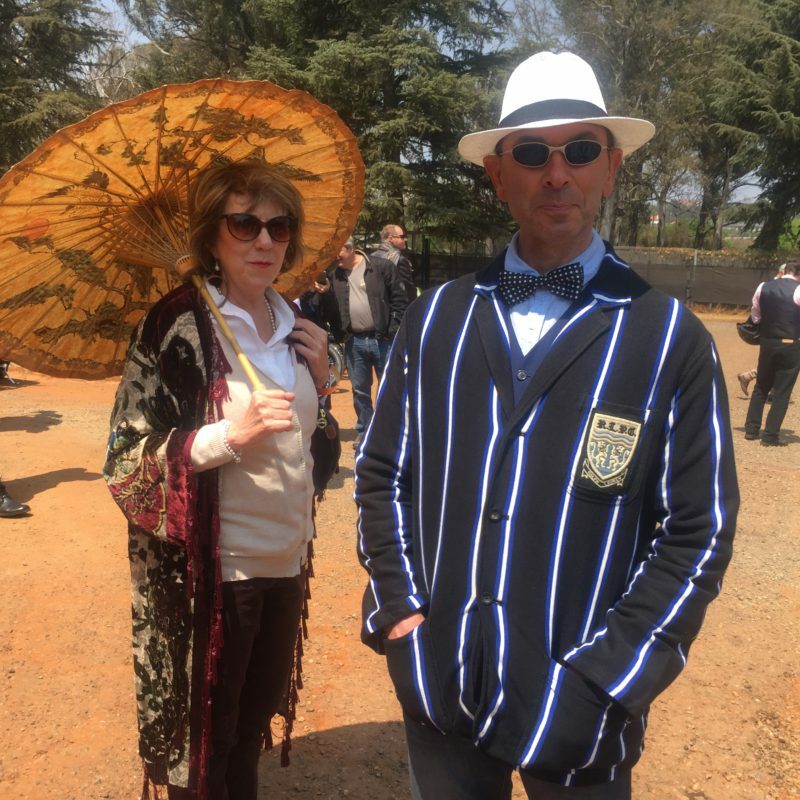 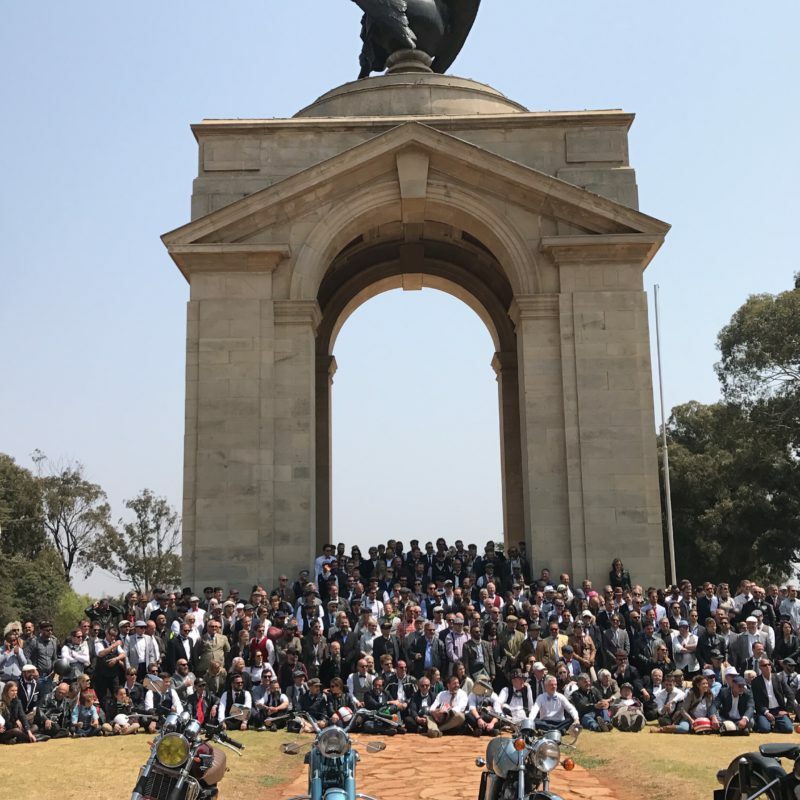 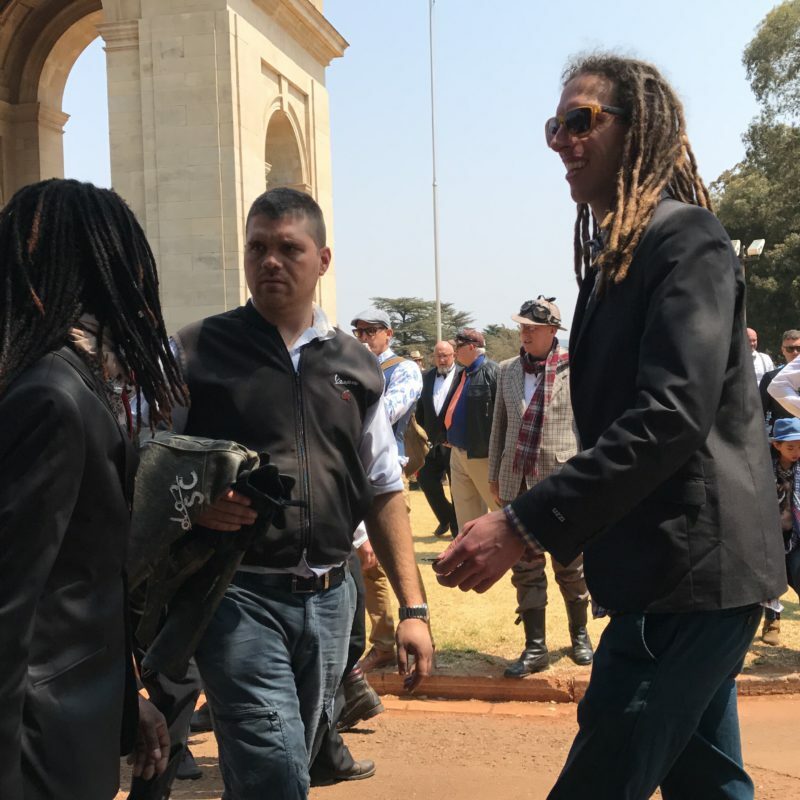 After a drink and a chinwag, the group set off to the South African National Museum of Military History for a group shot at the Boer War Memorial before setting off to the final destination at Melrose Arch. 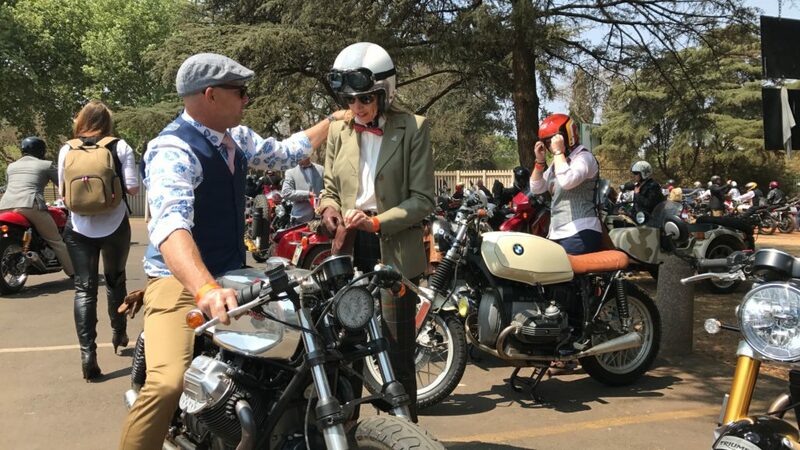 This is the sixth year of DGR, and it gets bigger and more entertaining every time. 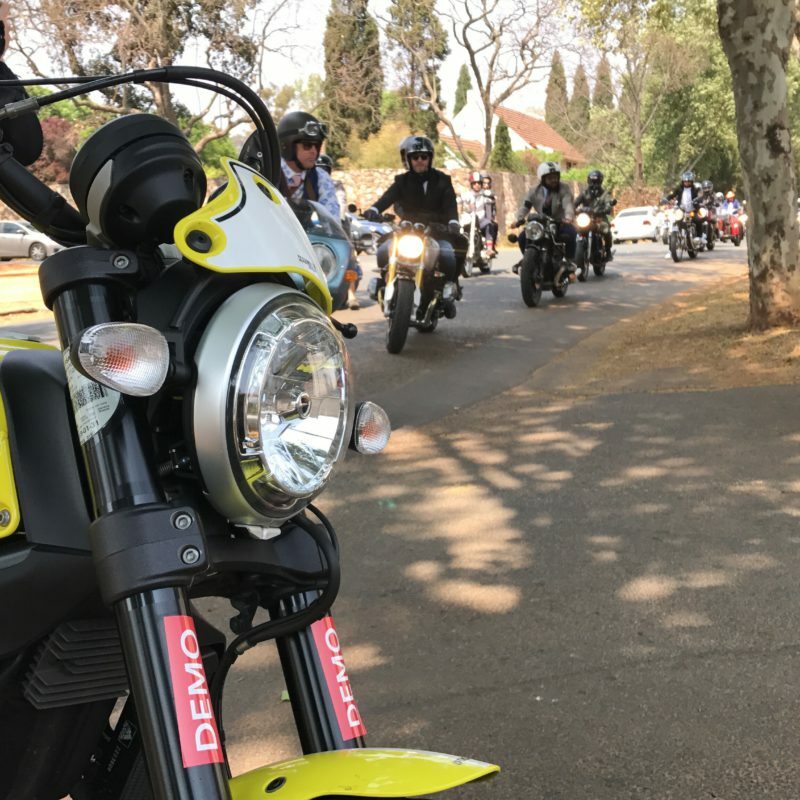 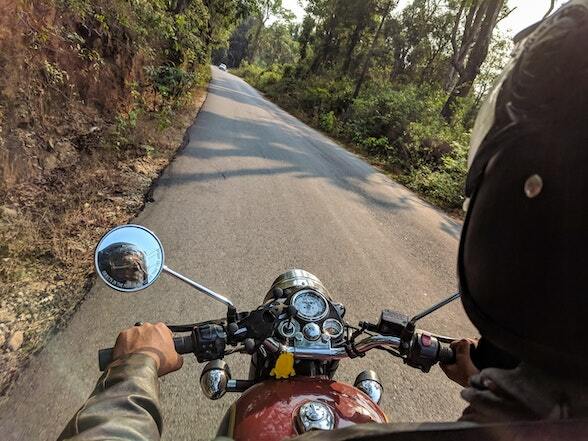 The Ducati Scrambler was superb, the organisation was superb – with a gaggle of marshals keeping traffic at bay and the group moving in the right direction – and a gang of people who enjoy a Sunday of dressing up and riding interesting motorcycles, especially for a good cause, is one that you want to be part of. 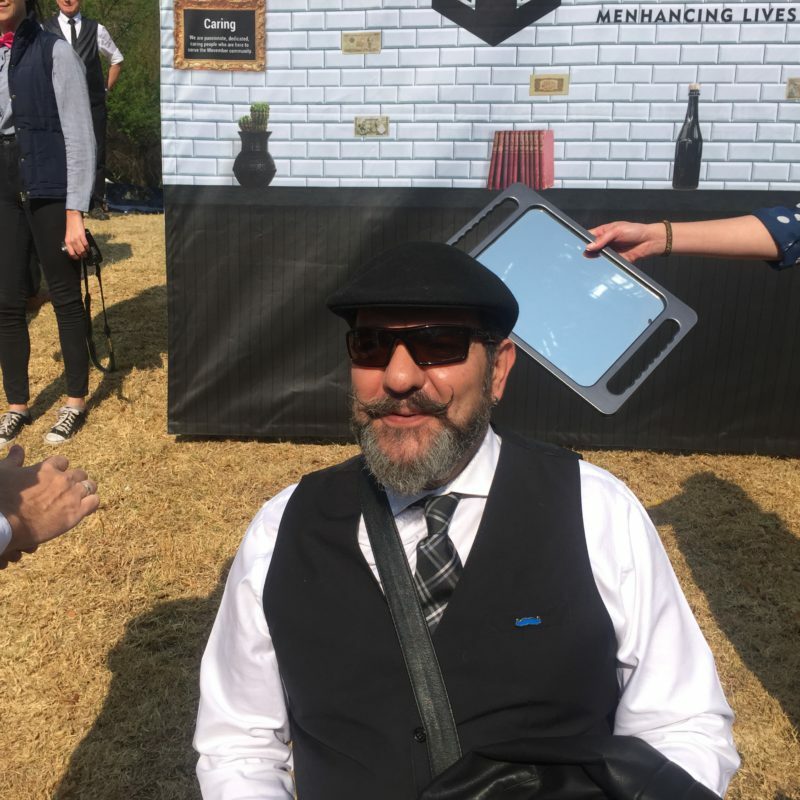 Manny from the Radium Beer Hall. 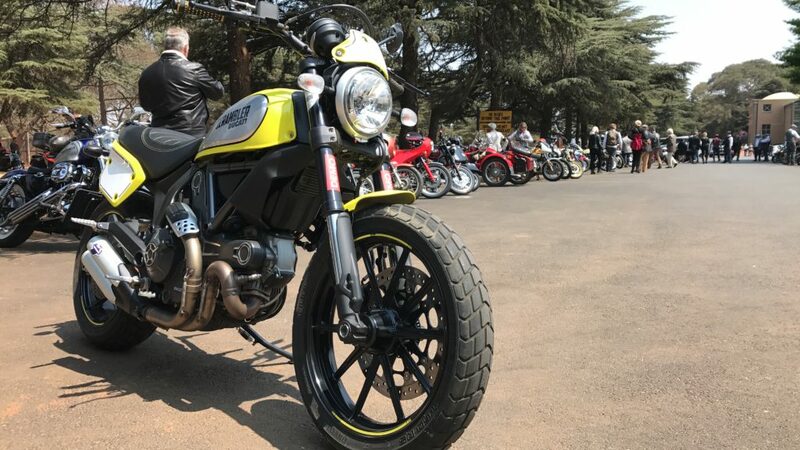 Donovan’s Ducati Srambler Flat Track Pro with Skinny’s Desert Sled.